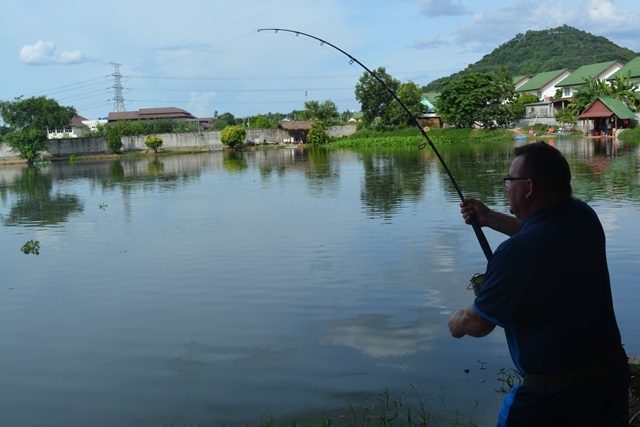 Fishing legend and regular John Wilson was back at Palm Tree for another session and also giving the new Masterline Monster Tamer rods a test run. 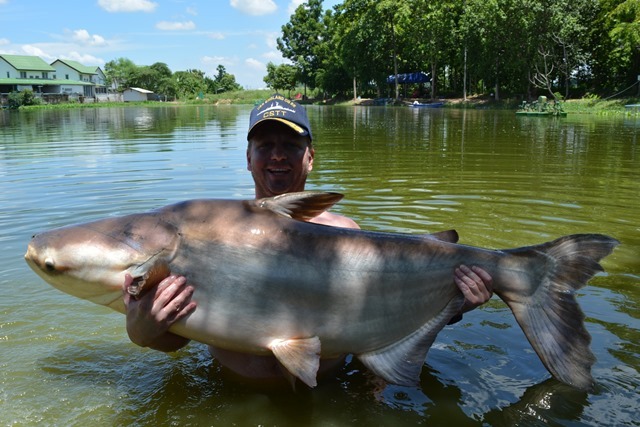 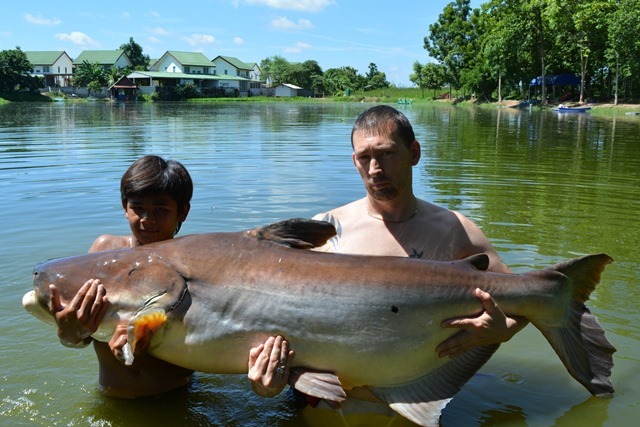 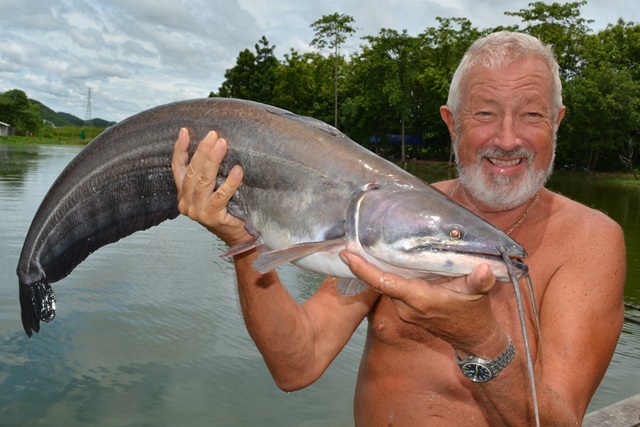 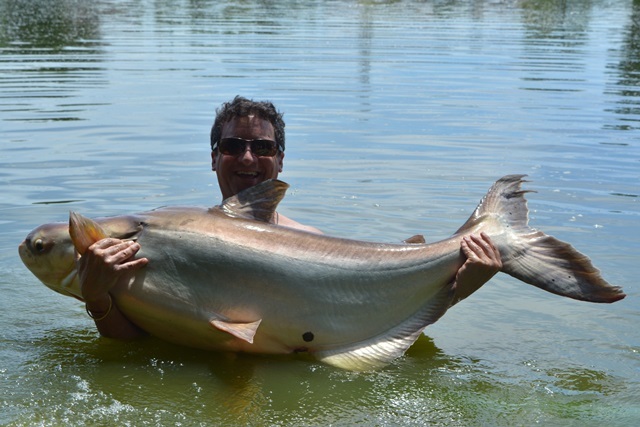 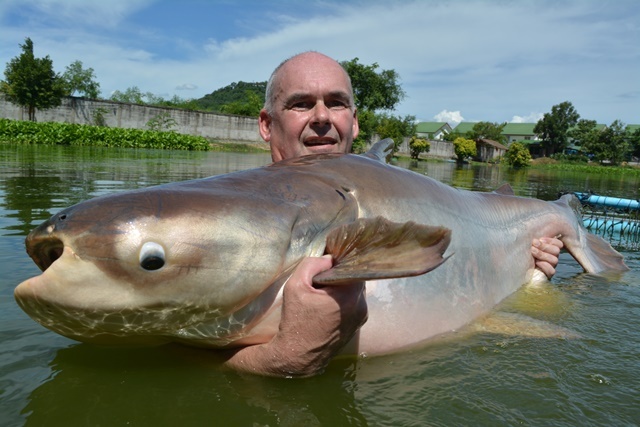 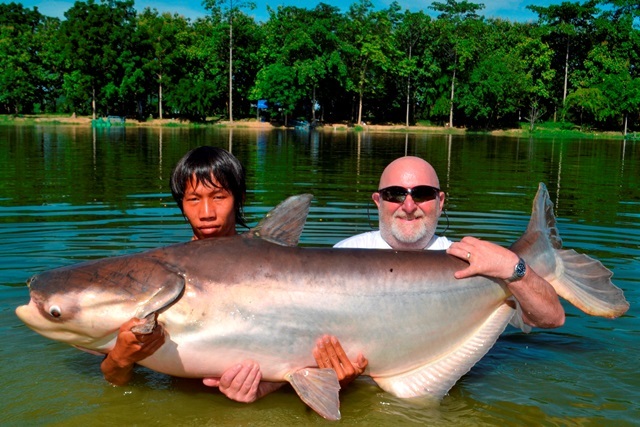 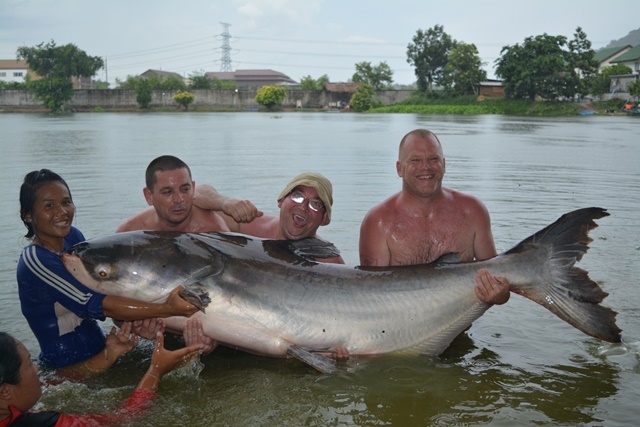 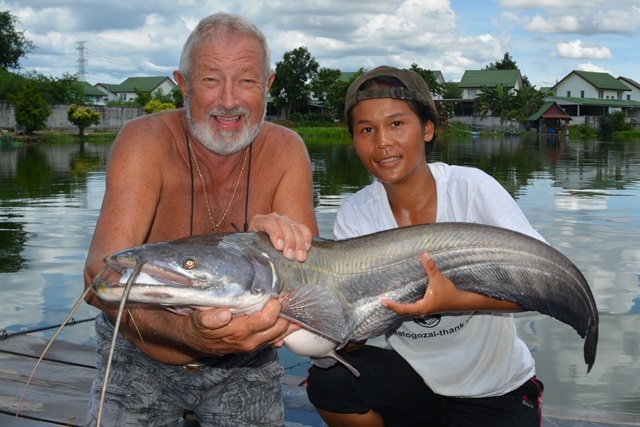 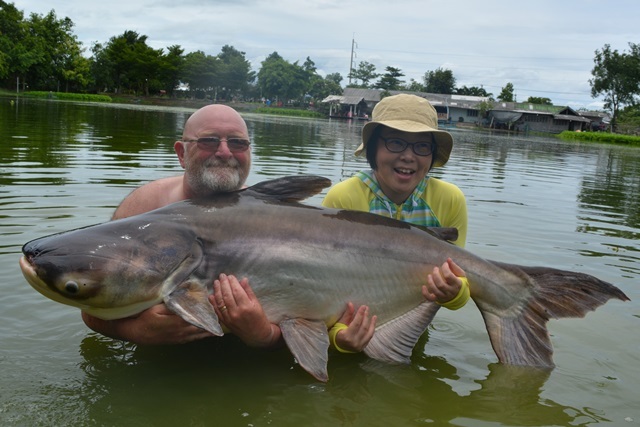 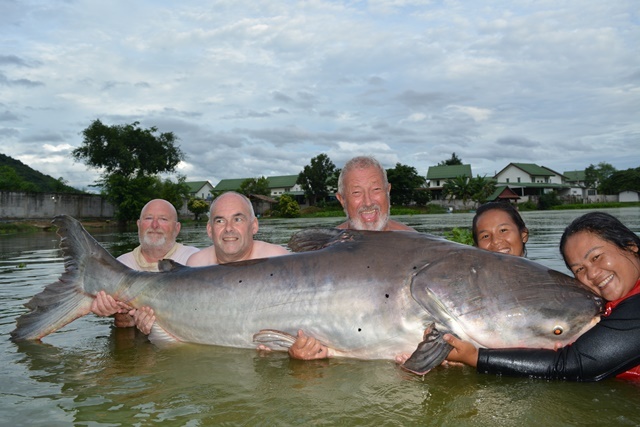 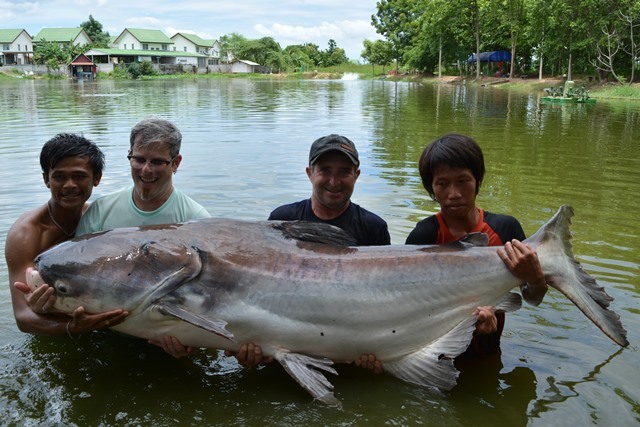 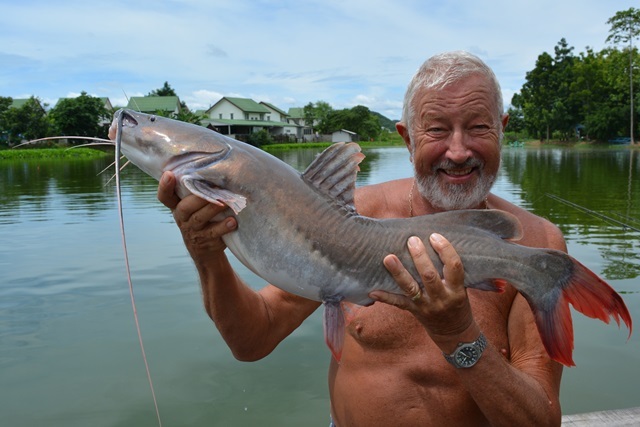 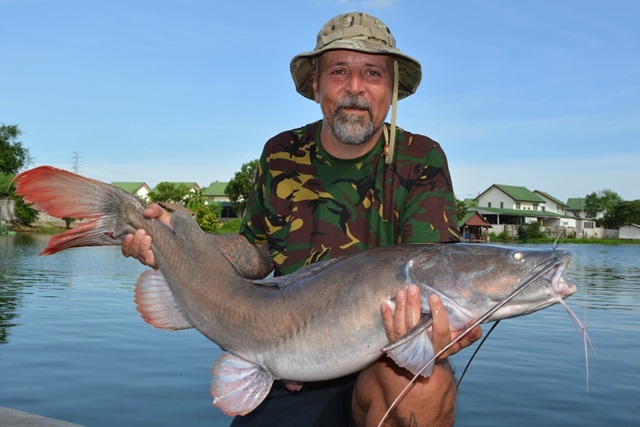 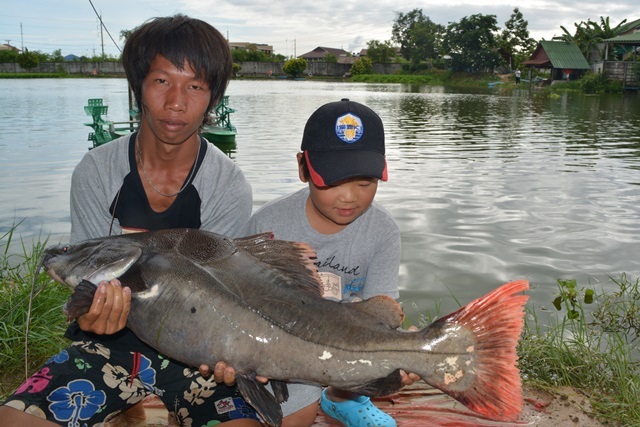 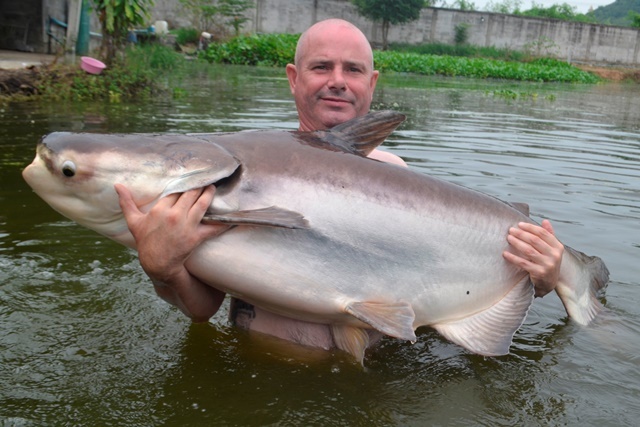 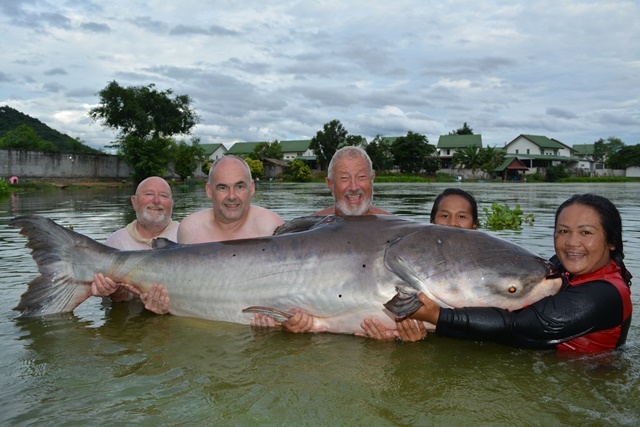 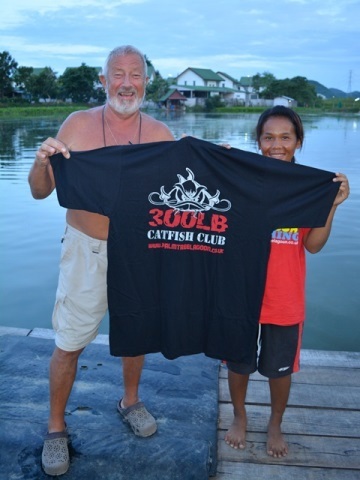 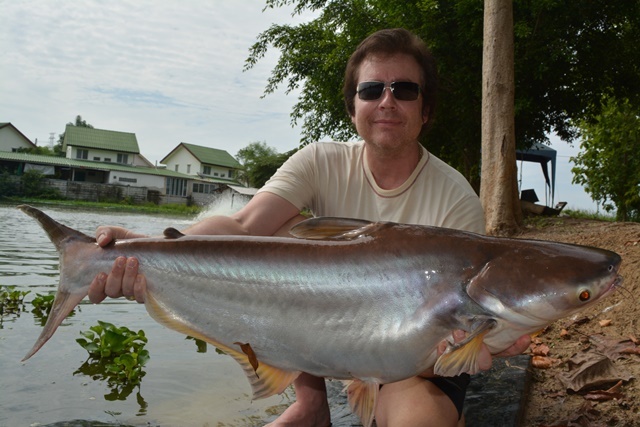 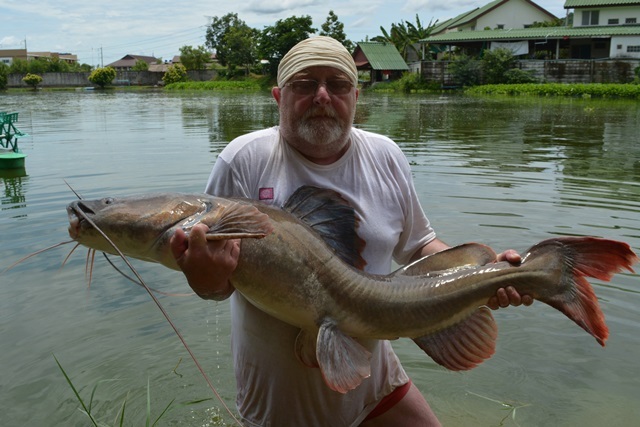 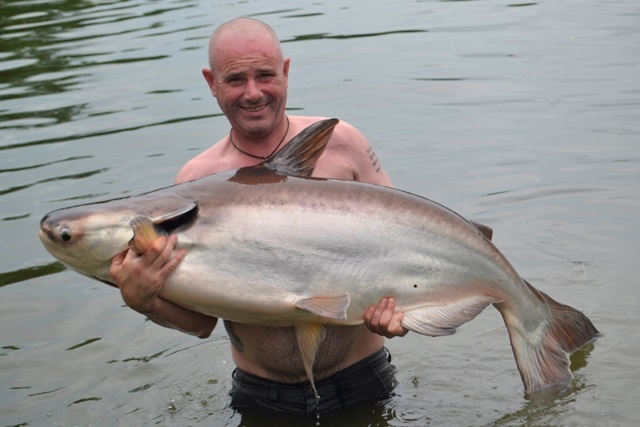 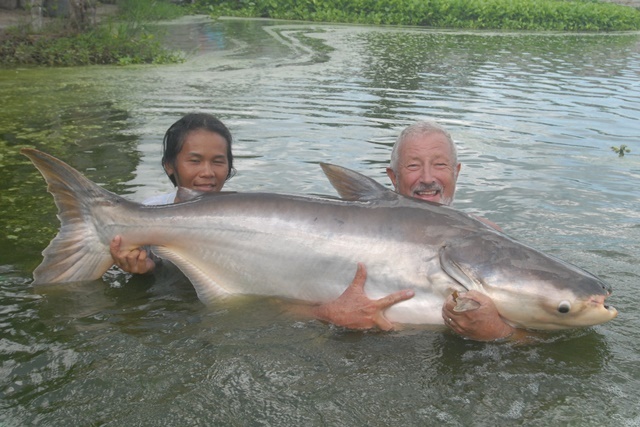 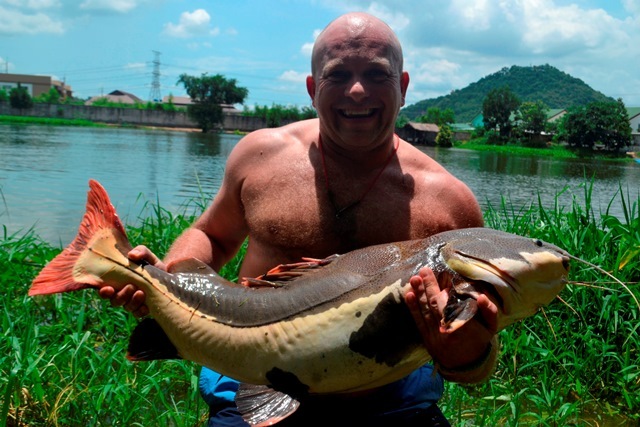 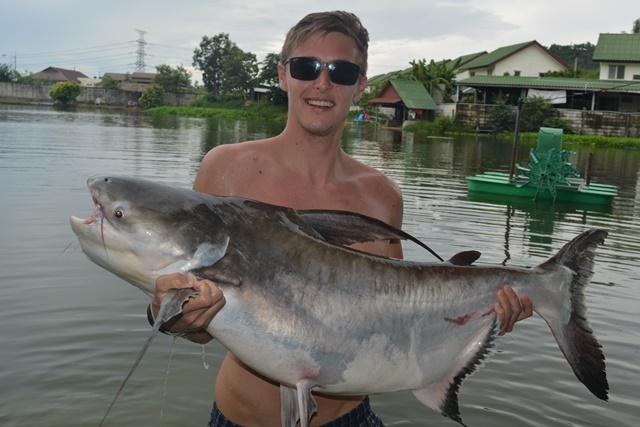 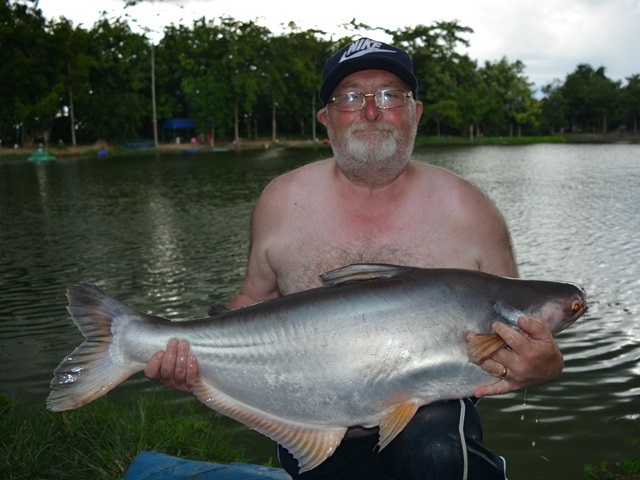 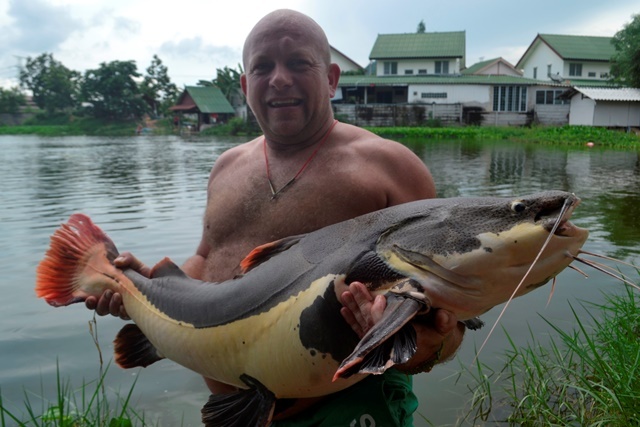 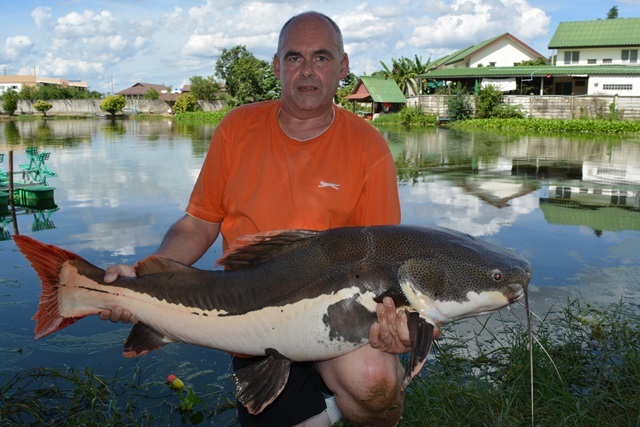 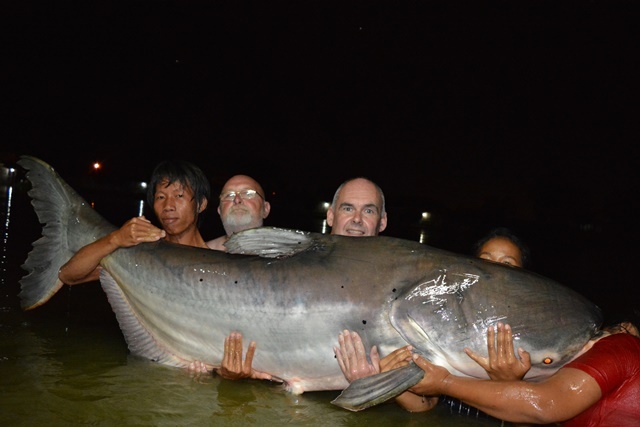 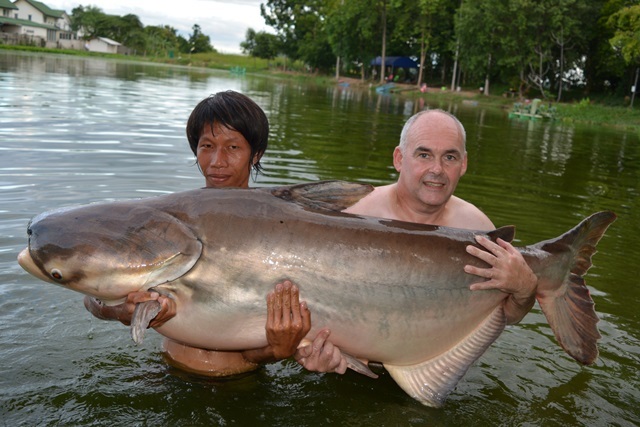 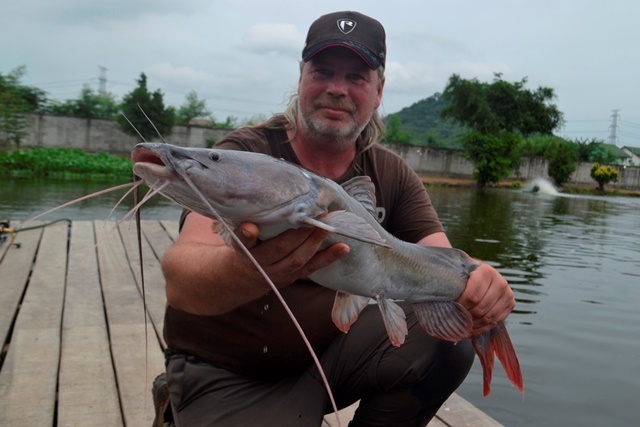 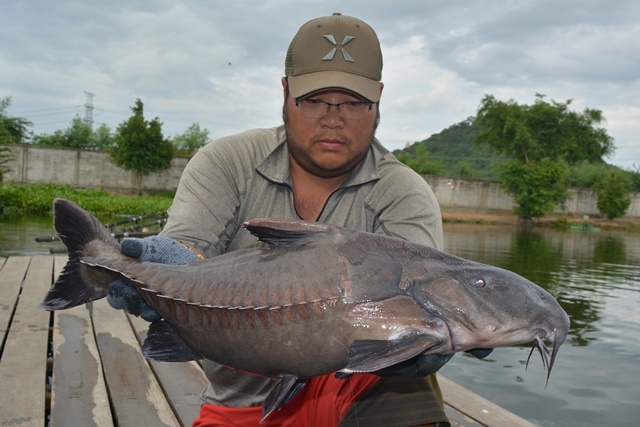 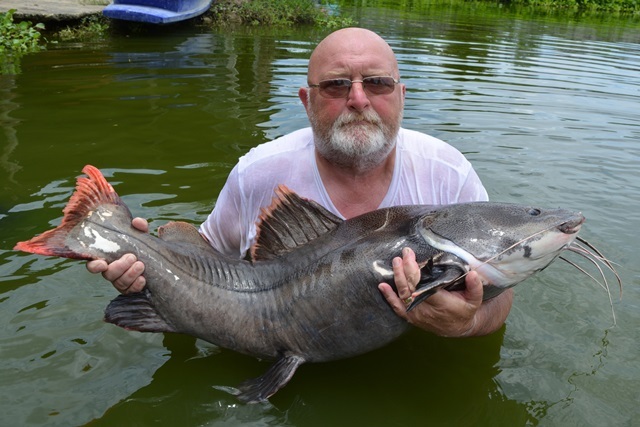 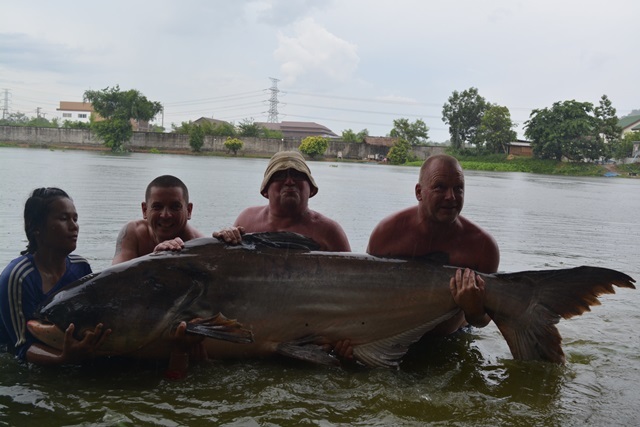 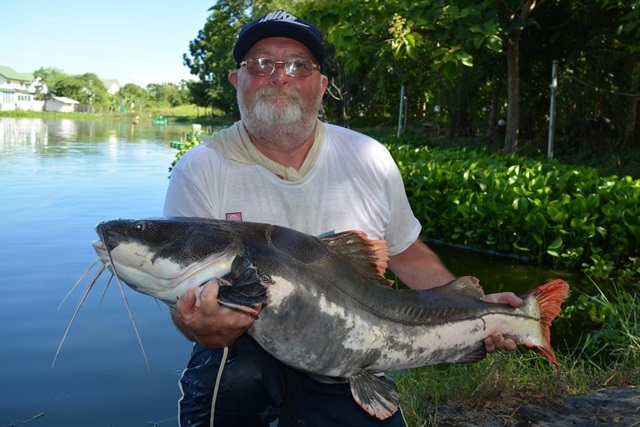 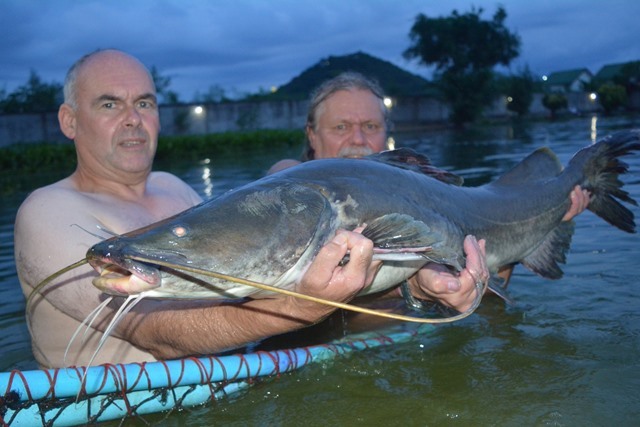 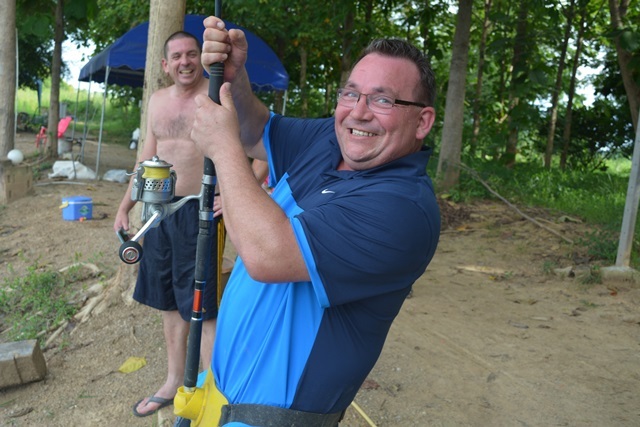 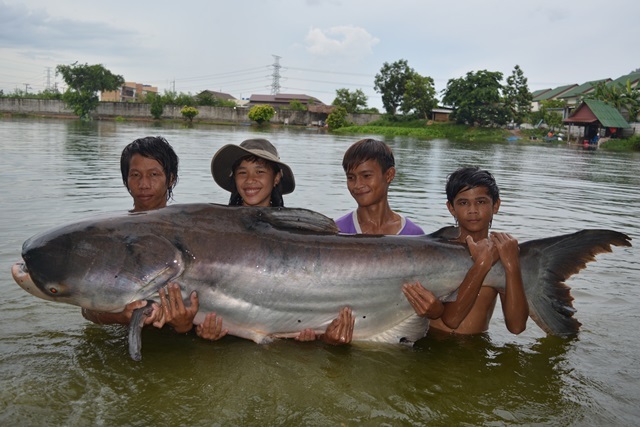 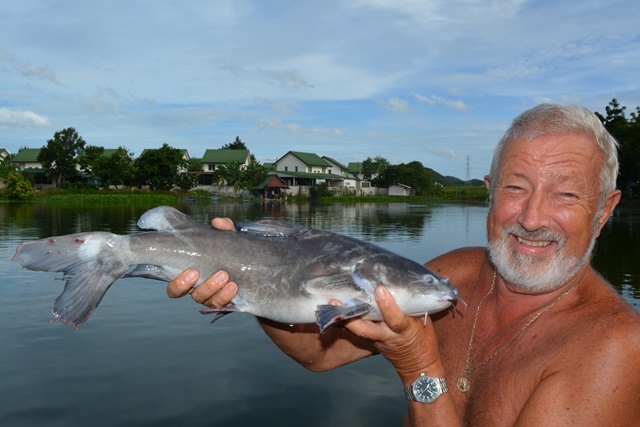 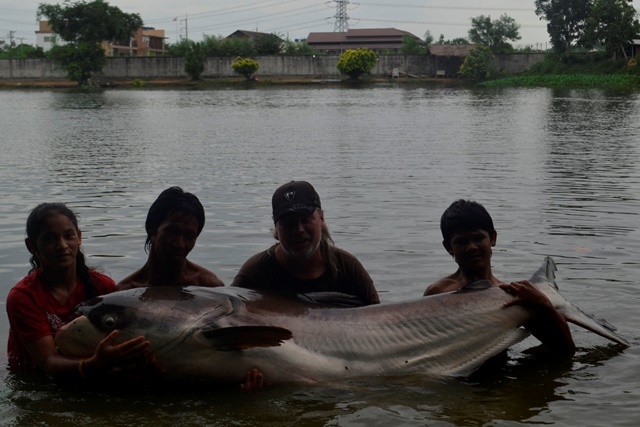 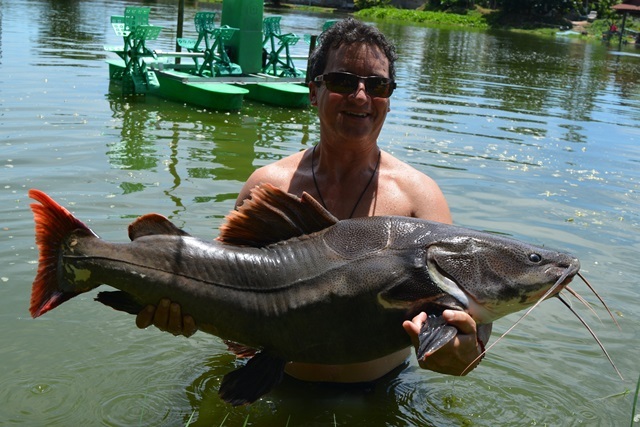 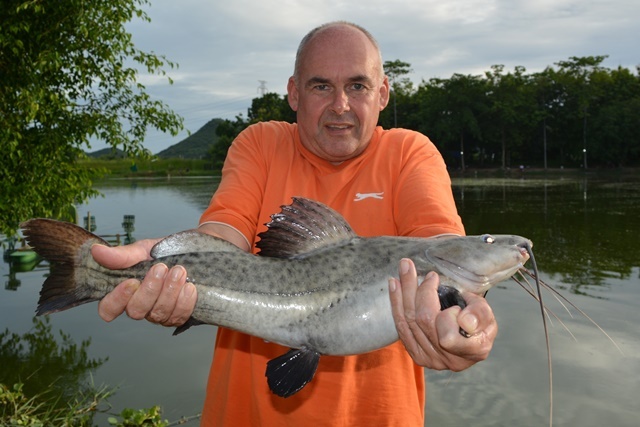 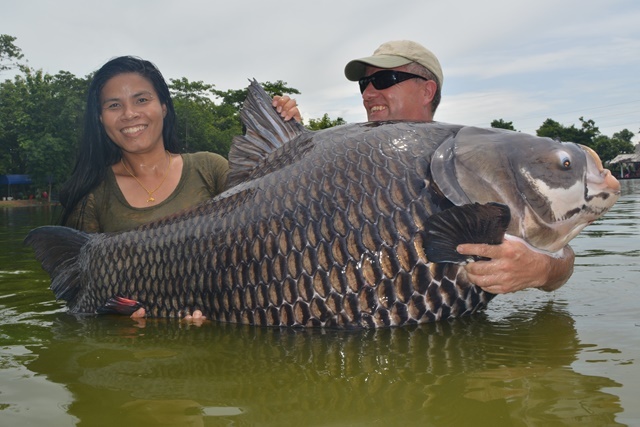 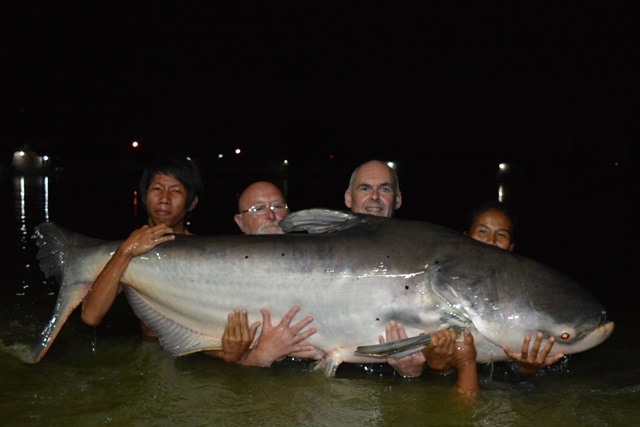 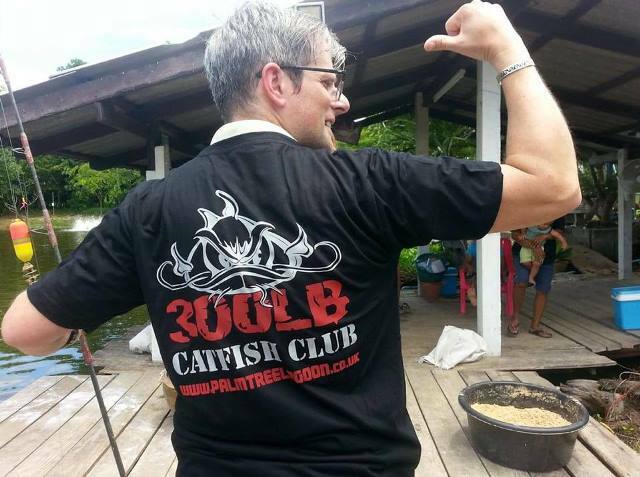 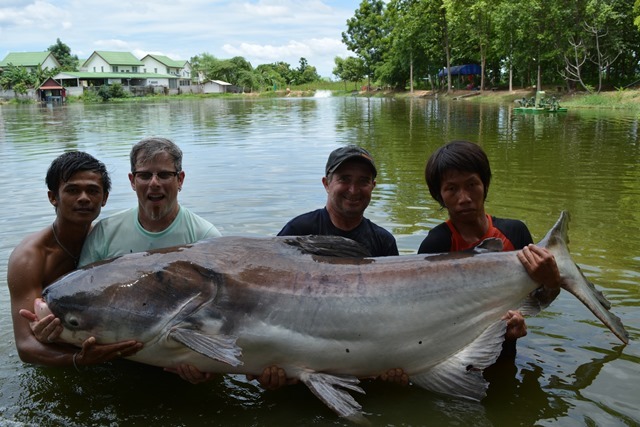 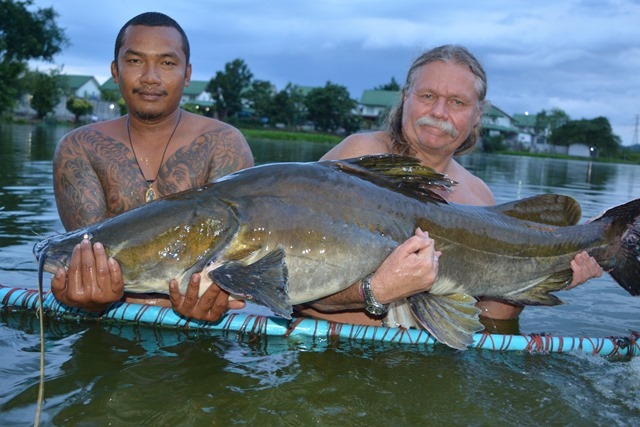 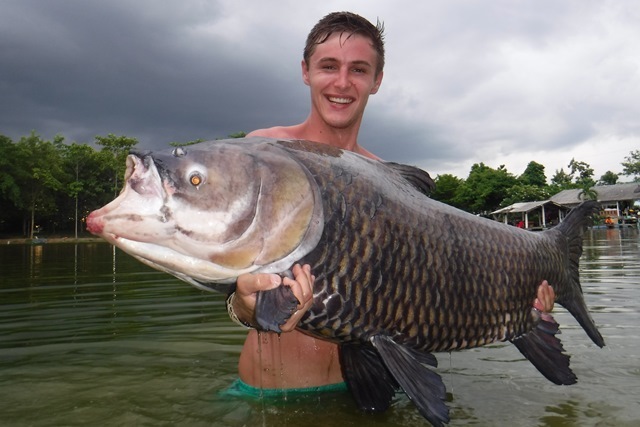 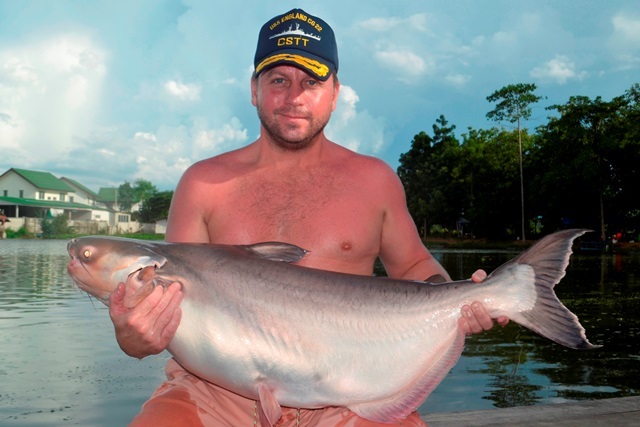 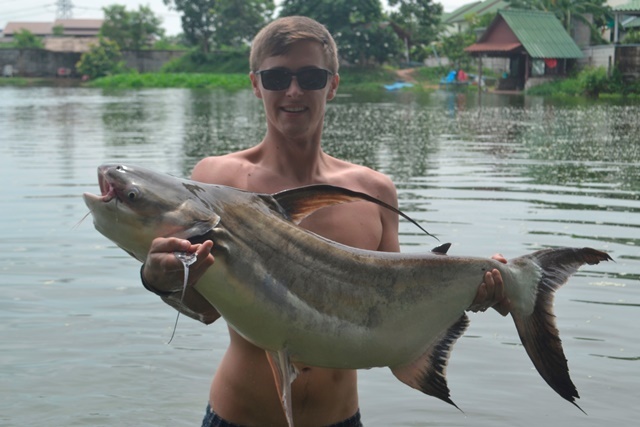 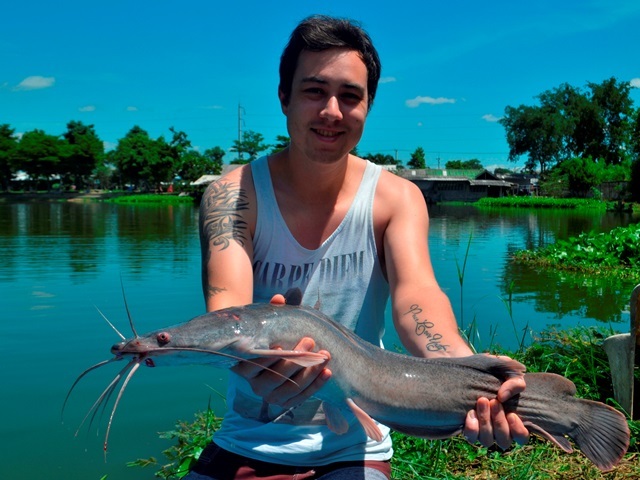 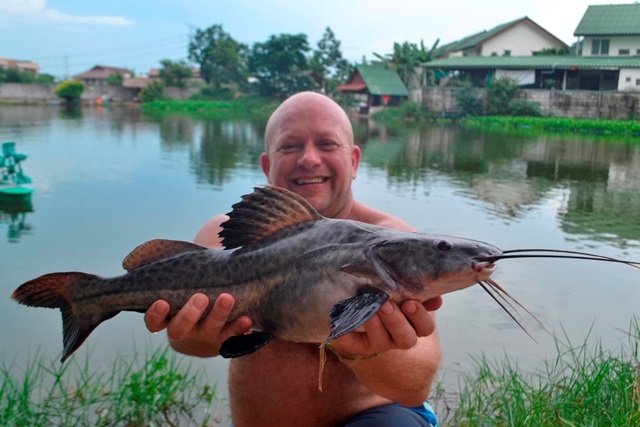 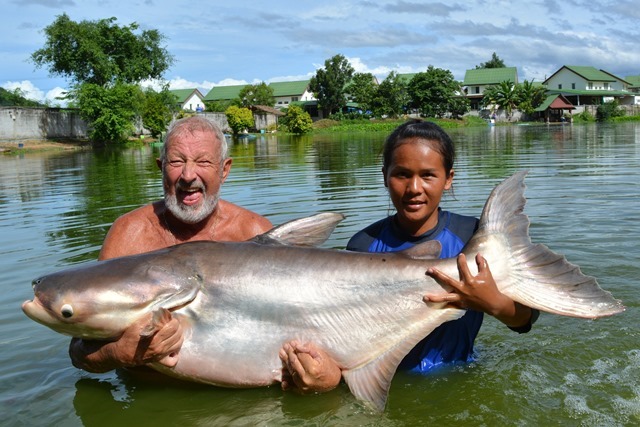 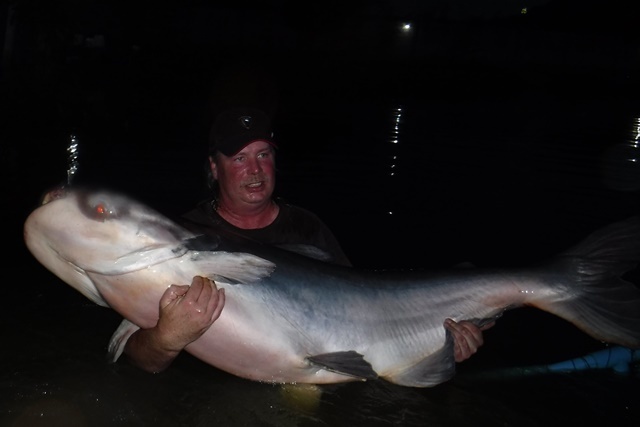 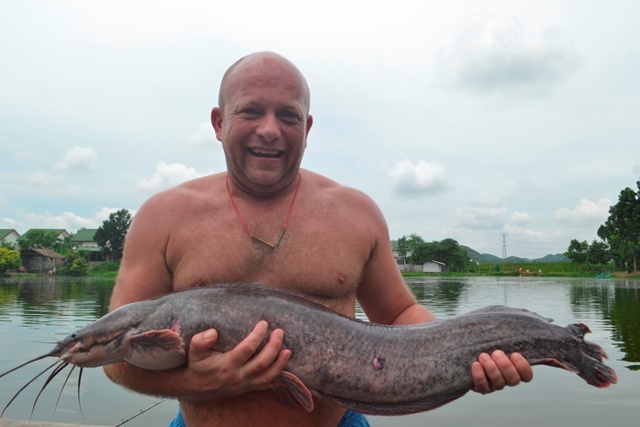 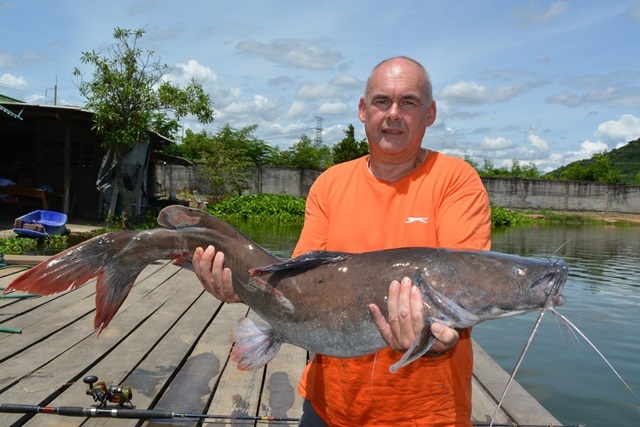 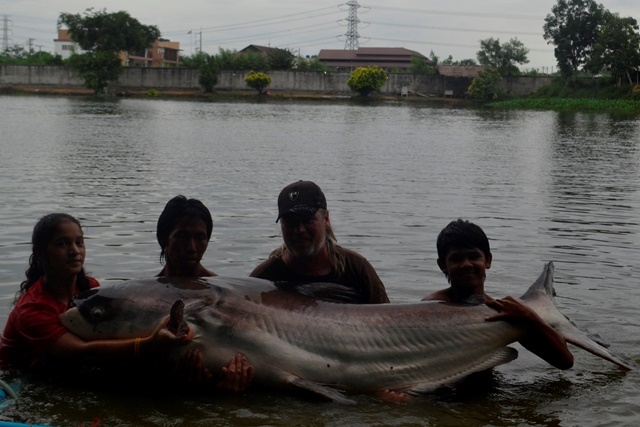 That they certainly got as John landed a 350lb Mekong Catfish in a record time of 52 minutes which was not only his biggest ever freshwater fish out of still water but also gave him membership to the Palm Tree Lagoon 300lb Catfish BIG Fish Club. 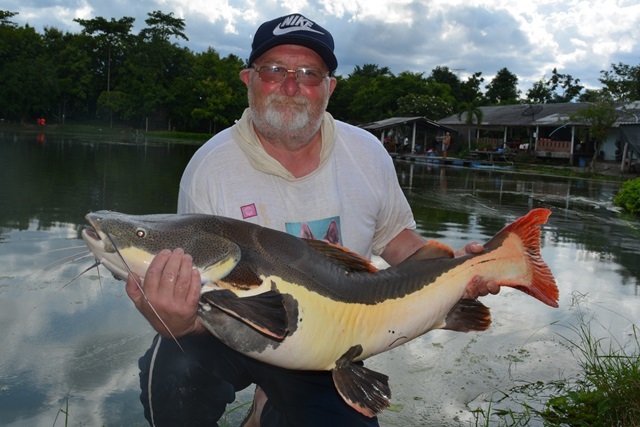 During the session he broke a total of 12 new species/pb's which included an awesome two toned albino Chinese bighead carp, small scale mud carp, bearded labeo, alligator gar, an awesome 22lb lake record giant snakehead, tambaqui, Salween rita, catfish shark, rohu, wallago attu and Thai redtailed catfish. 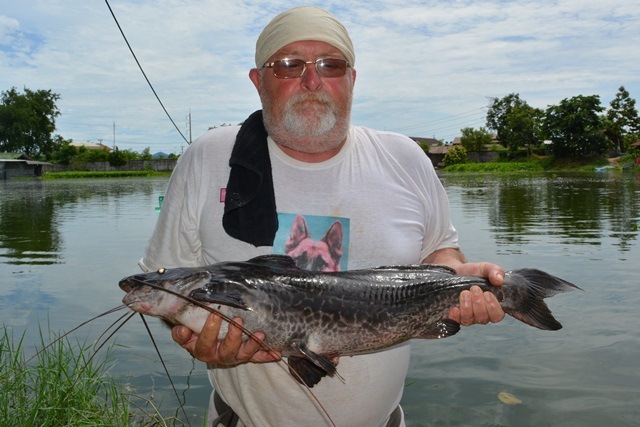 In addition he also caught black shark minnow, big-Y catfish striped catfish and Amazon redtail. 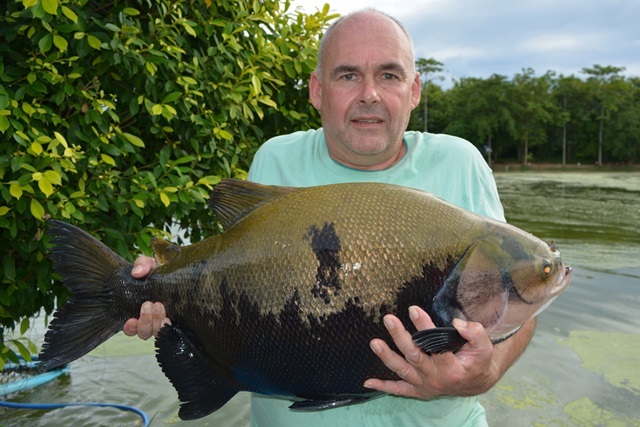 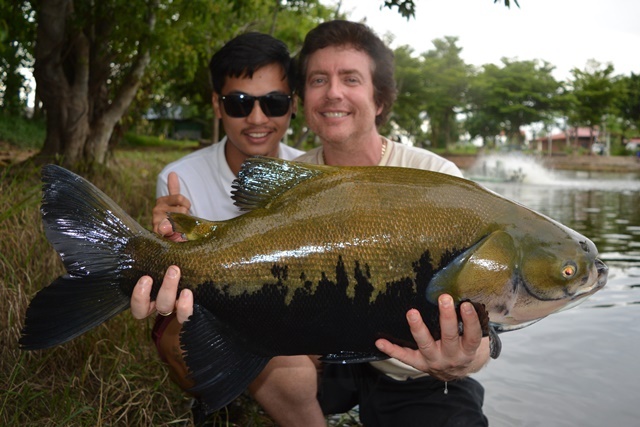 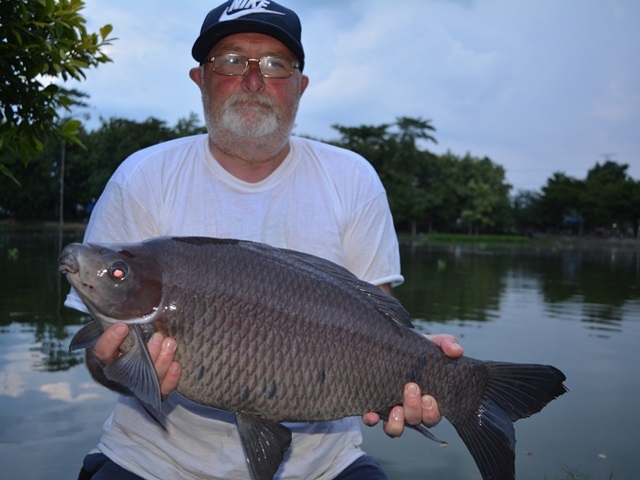 Eddie Stephenson joined regular Mickey Qualye for his first session at Palm Tree and being his first time fishing in Thailand every fish was a pb. 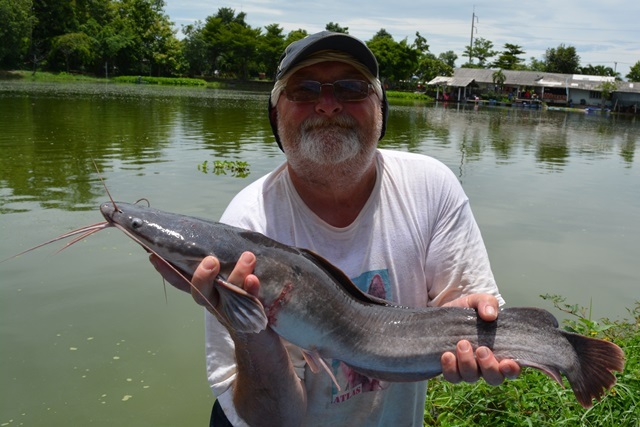 He caught a variety of great catches that included Mekong catfish to 160lb, Siamese carp to 90lb and alligator gar to 80lb. 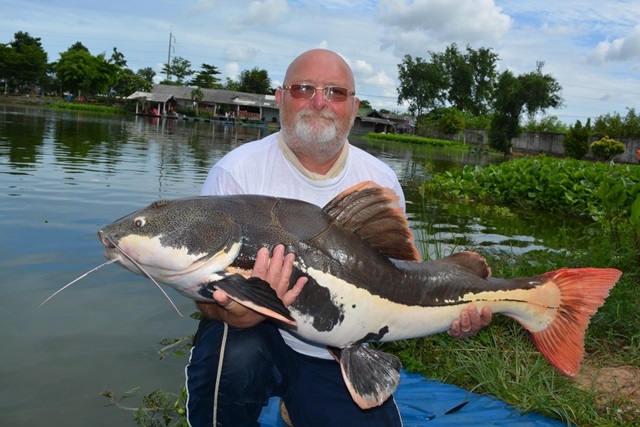 He also caught some rarer species that included marble catfish, Chinese black carp, catla carp and red labeo. 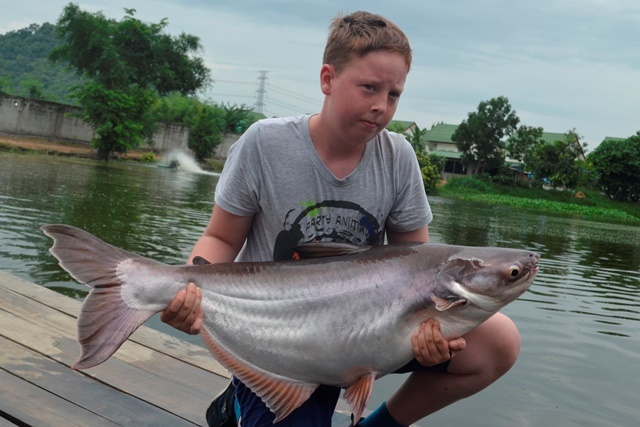 In addition to this he caught a myriad of other fish species such as Juliens golden price carp, pacu, mollycot, black shark minnow, chao phraya catfish, wallago attu, rohu, black ear catfish, vundu catfish, striped catfish, catfish shark as well as both Thai and Amazon redtails. 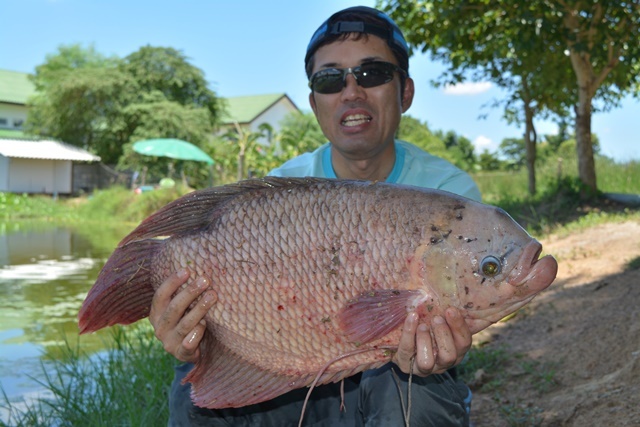 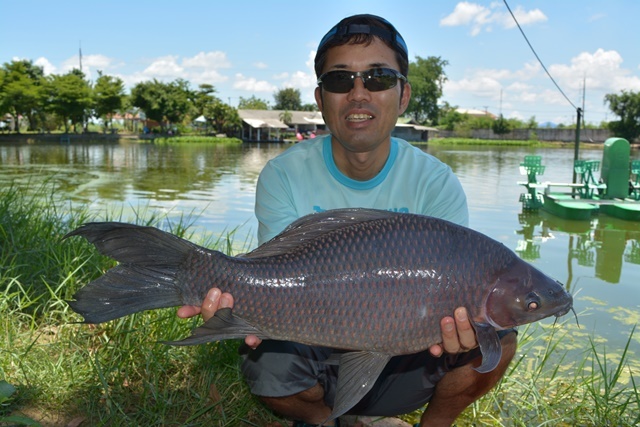 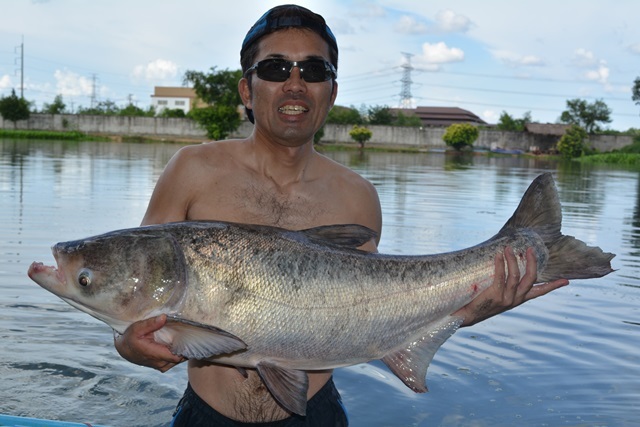 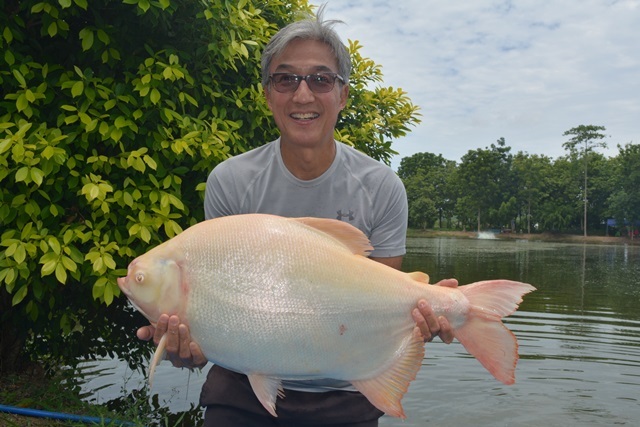 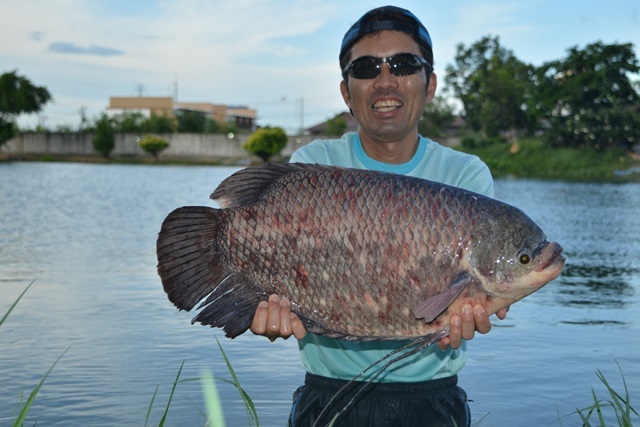 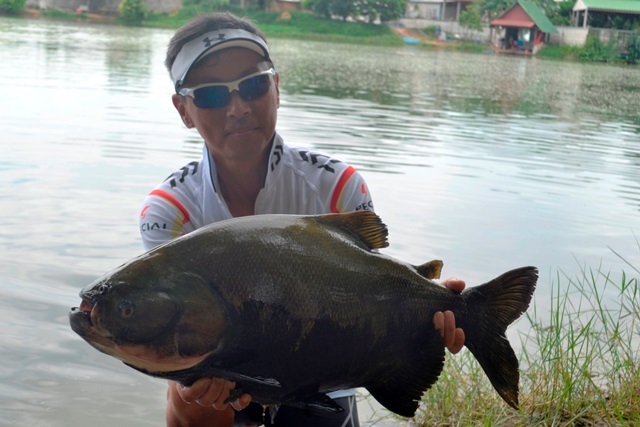 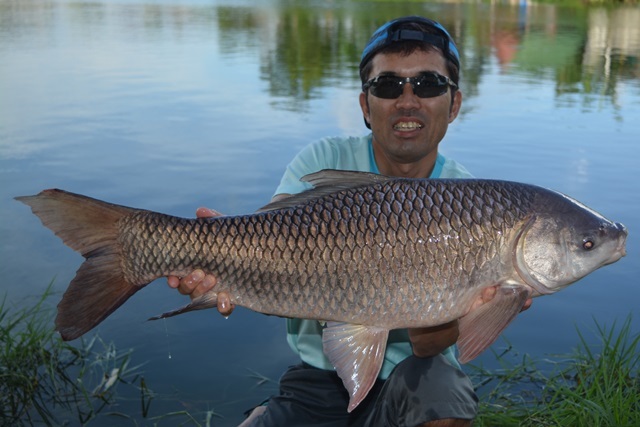 One of our regular Japanese anglers was back catching several new species for him that included the gourami double namely the giant gourami as well as the predatory elephant ear gourami, as well as Chinese bighead carp and black shark minnow. 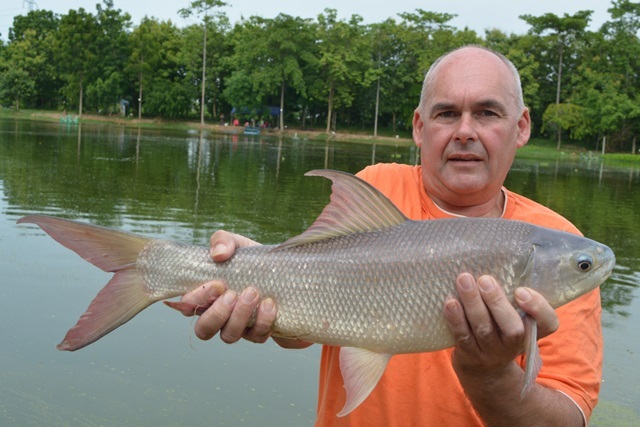 He also caught a number of rohu. 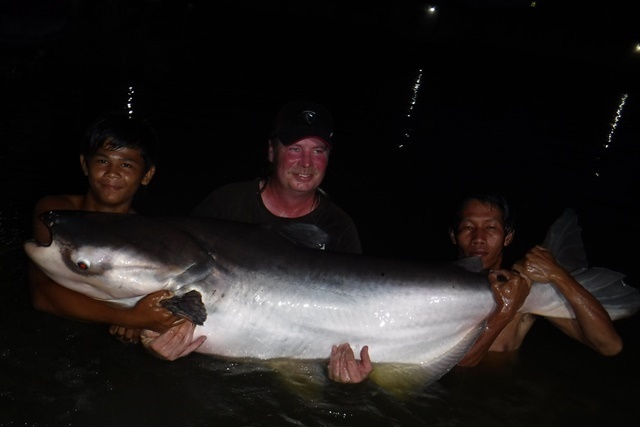 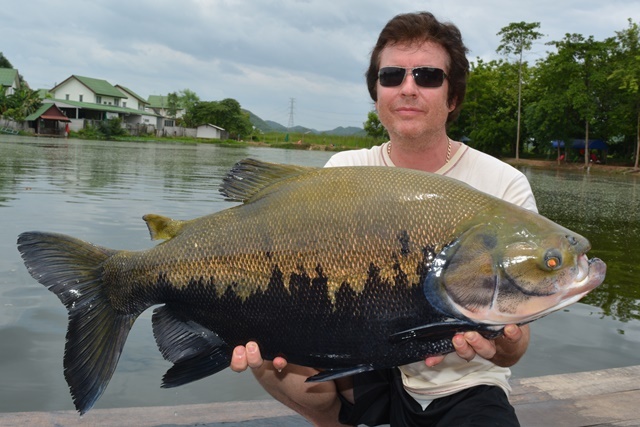 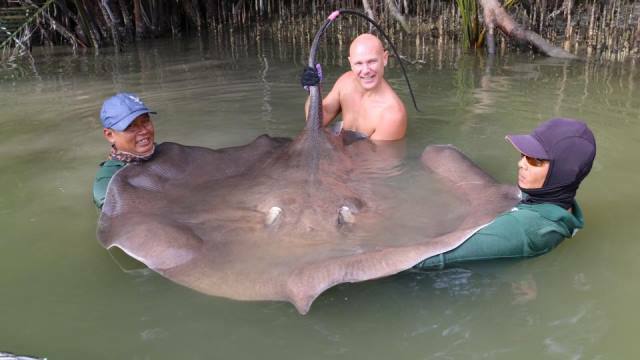 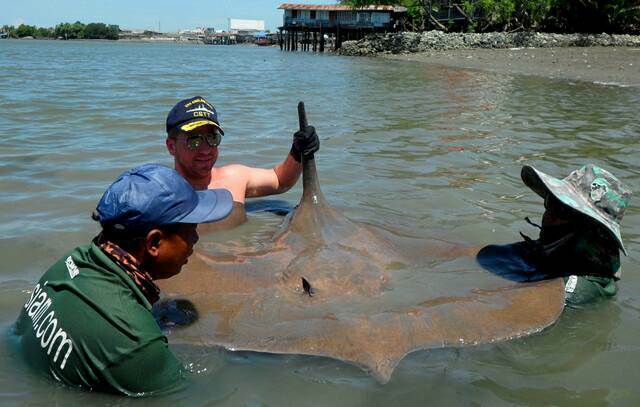 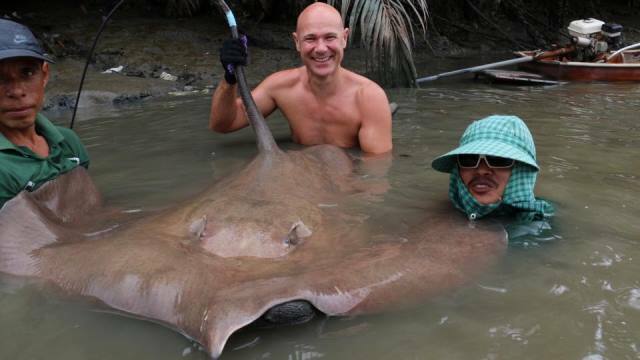 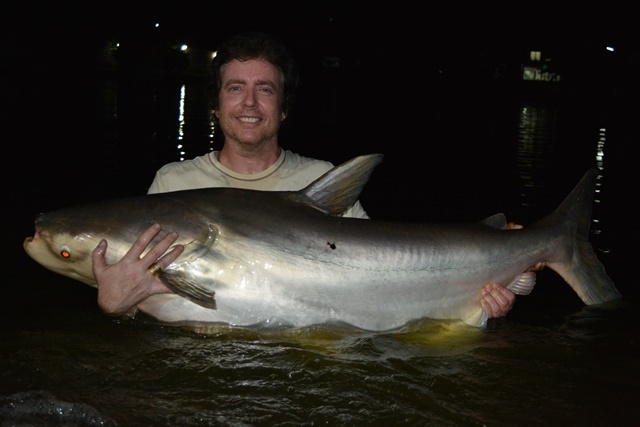 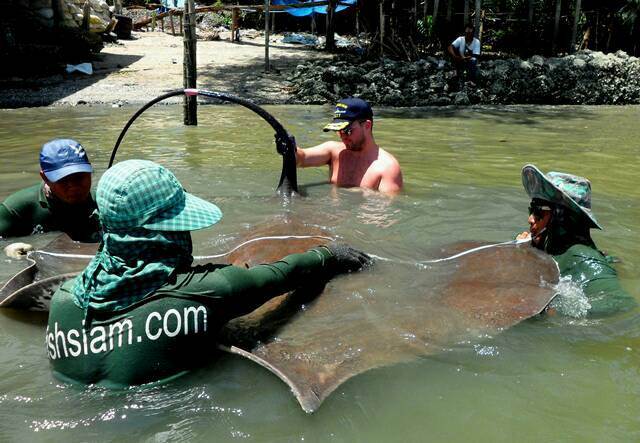 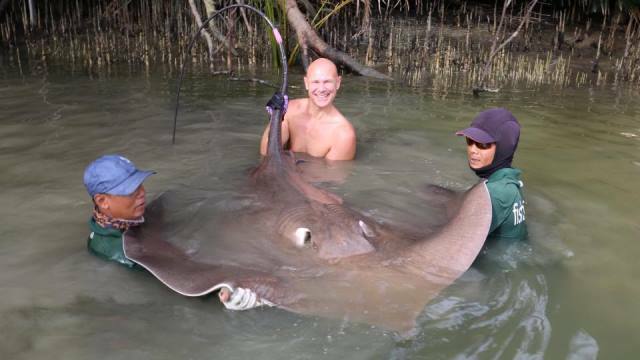 Danny Cooper was another angler who successfully tried his hand at giant freshwater stingray fishing on the Mae Klong river during the month, landing a couple of impressive river monsters. 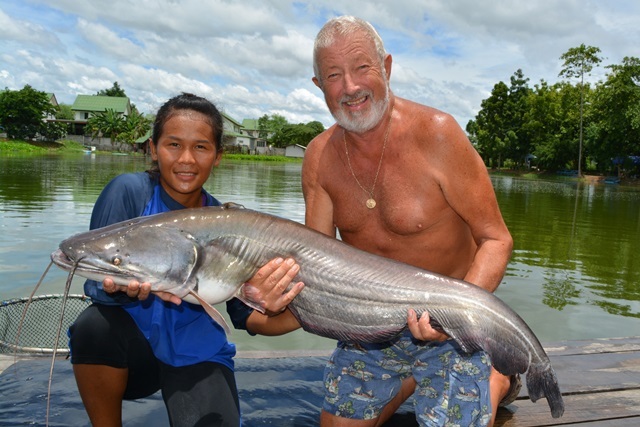 Rick Canadine who resides in Bangkok and his daughter popped in for a quick visit. 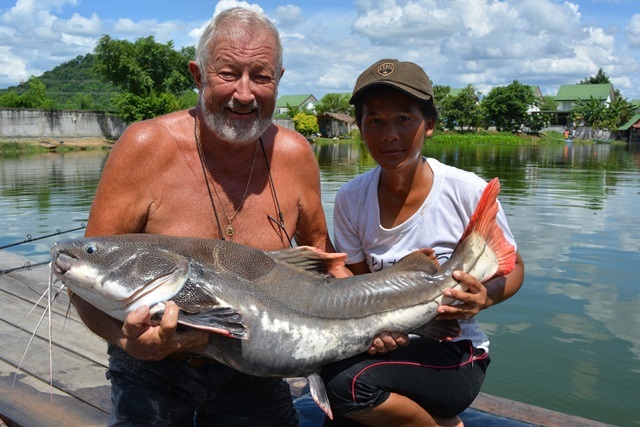 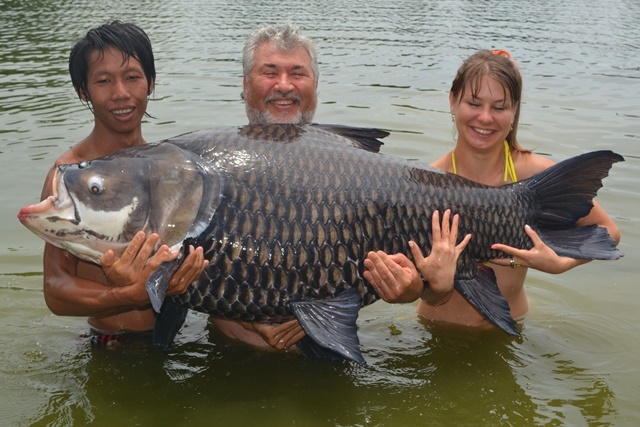 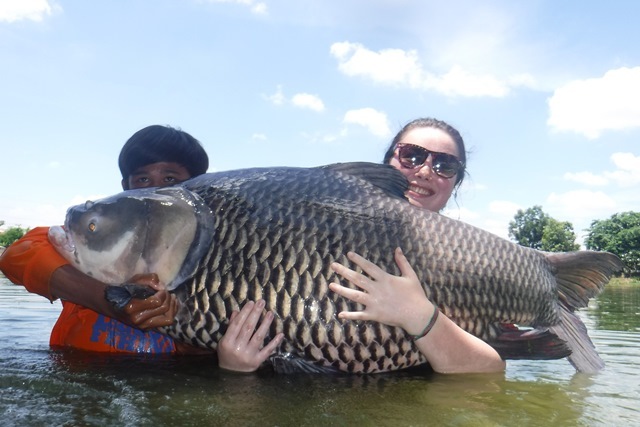 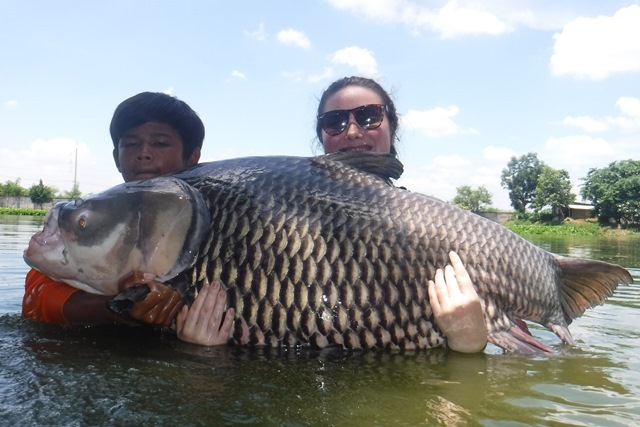 His daughter caught the pick of the fish with an impressive 100lb+ Siamese carp, they also caught Amazon catfish, rohu and catfsih shark. 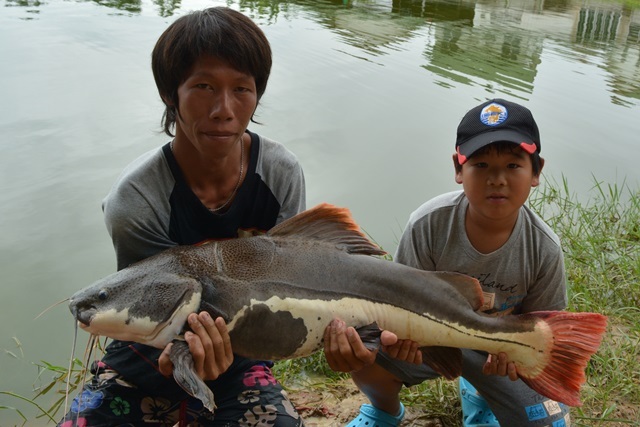 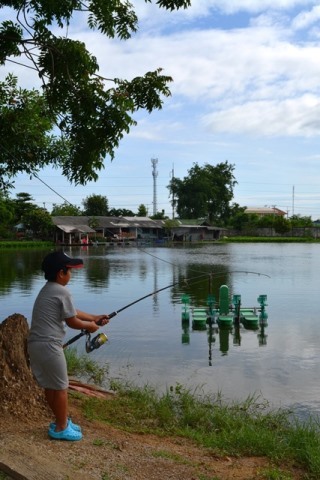 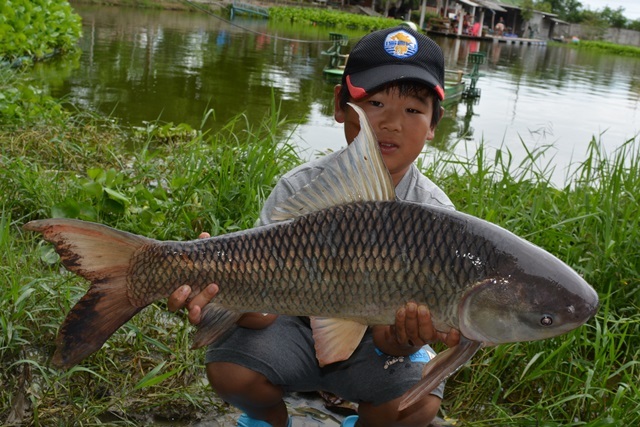 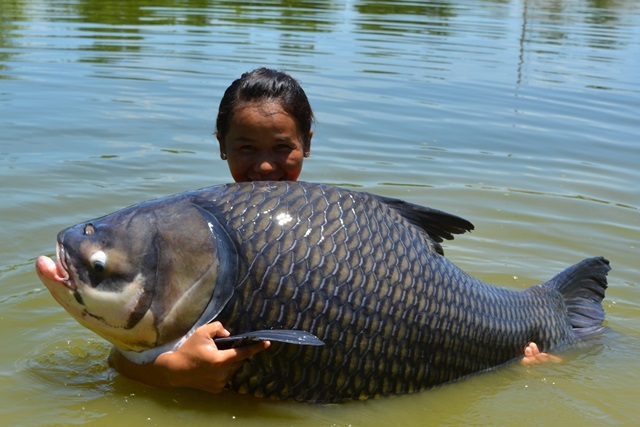 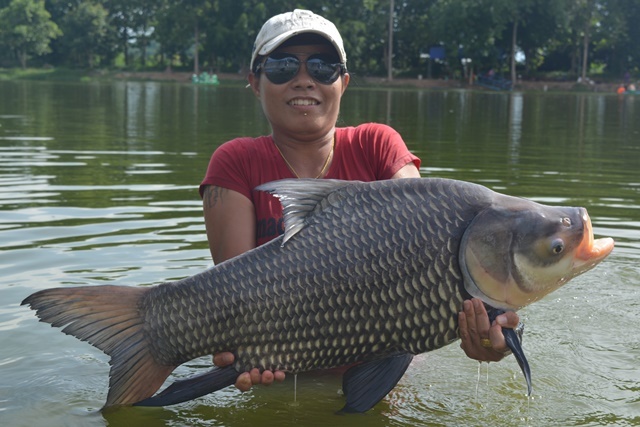 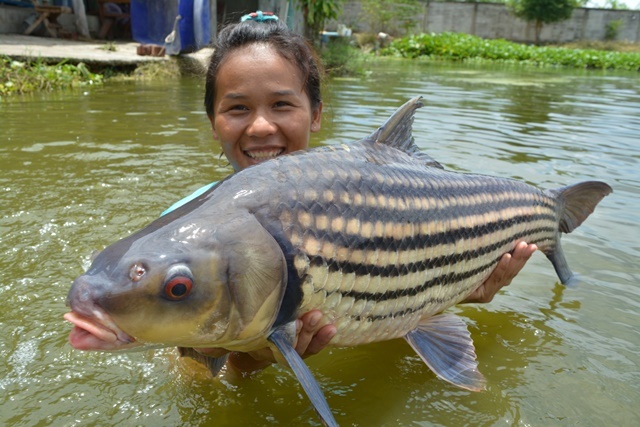 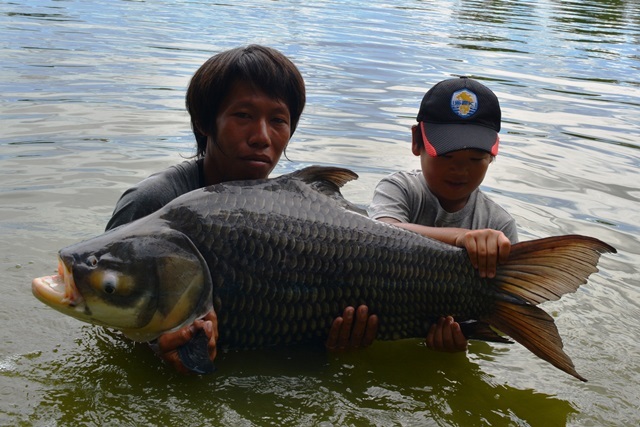 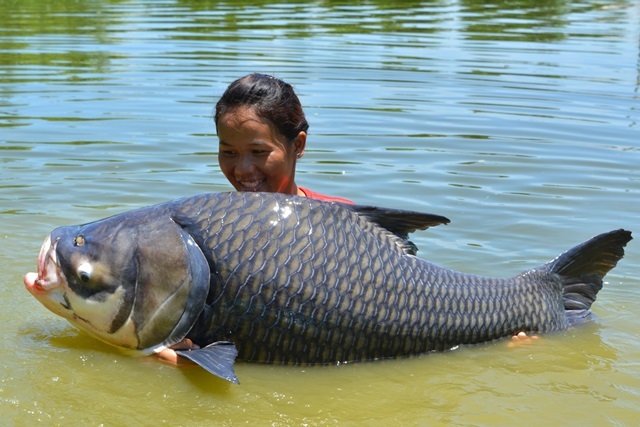 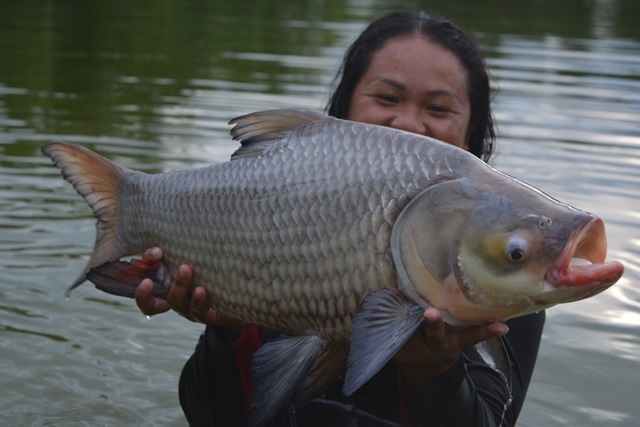 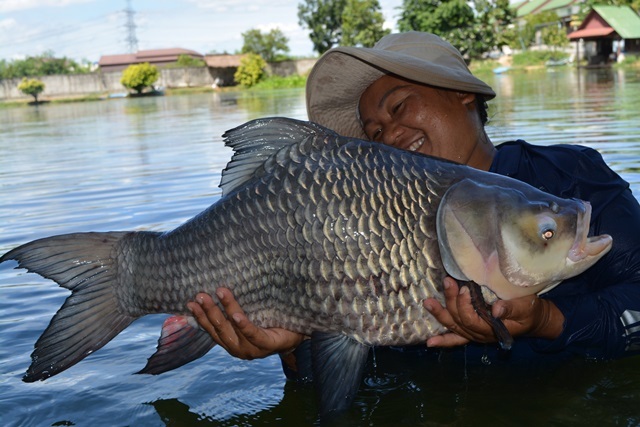 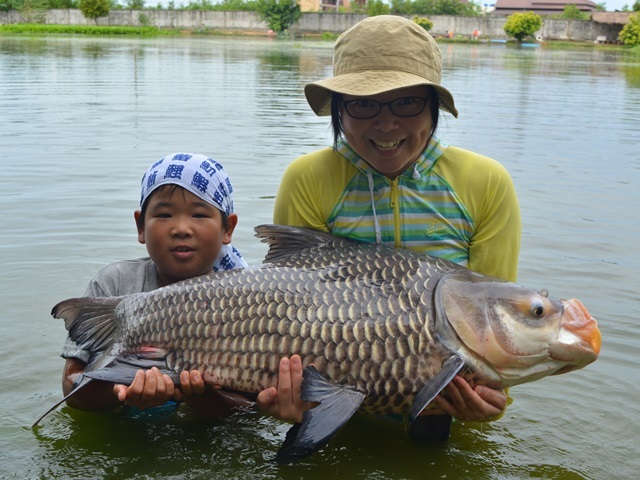 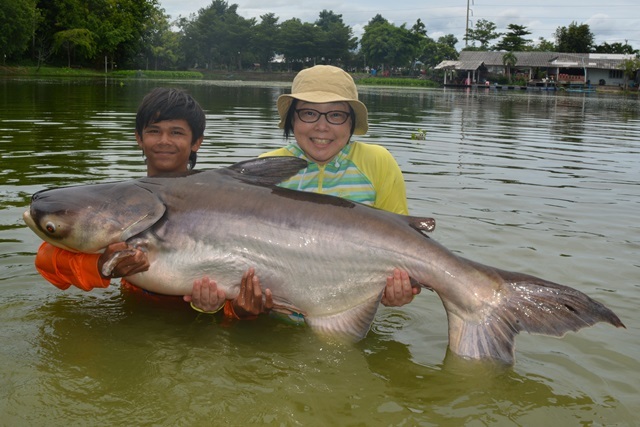 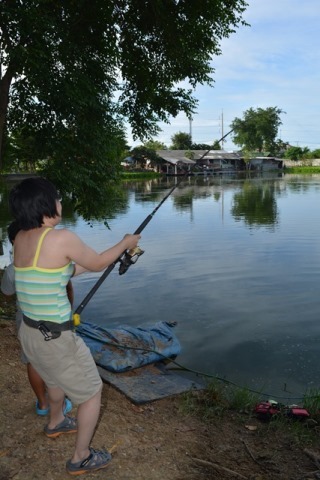 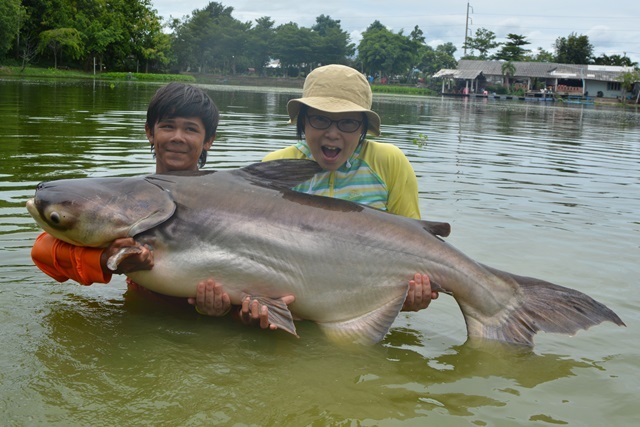 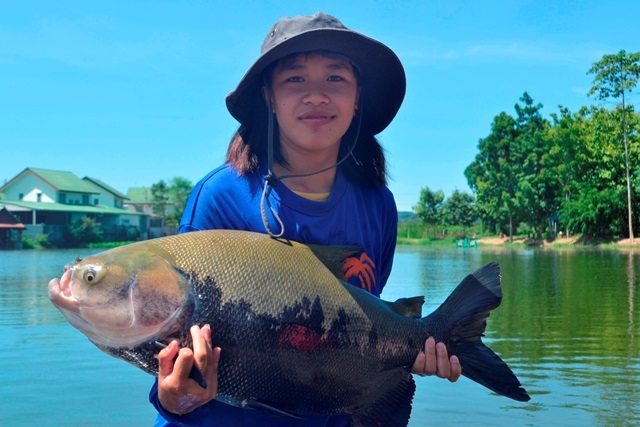 Yoshie Honda and her nine year old son were very excited with their catches of Mekong catfish, Siamese carp, rohu and Amazon redtail.and vowed to be back soon. 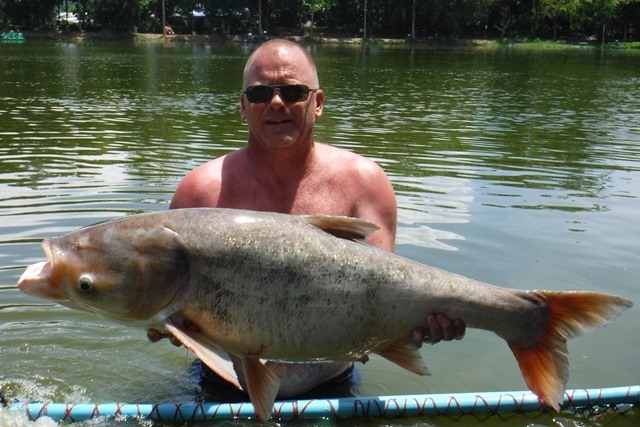 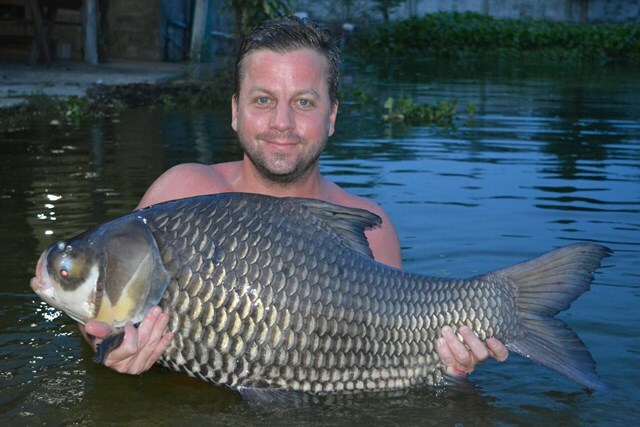 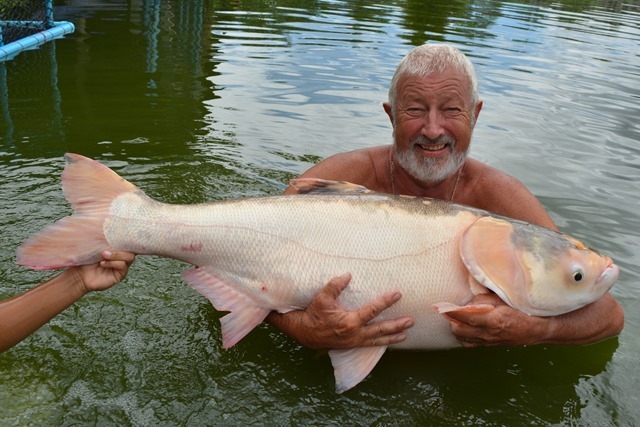 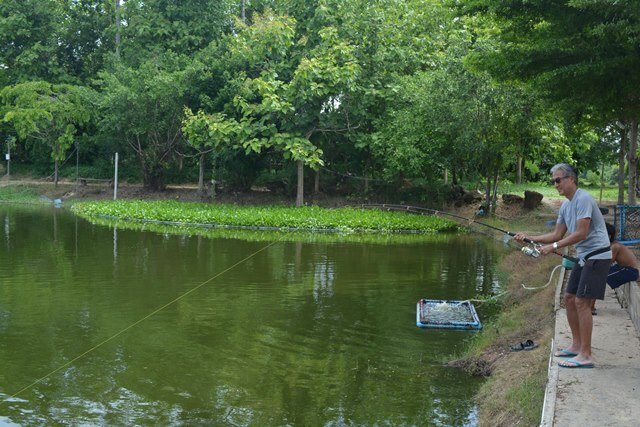 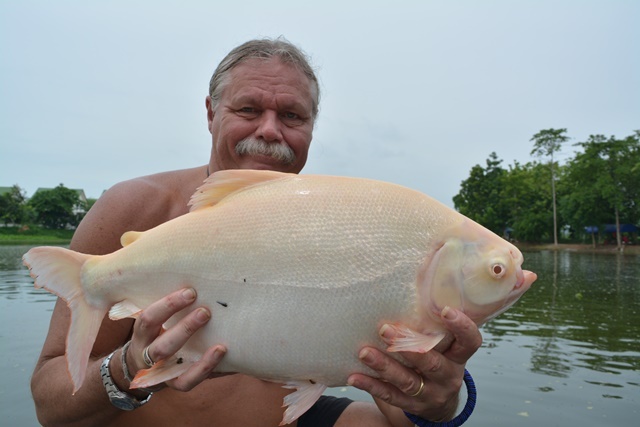 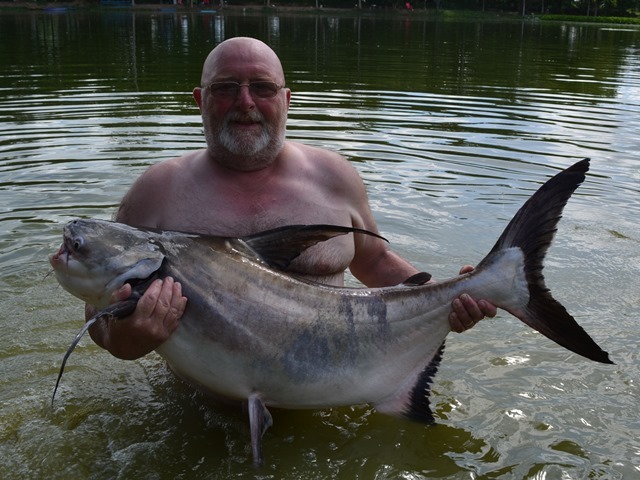 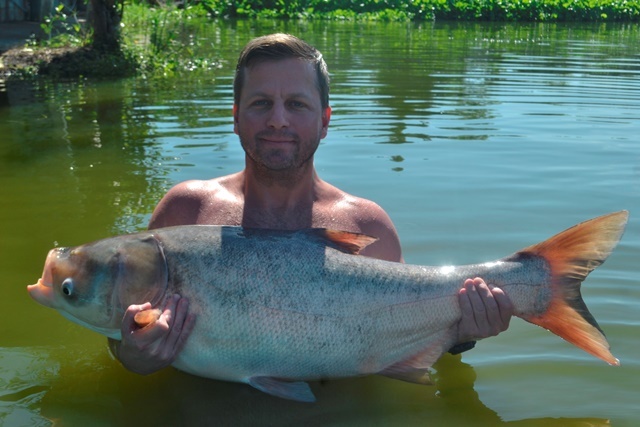 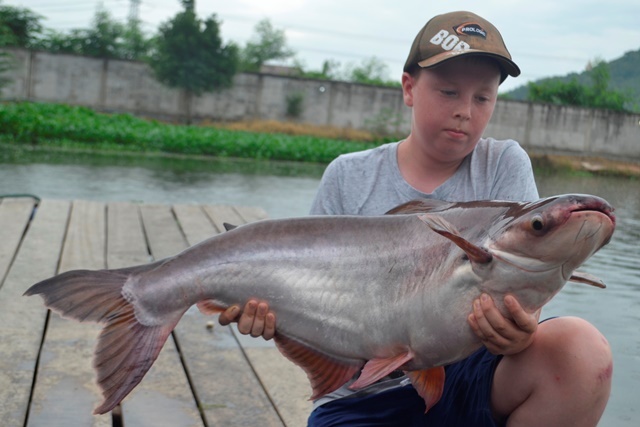 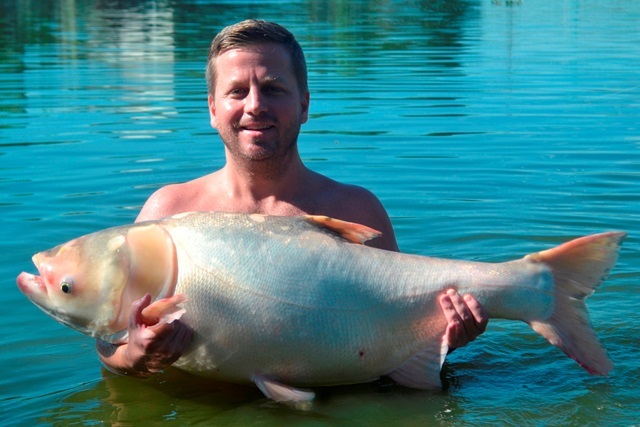 German angler Dirk Kohler was back with his son and they had a great session highlighted by him joining the Palm Tree Lagoon 300lb Catfish club with a lake monster that took almost two hours to land. 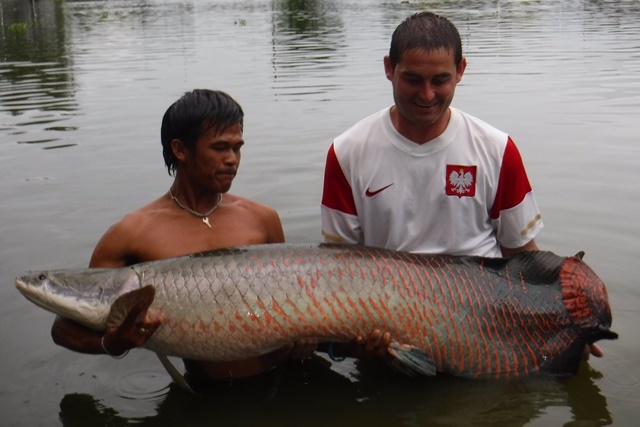 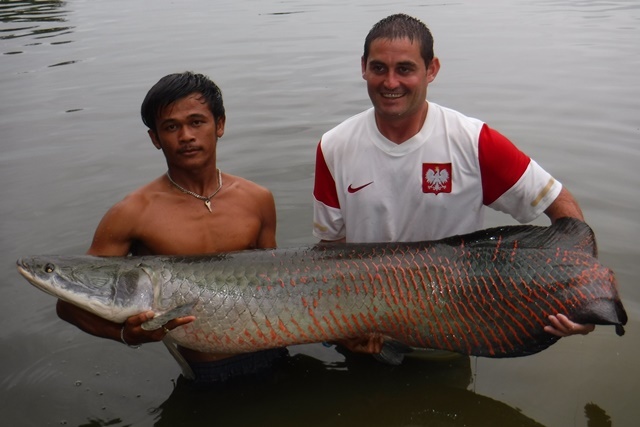 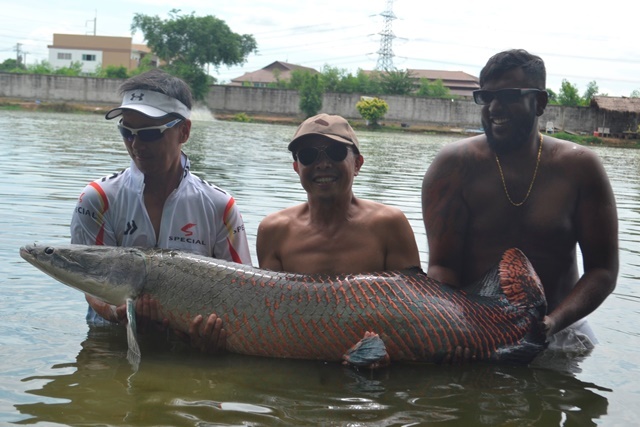 In addition to this they also caught arapaima, catfish shark, striped catfish, albino catfish shark, giant featherback, alligator gar and Asian redtailed catfish. 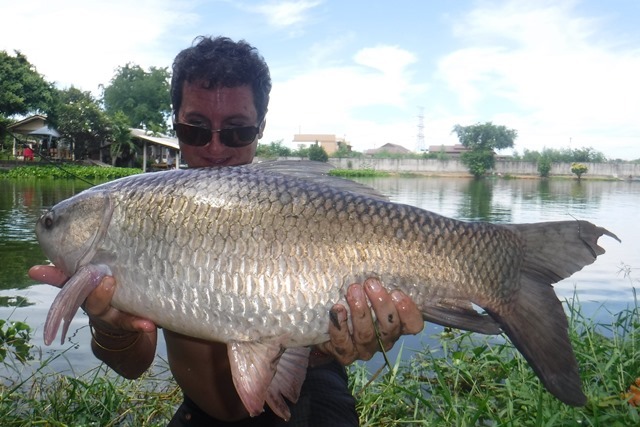 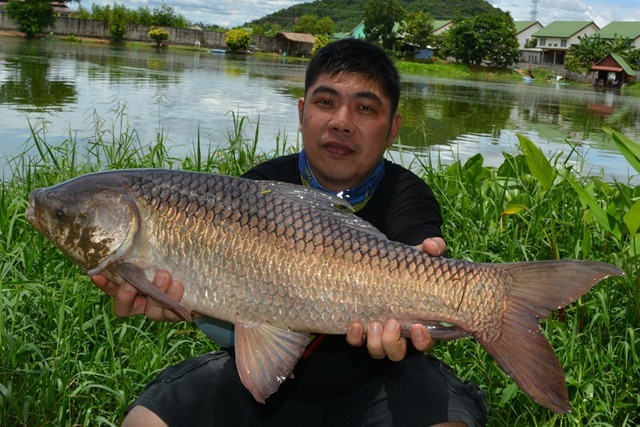 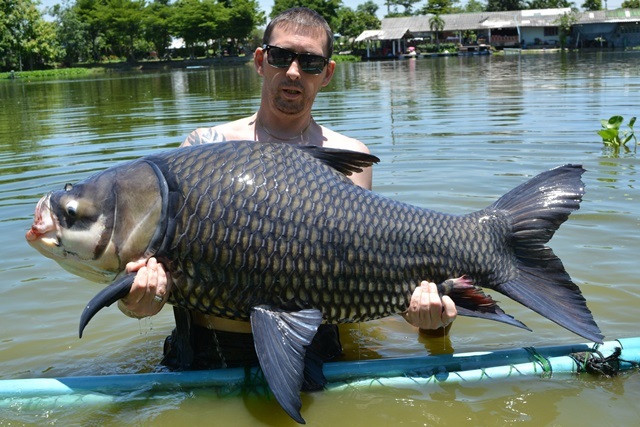 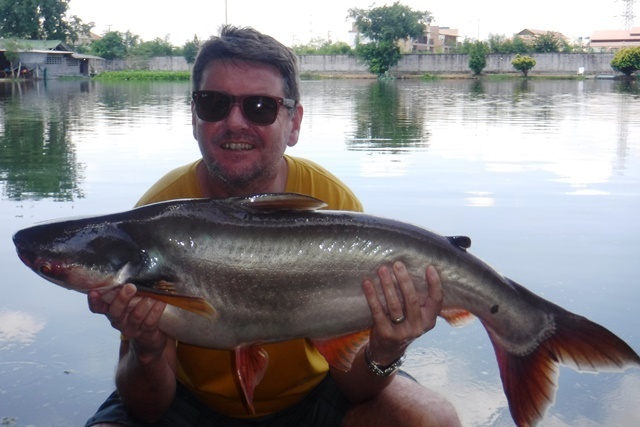 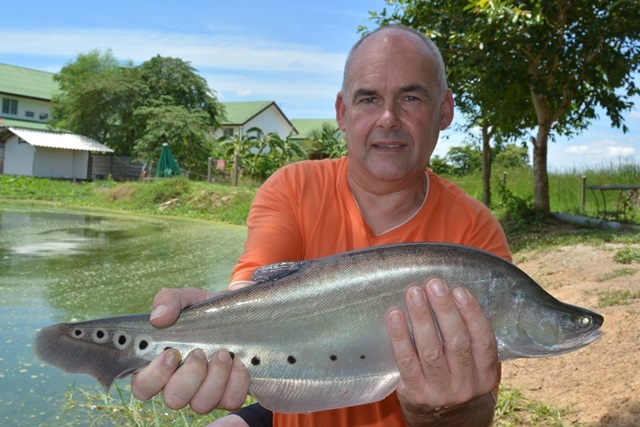 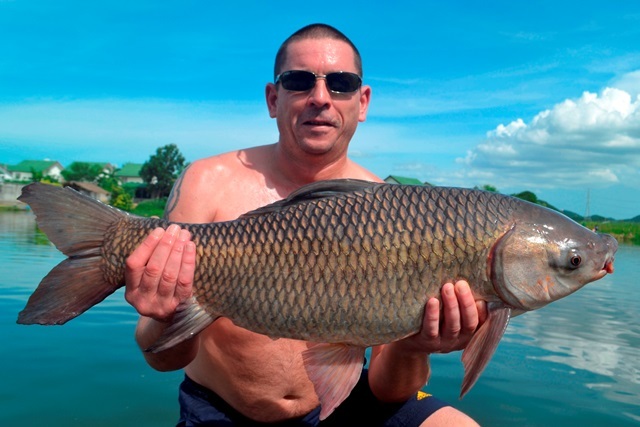 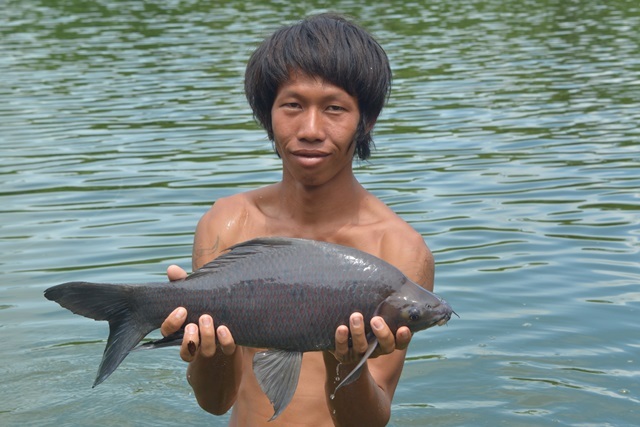 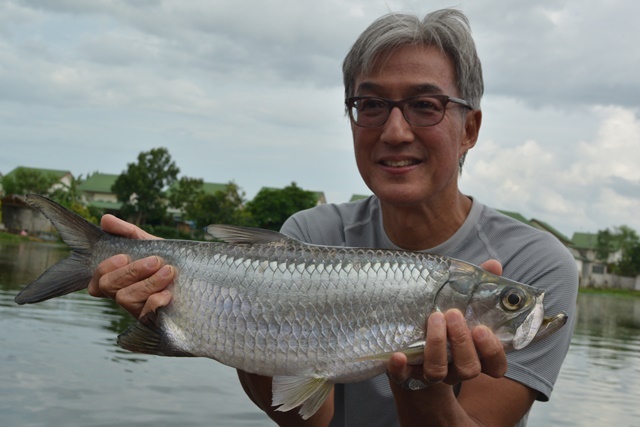 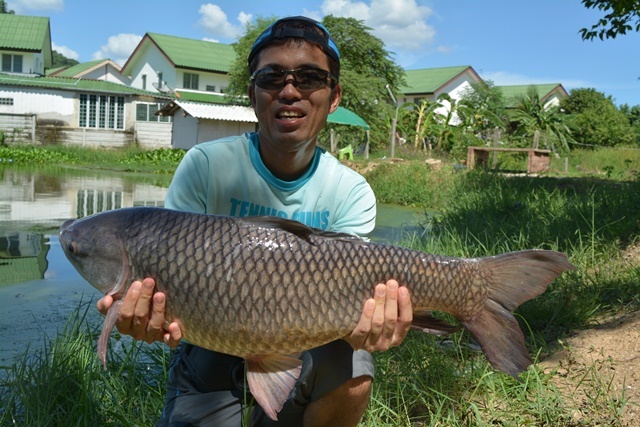 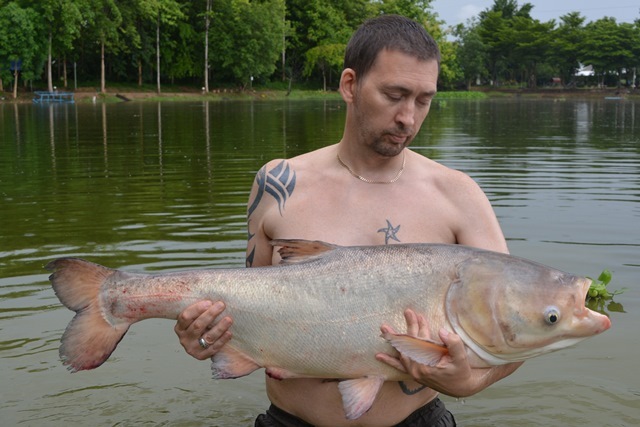 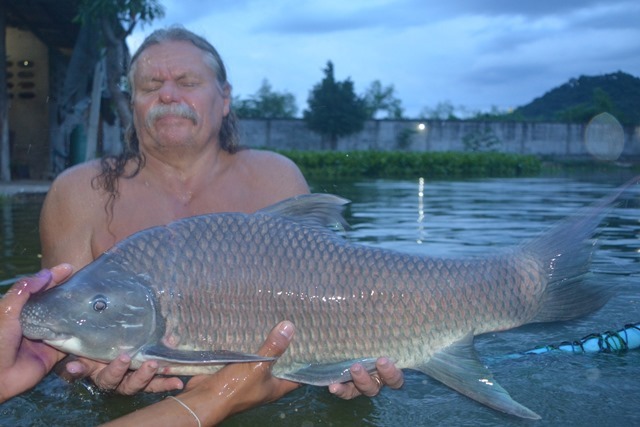 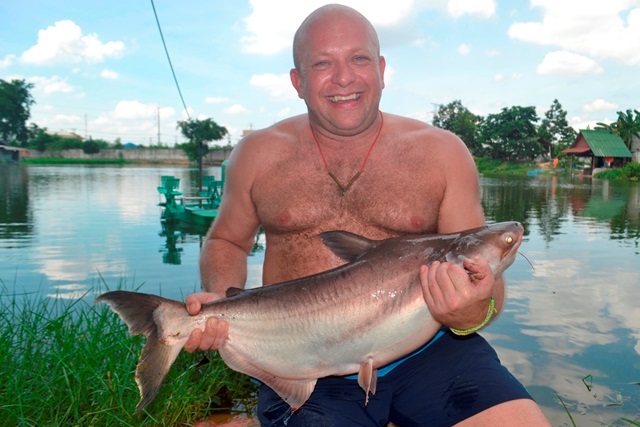 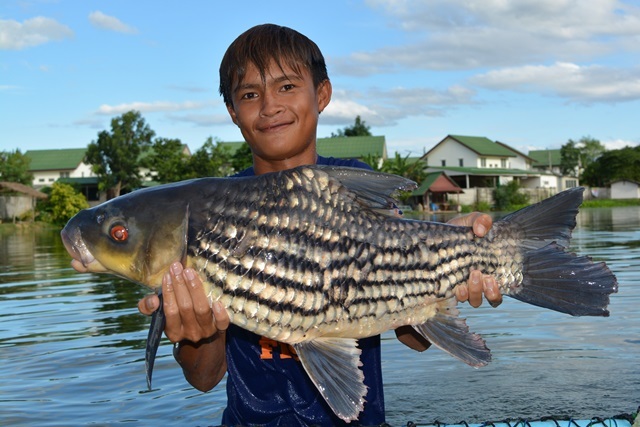 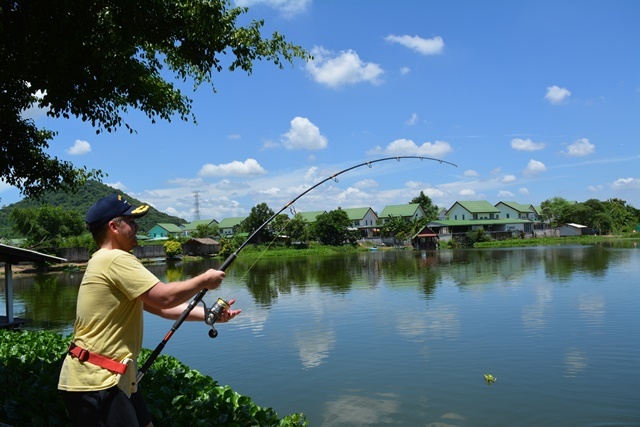 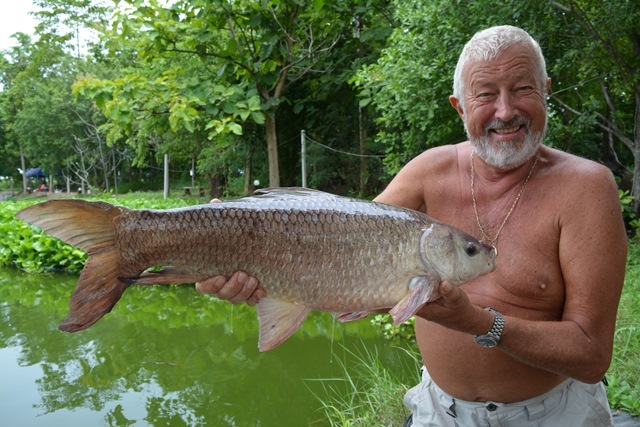 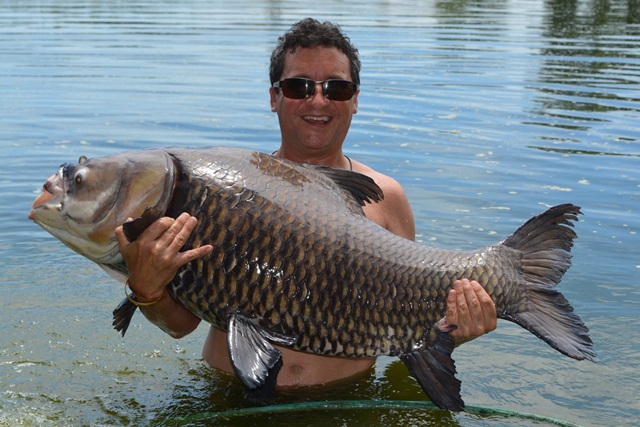 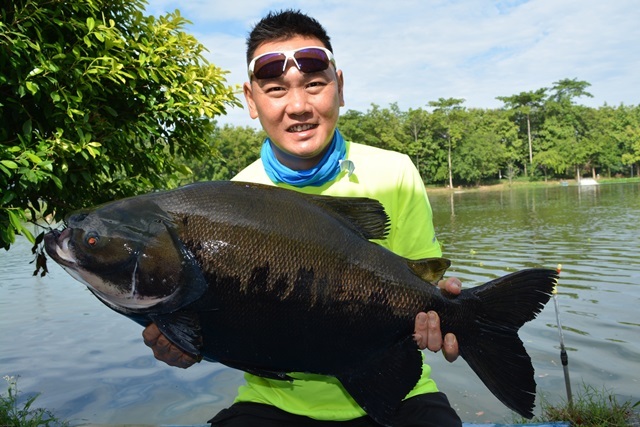 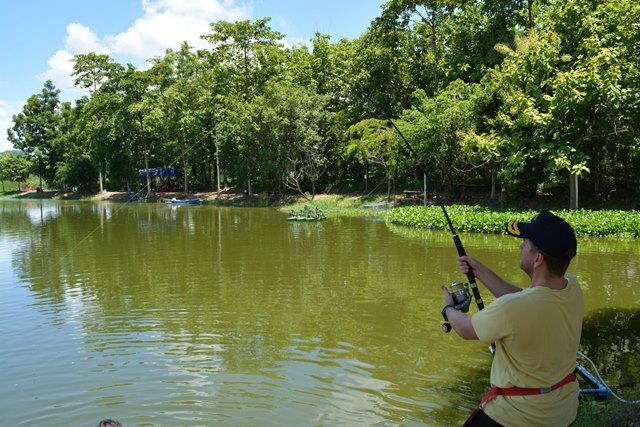 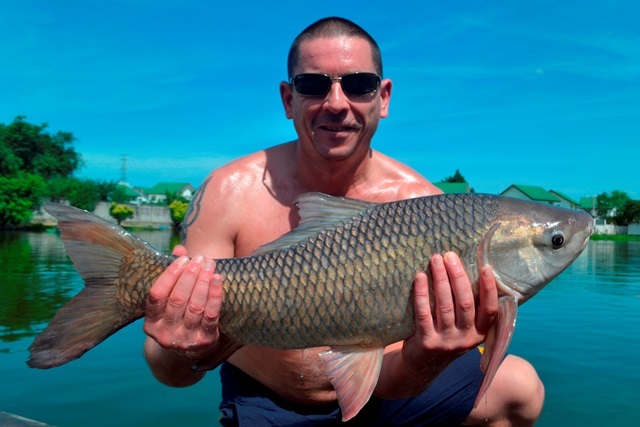 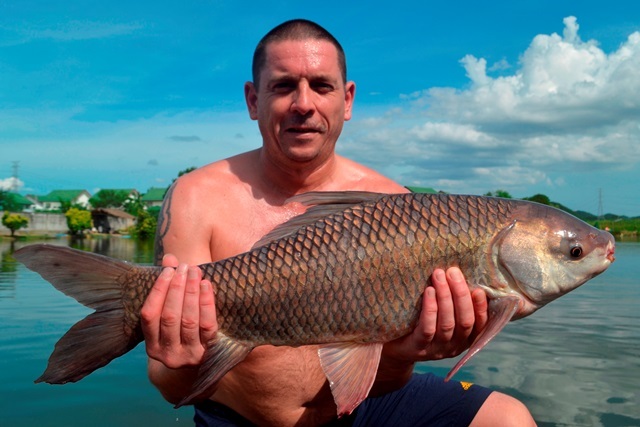 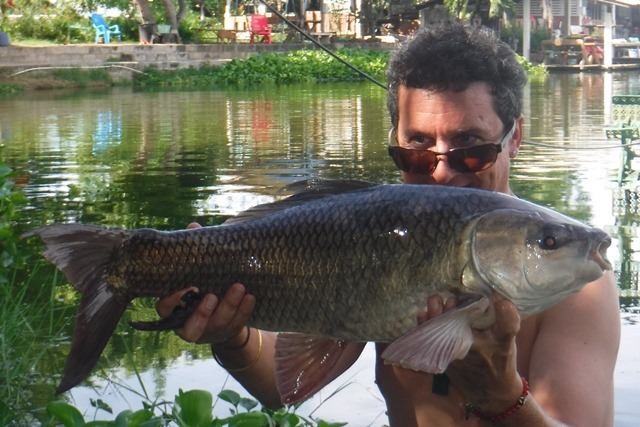 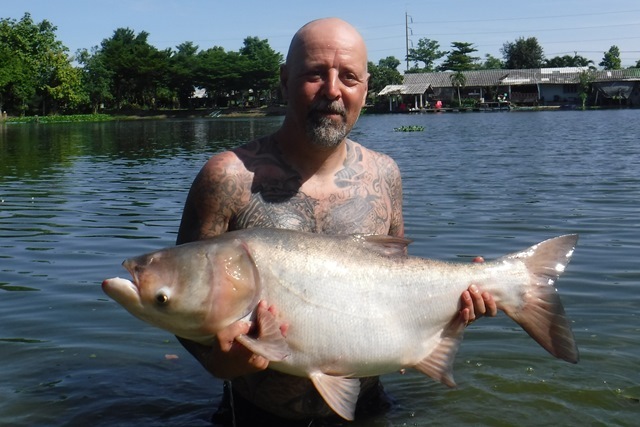 Robert from Bangkok made his first visit to Palm Tree this month and was more than happy with his catches of arapaima, rohu, Chiinese bighead carp, vundu catfish, Siamese carp, black shark minnow and Asdian redtail catfish. 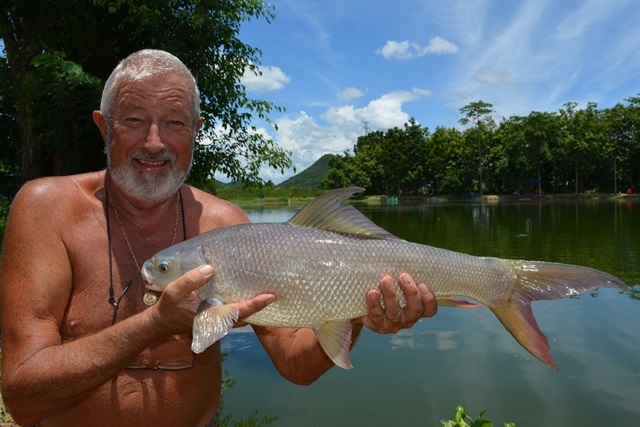 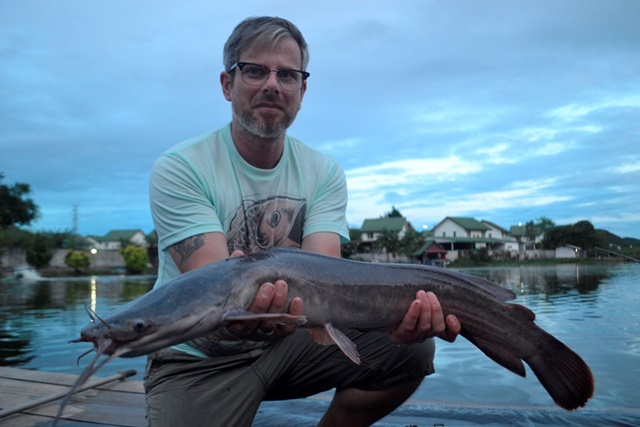 Tim was back and had a number of good fish that included some big alligator gar that all came out on chicken hearts, a lake record kali rohu, another barb we don't know the English name for (pla ta gar in Thai), albino pacu, and a big Salween catfish. 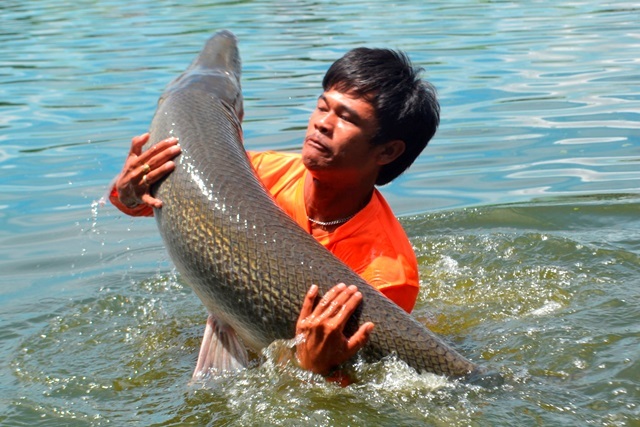 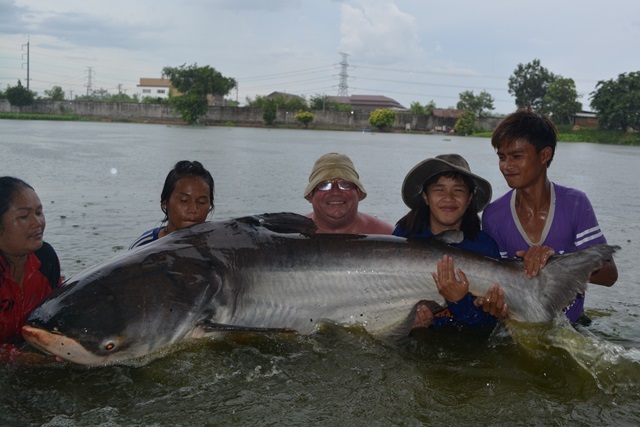 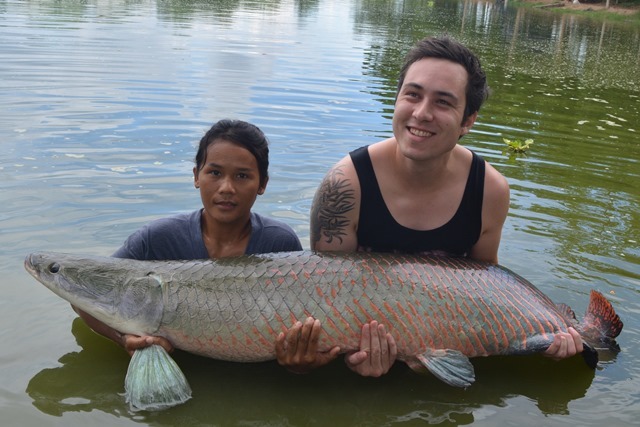 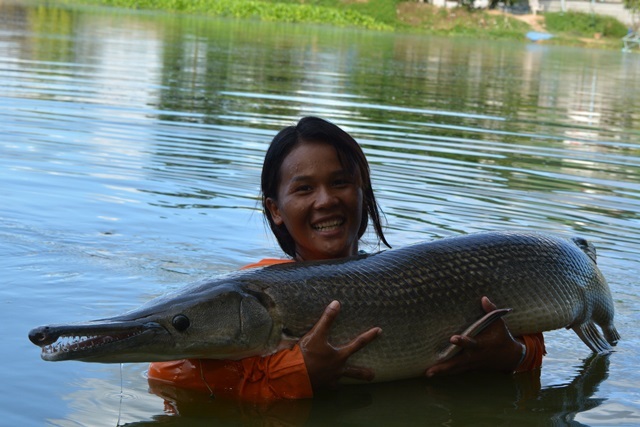 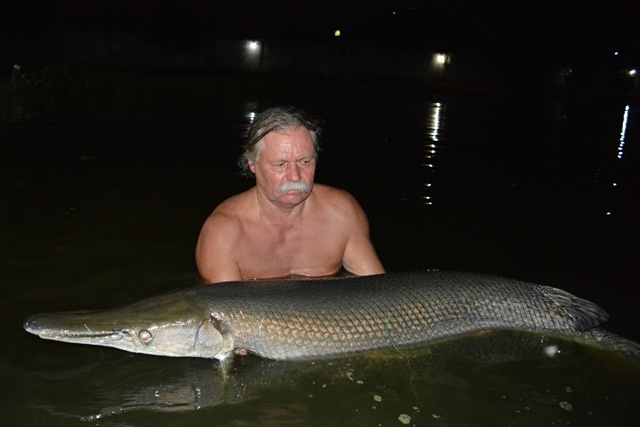 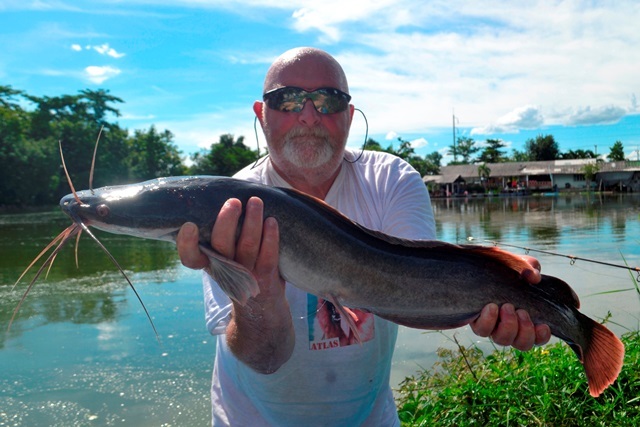 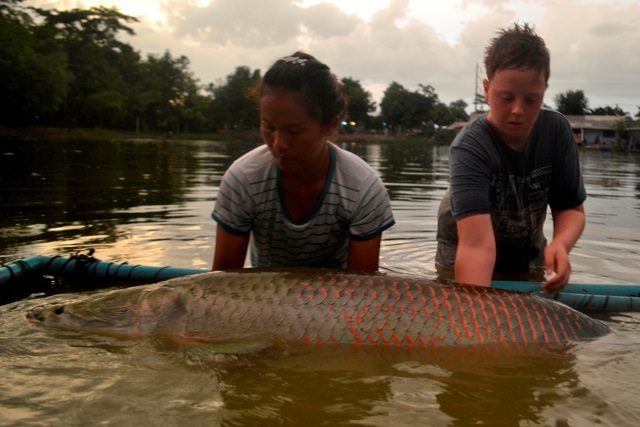 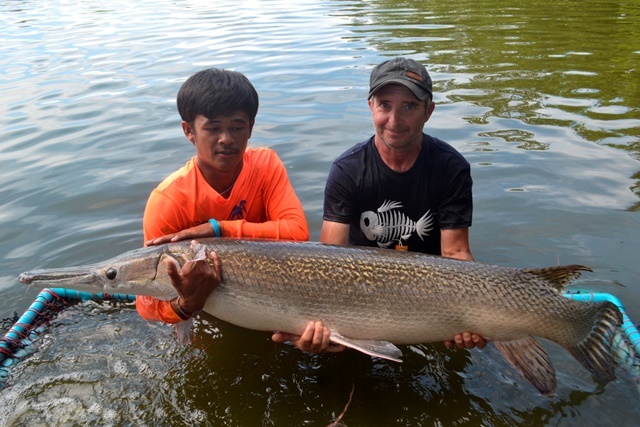 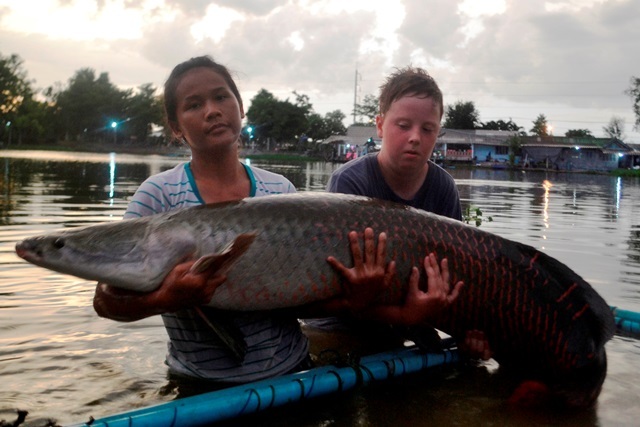 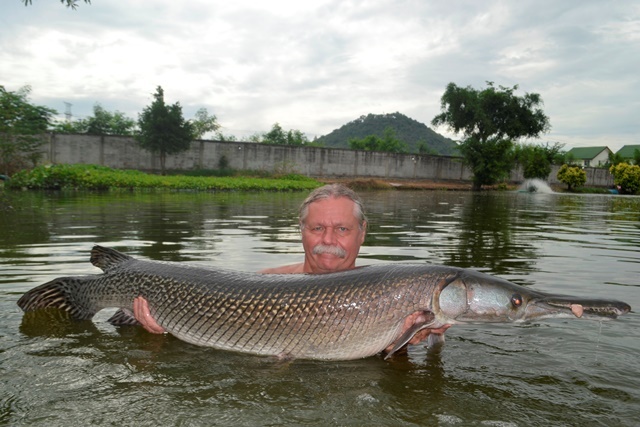 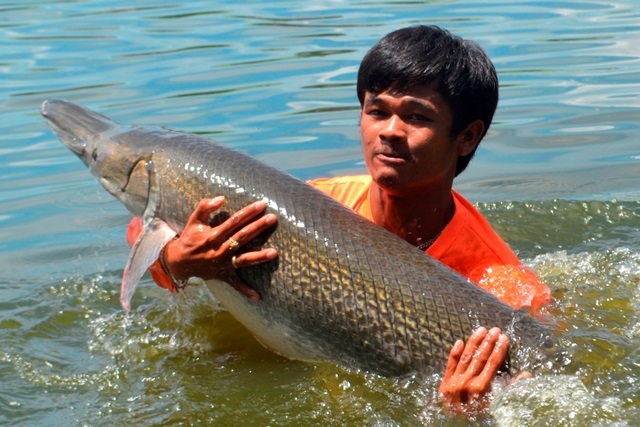 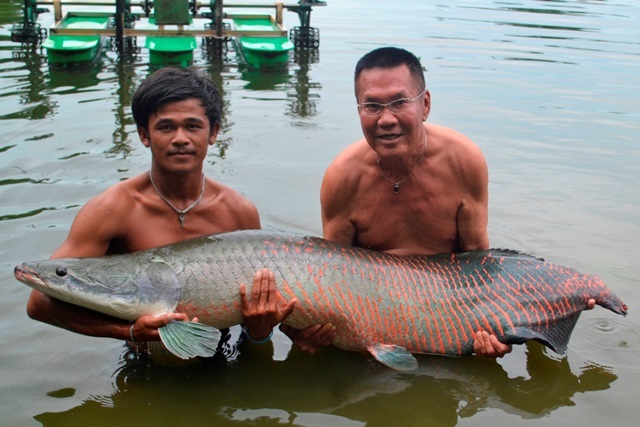 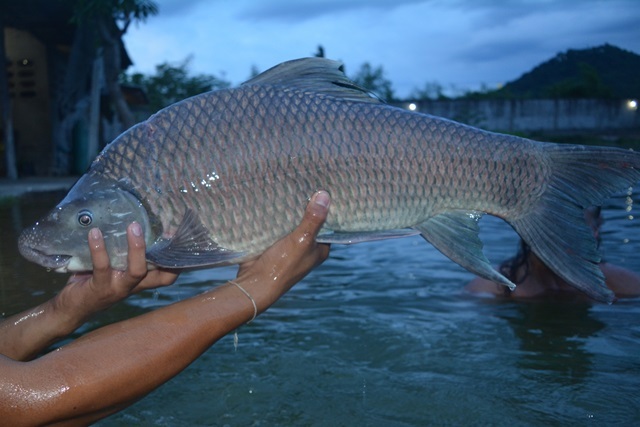 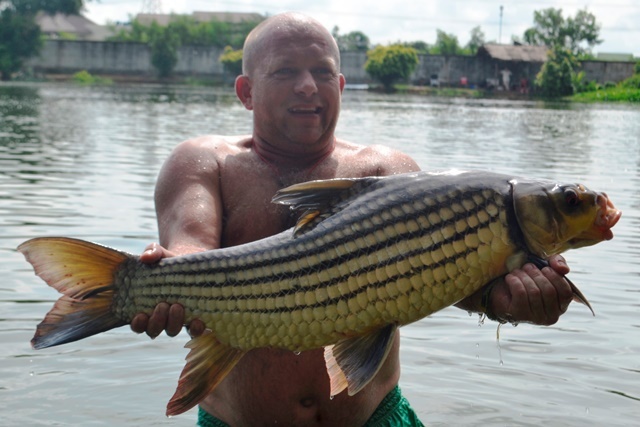 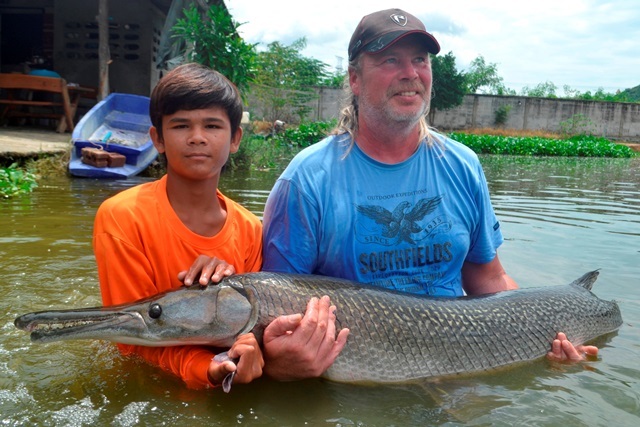 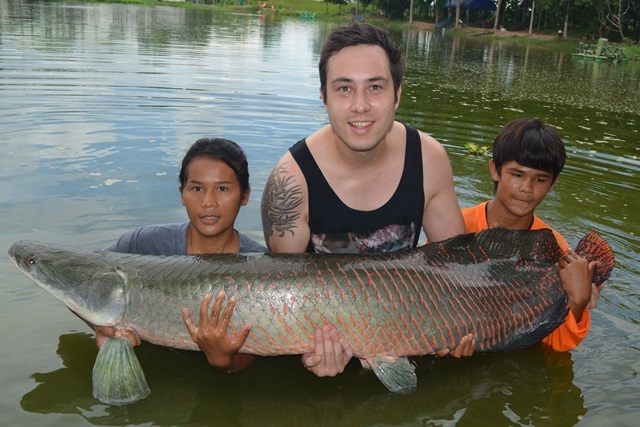 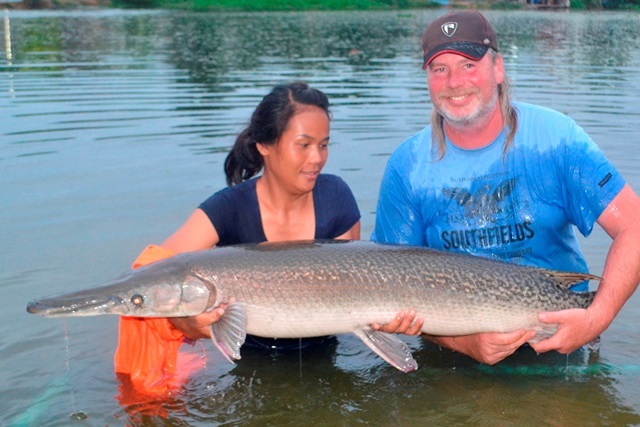 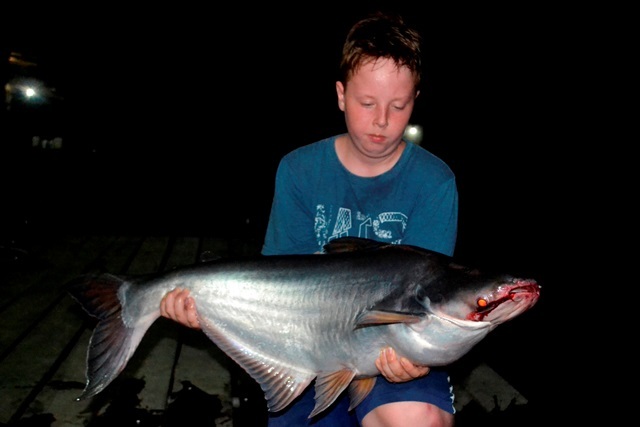 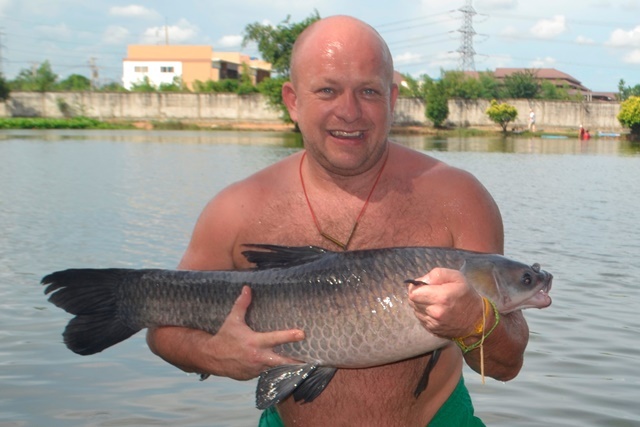 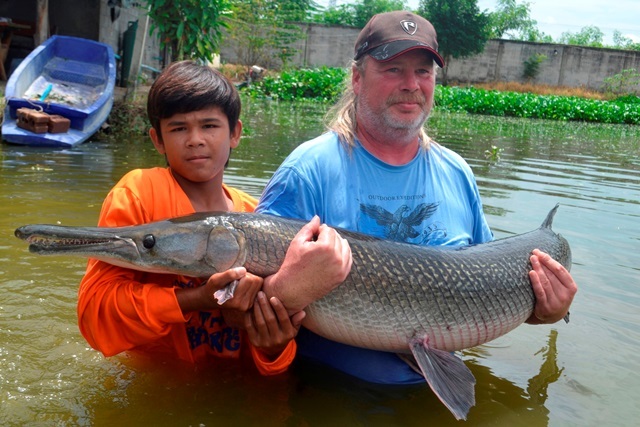 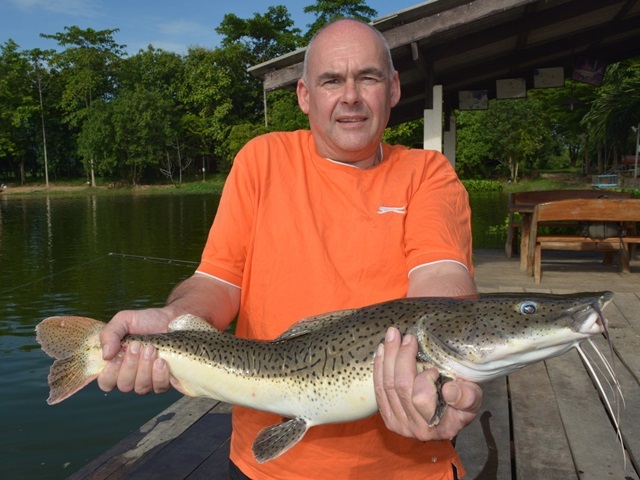 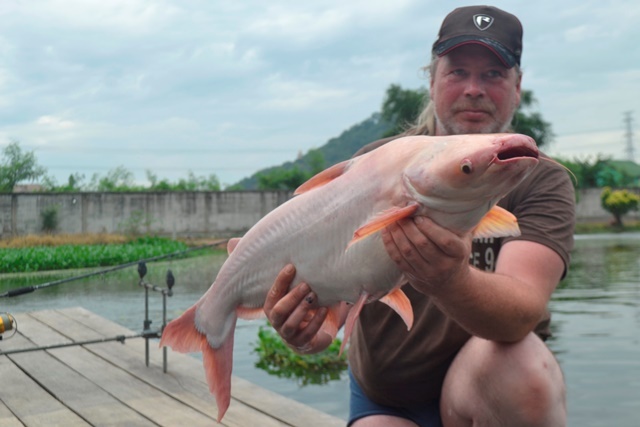 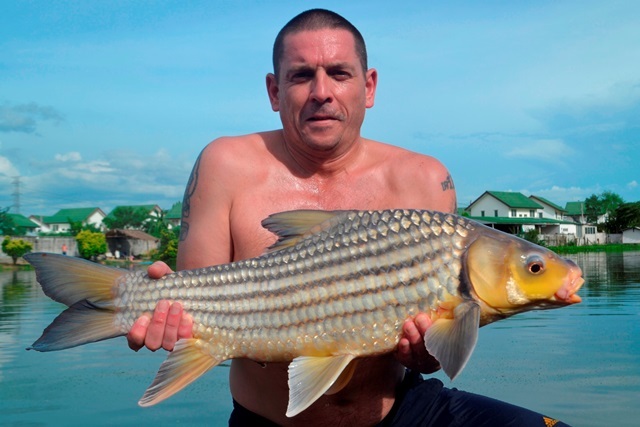 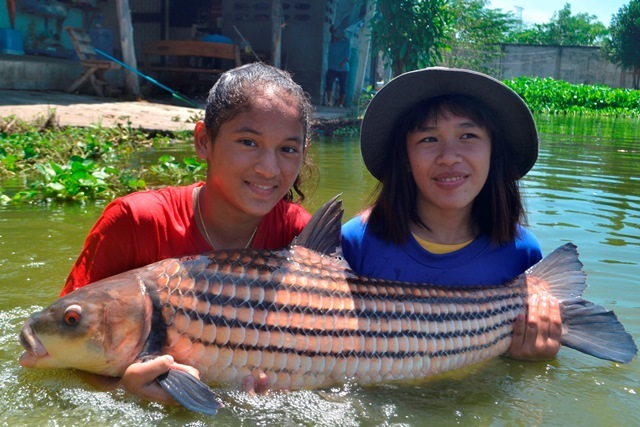 The guides also caught some monsters this month in particular Mekong catfish Siamese carp and alligator gar. 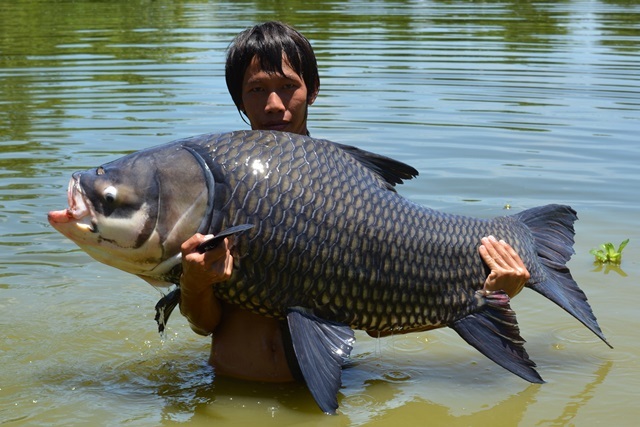 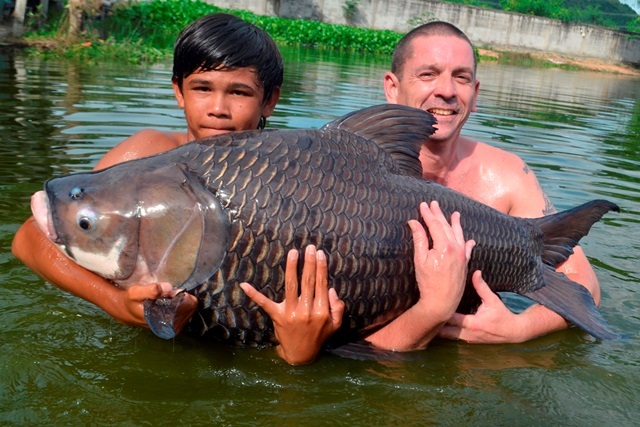 They also caught a number of Juliens golden price carp, tambaqui and a rare cowtail stingry. 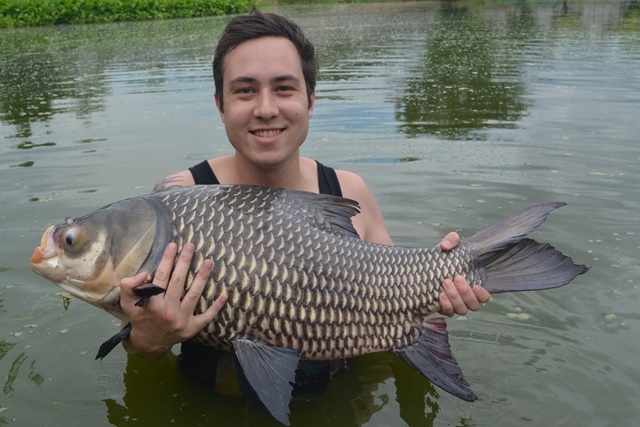 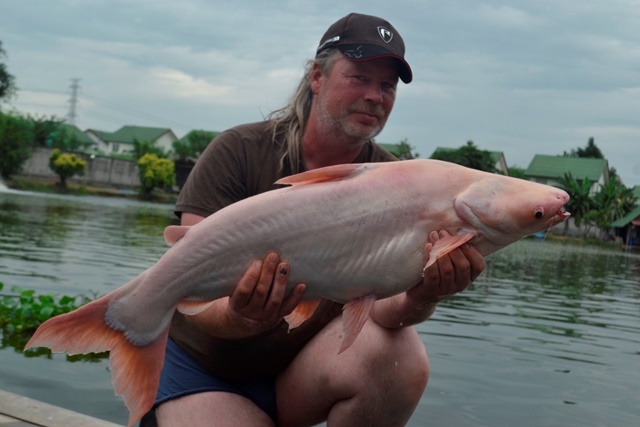 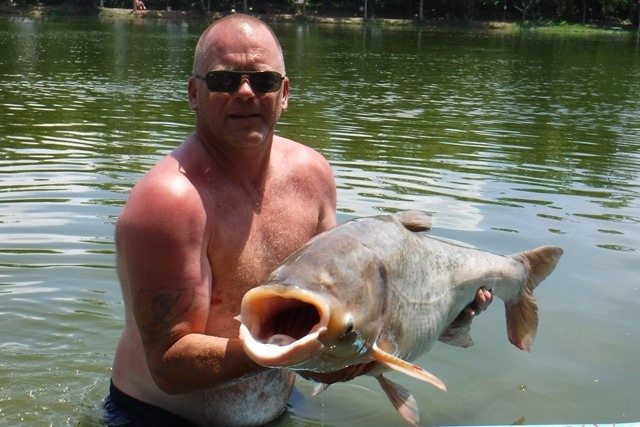 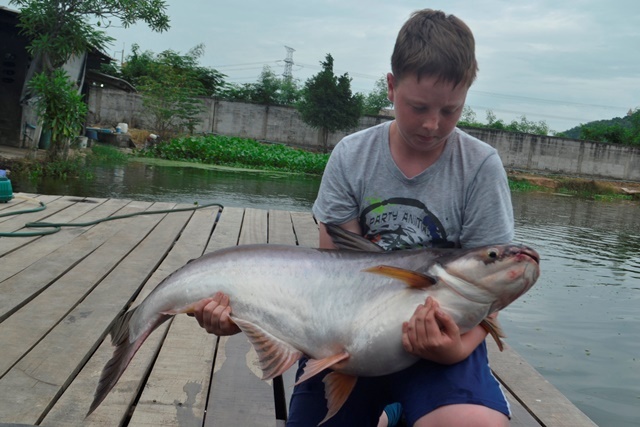 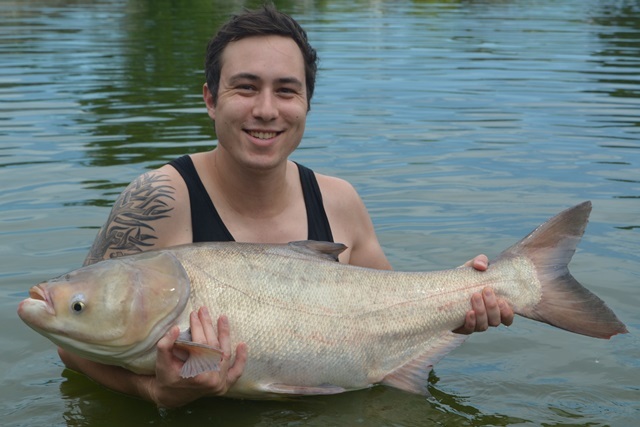 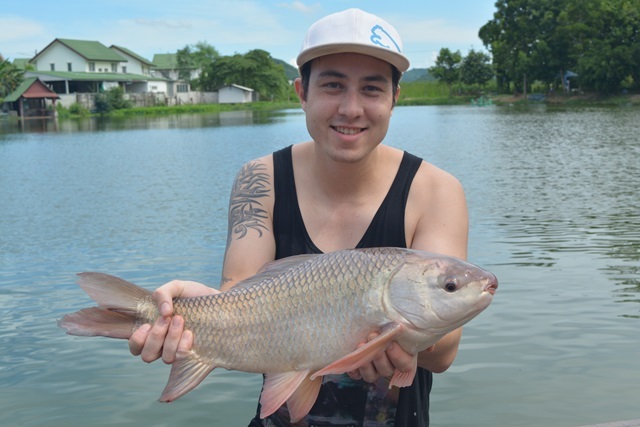 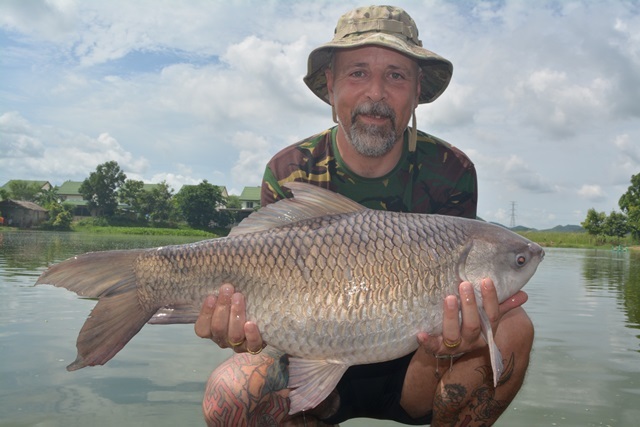 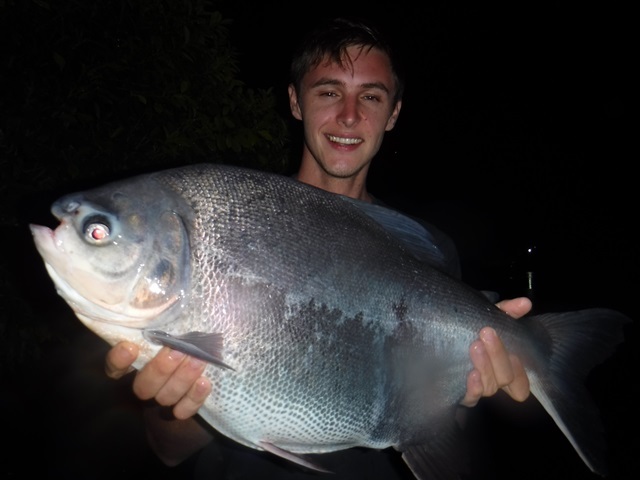 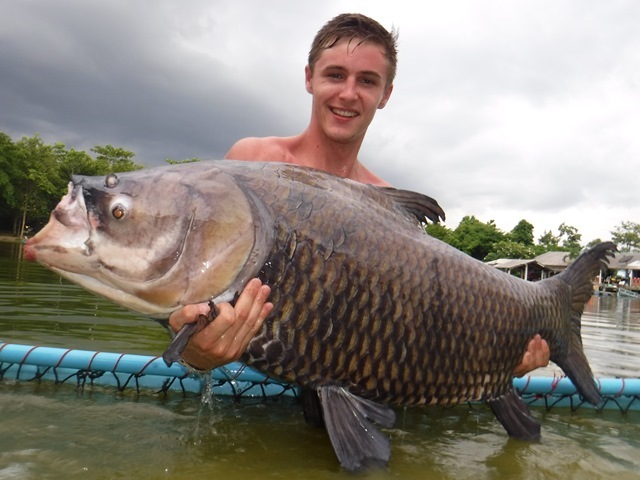 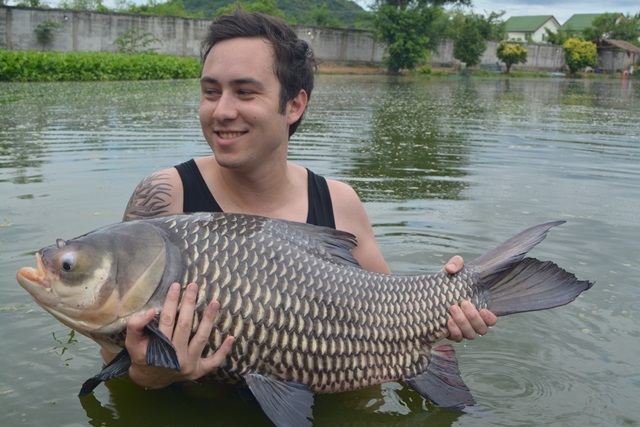 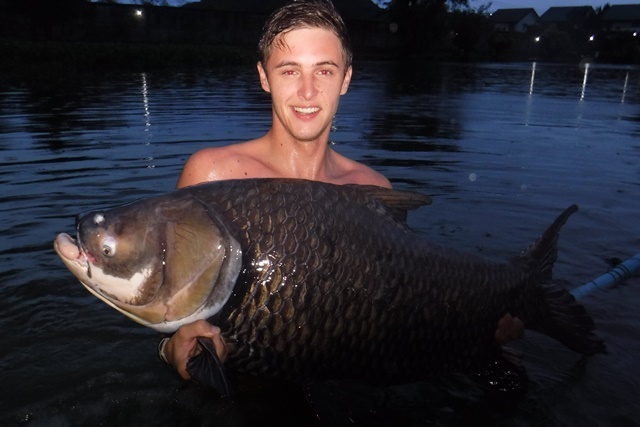 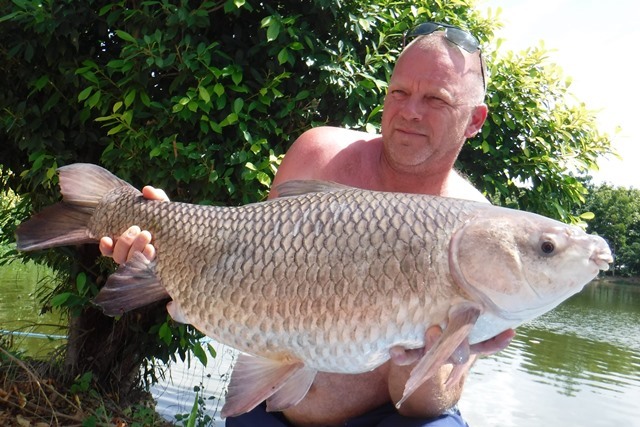 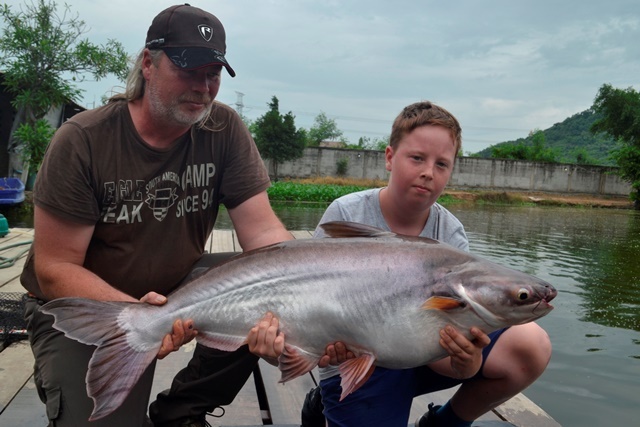 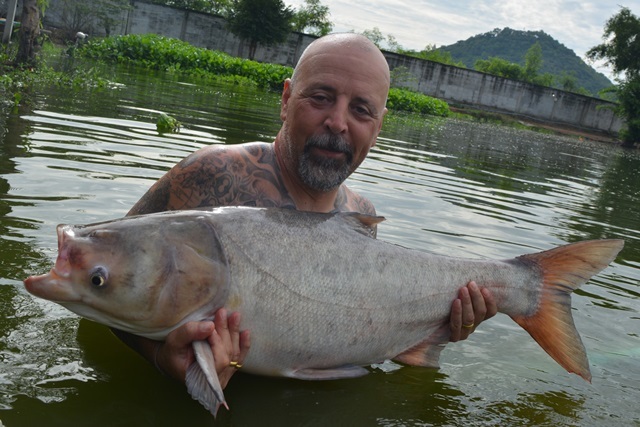 First timer Danny Cooper was also into some stunning fish that included a fantastic albino Chinese bighead carp as well as an ordinary Chinese bighead carp, he also caught Siamese carp, a very plump mollycot and Mekong catfish. 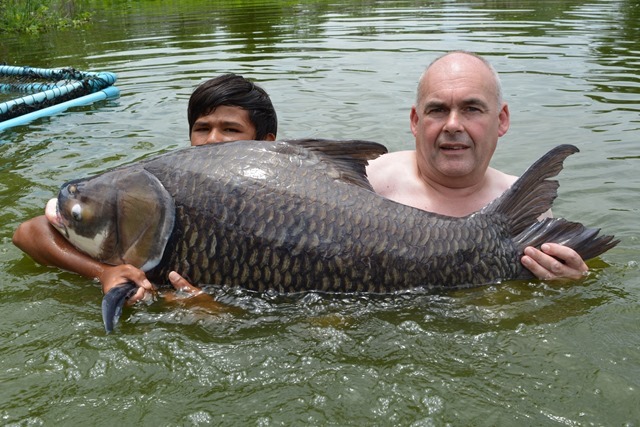 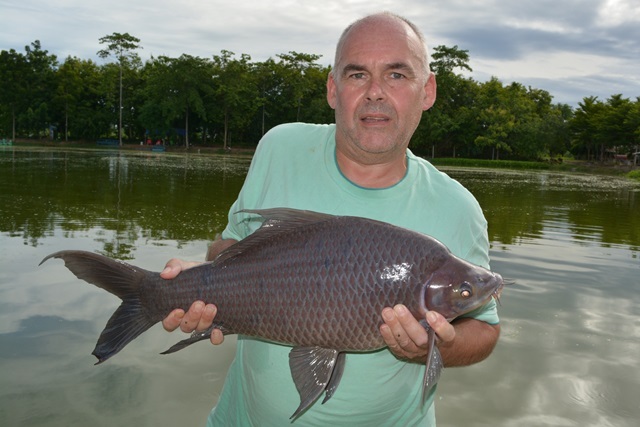 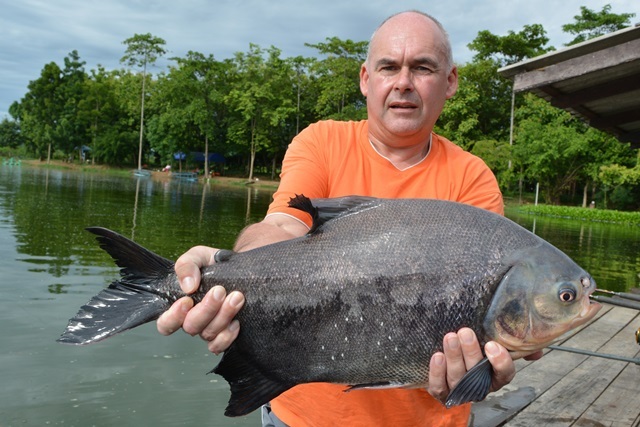 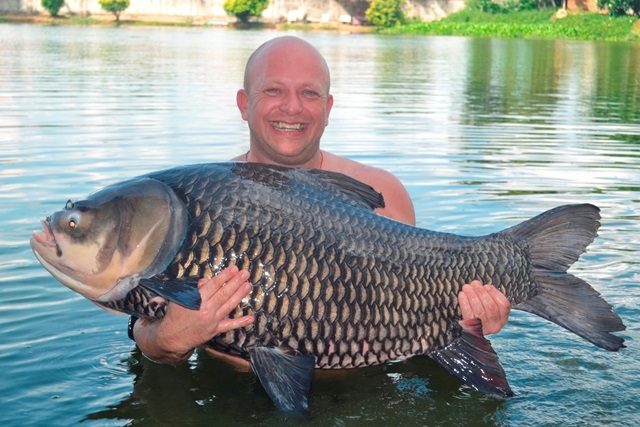 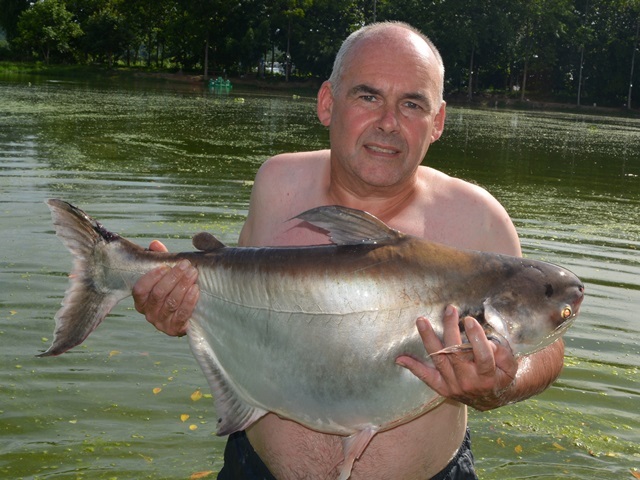 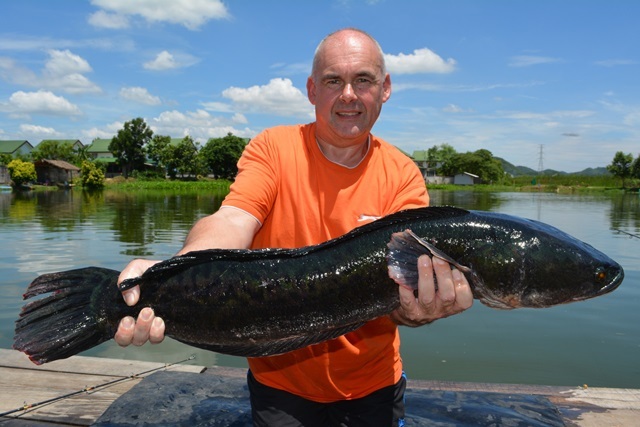 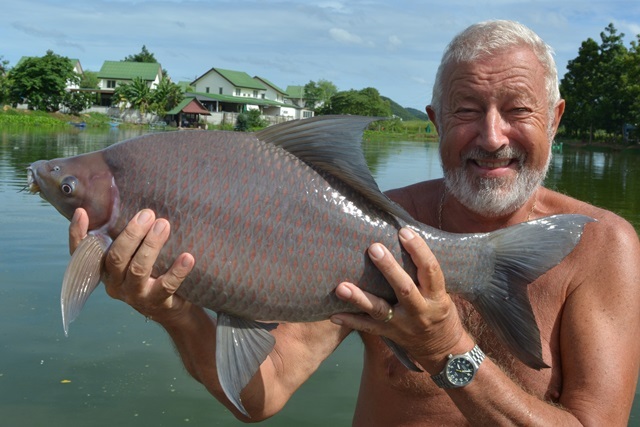 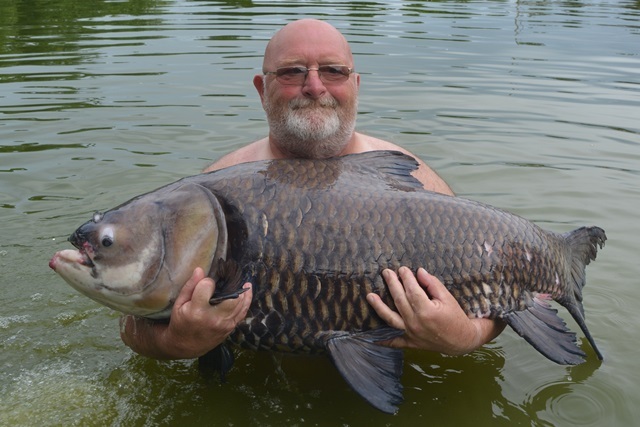 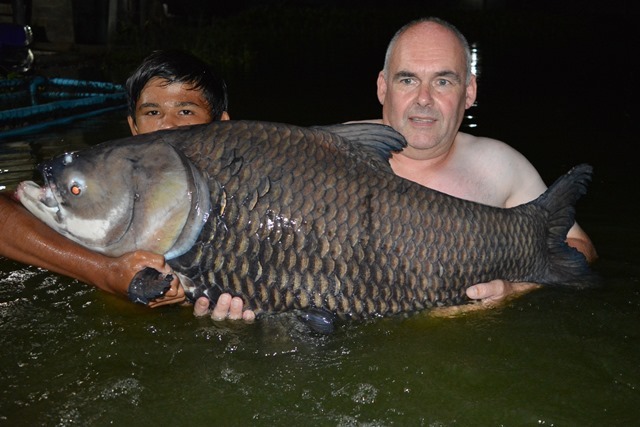 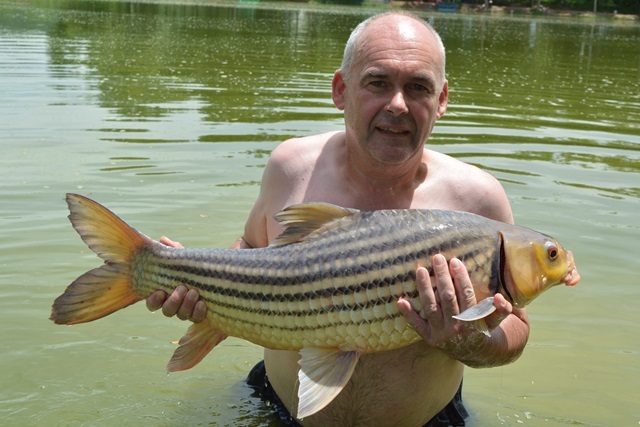 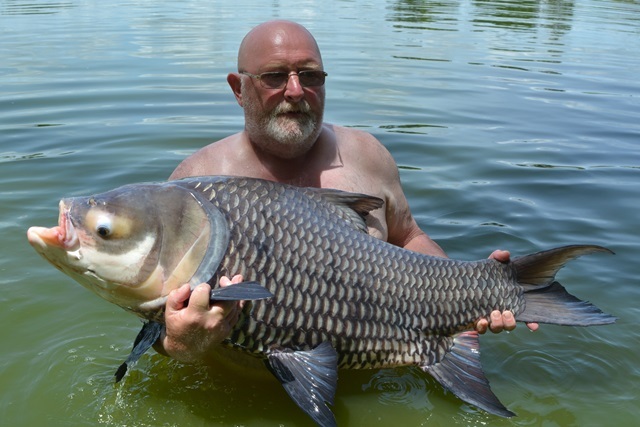 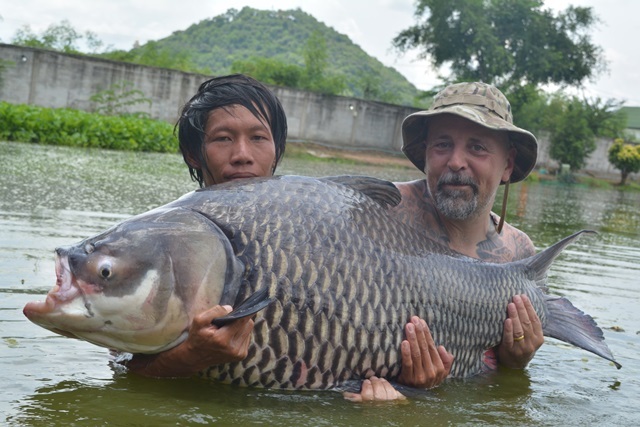 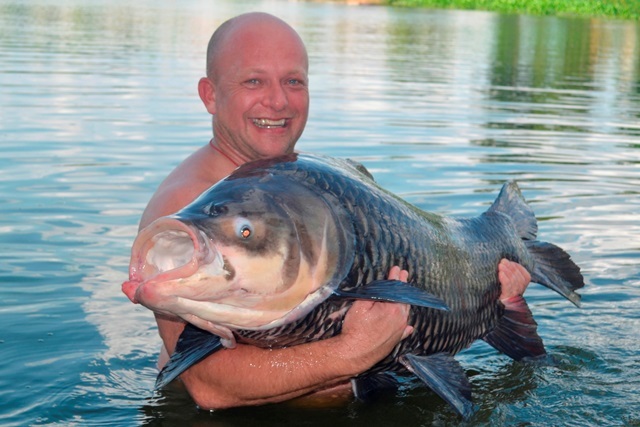 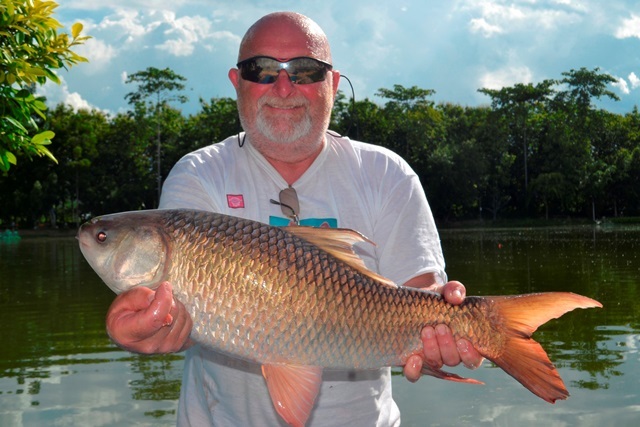 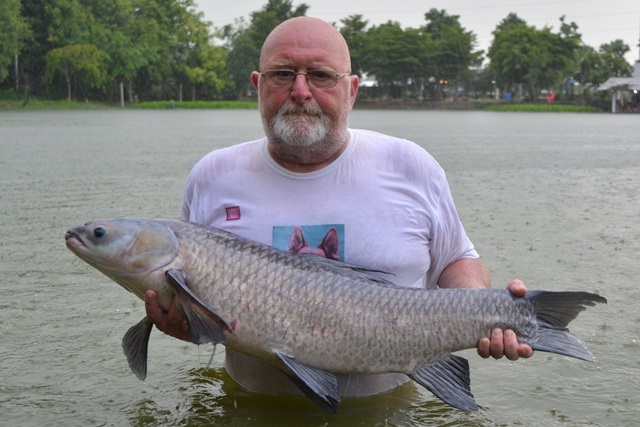 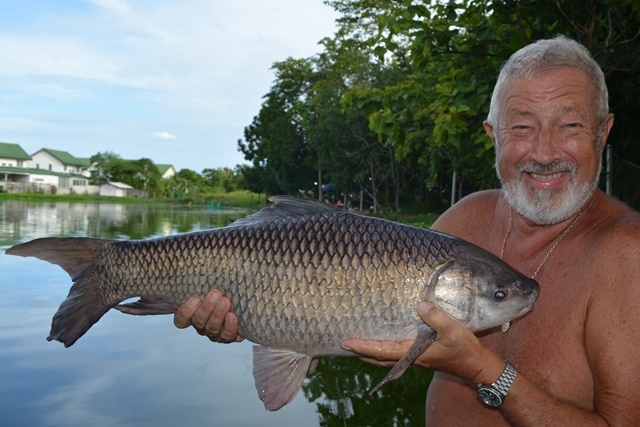 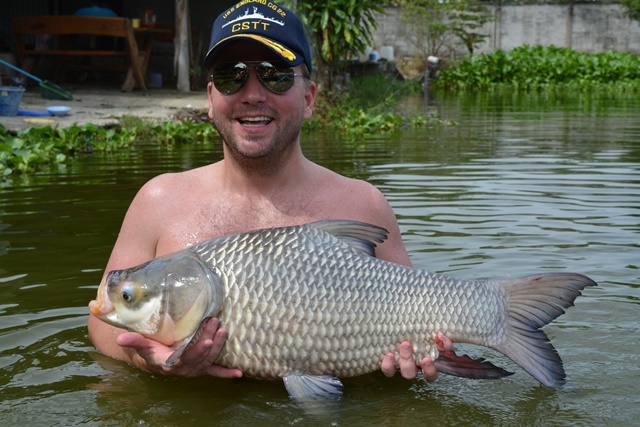 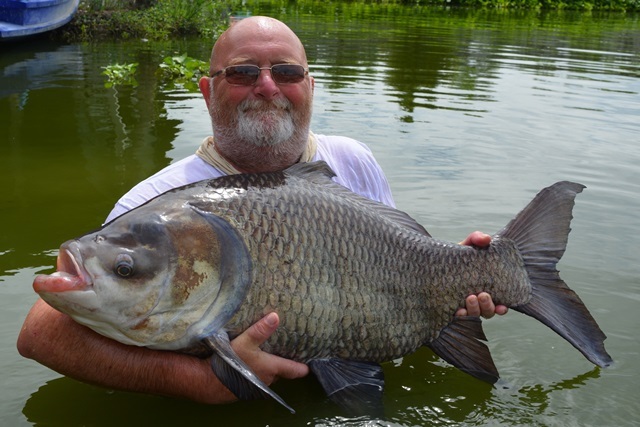 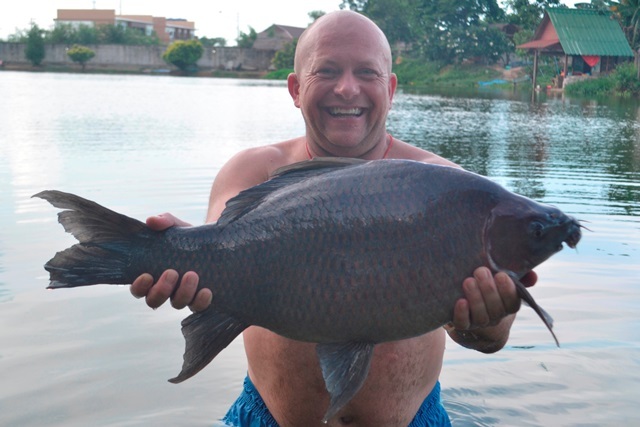 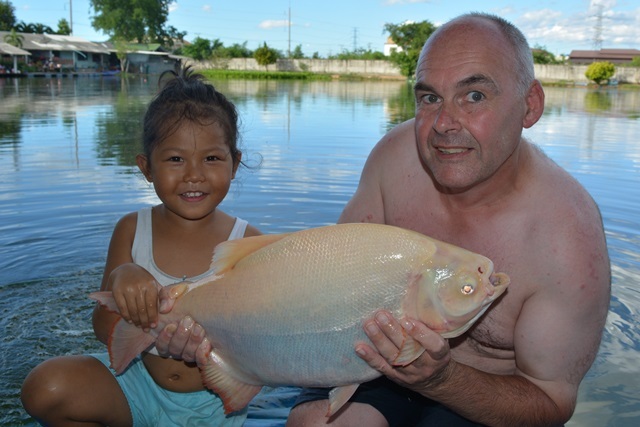 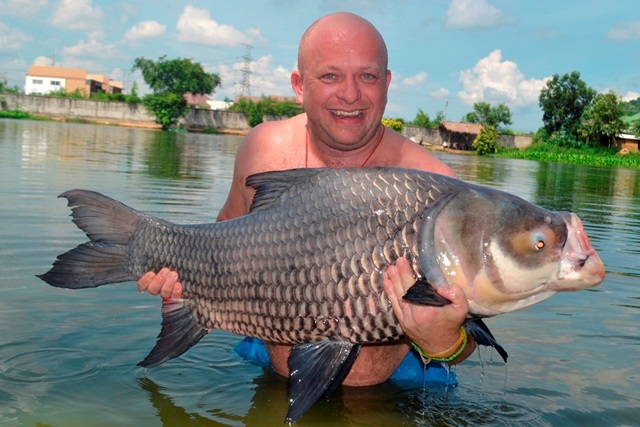 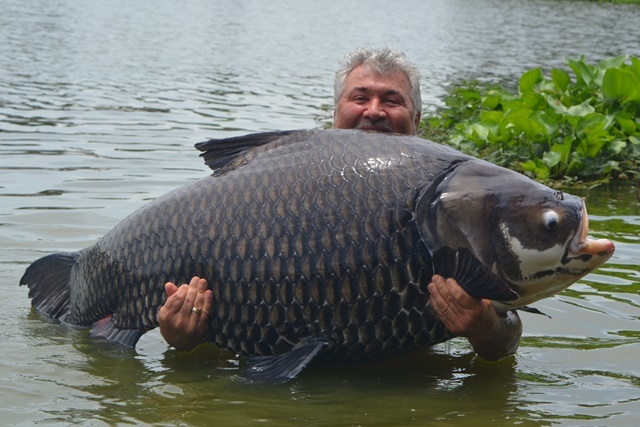 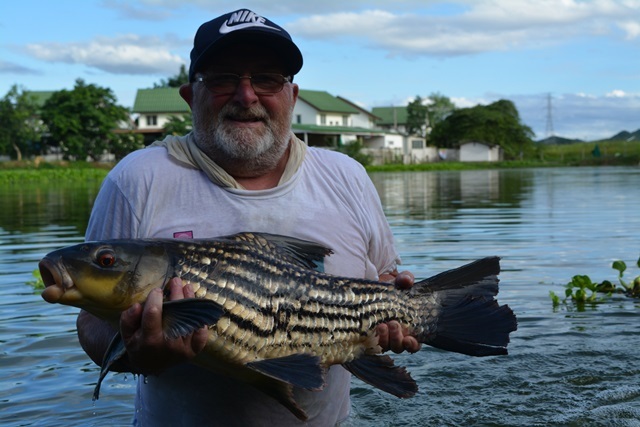 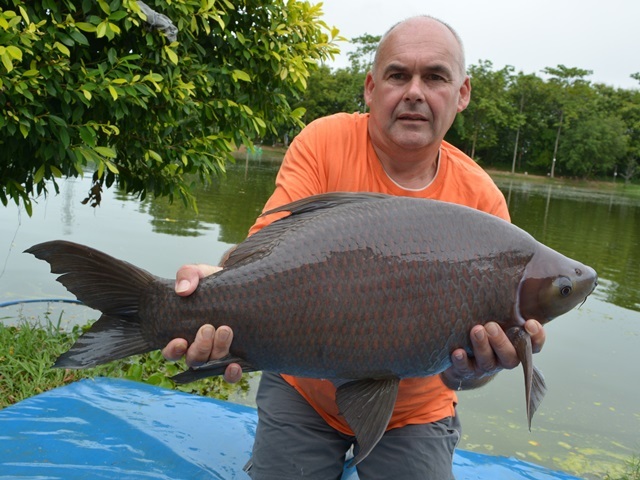 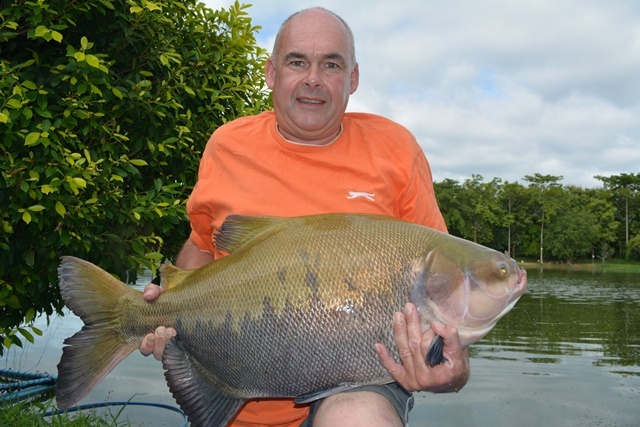 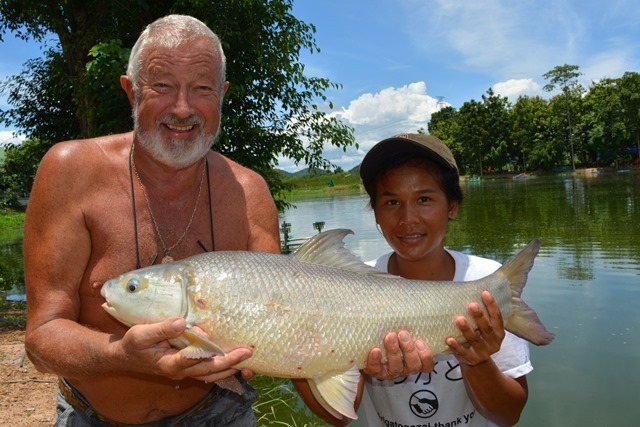 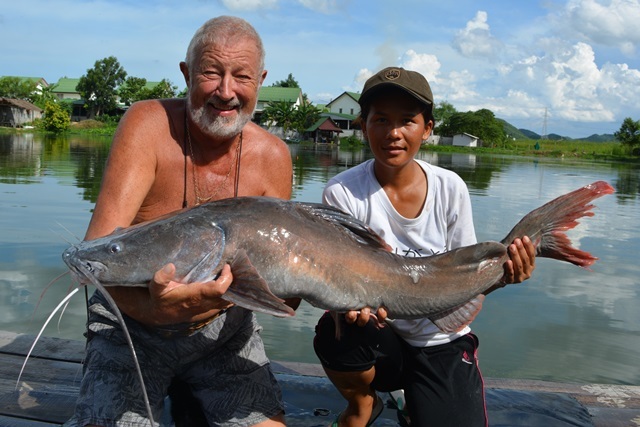 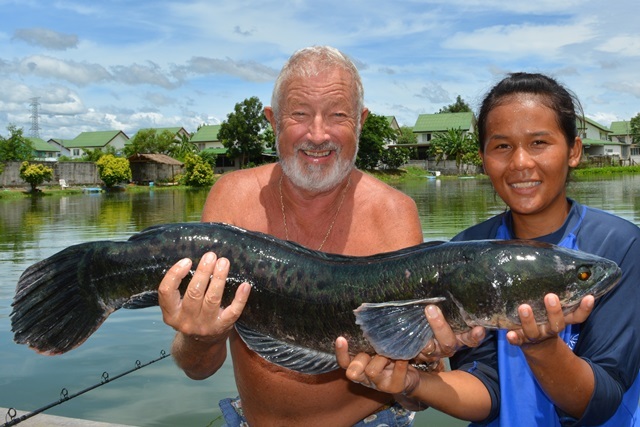 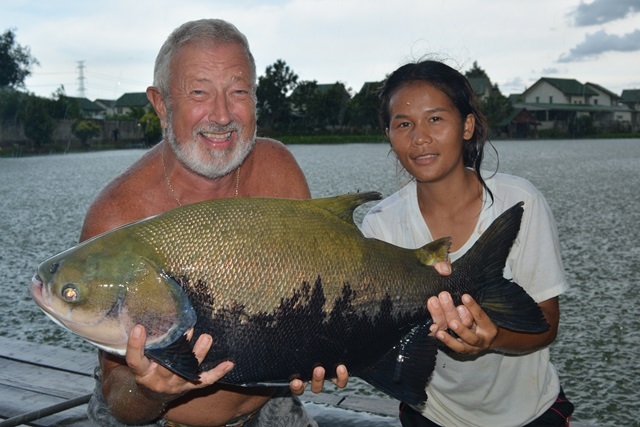 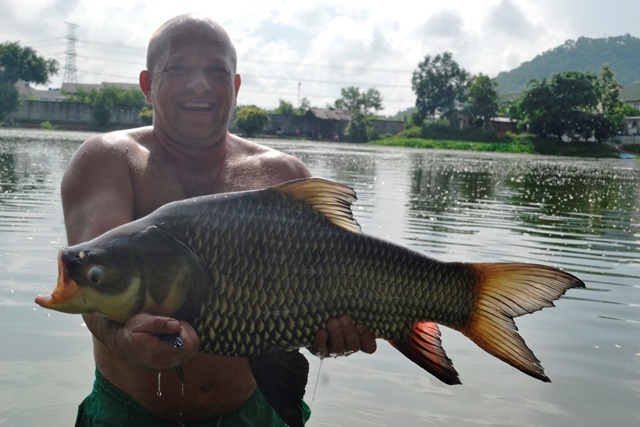 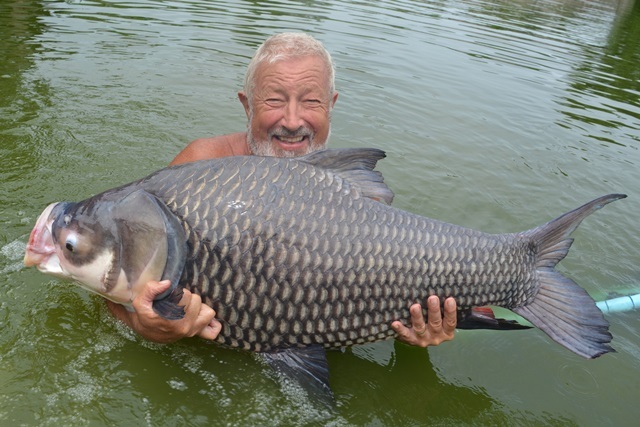 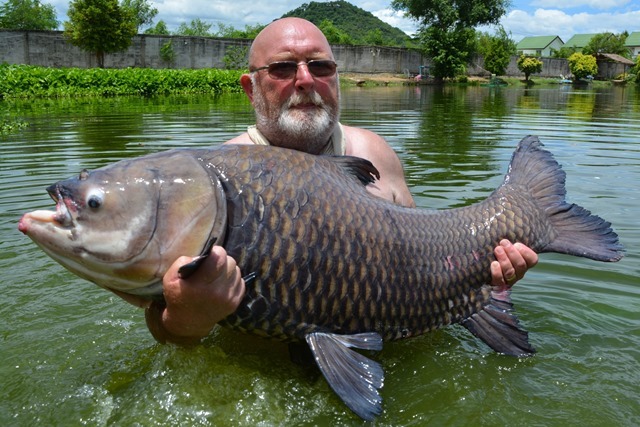 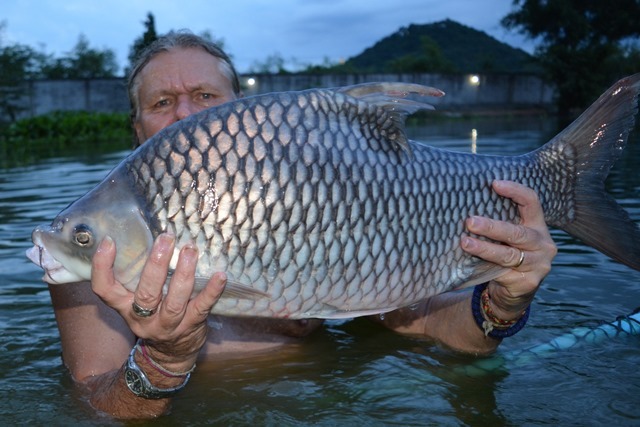 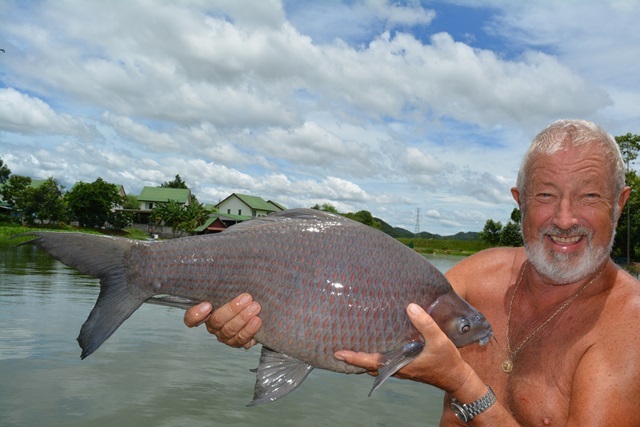 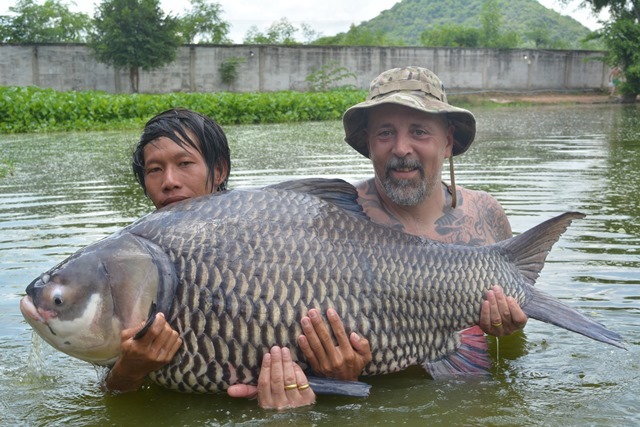 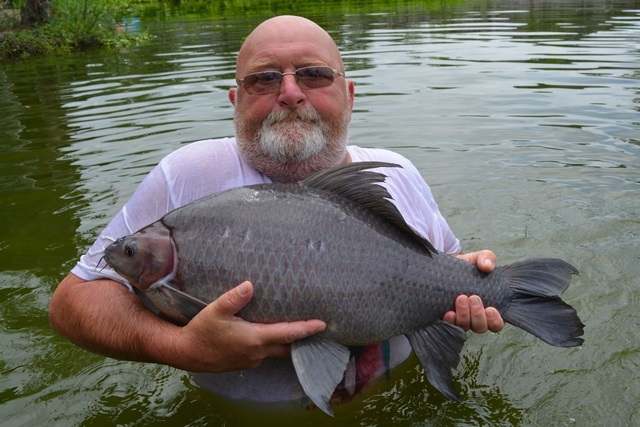 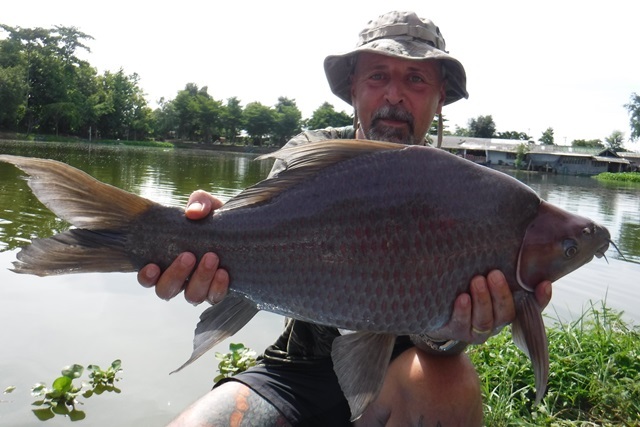 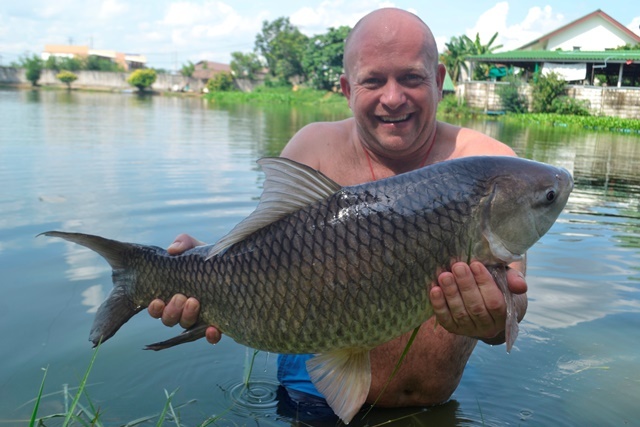 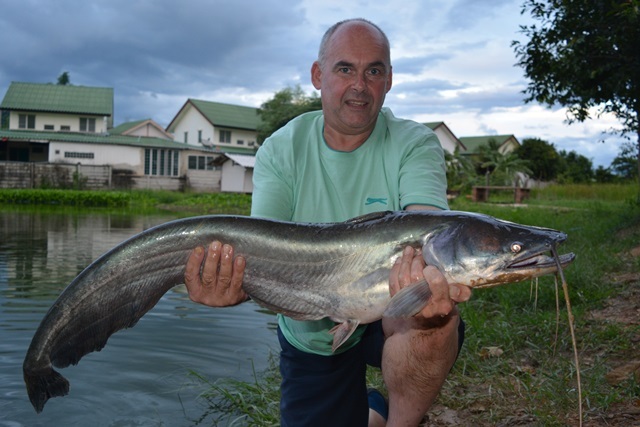 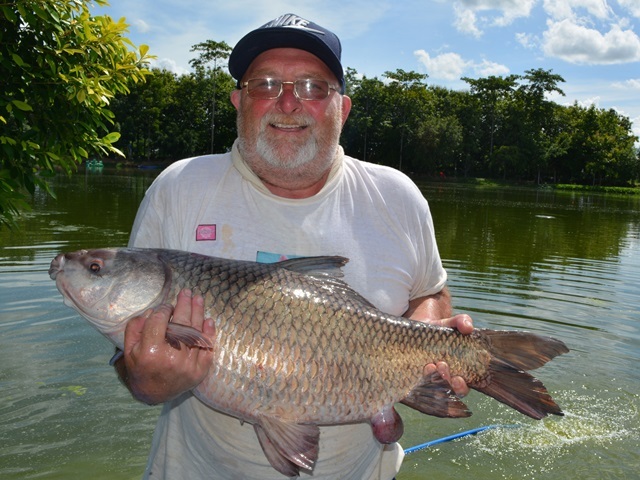 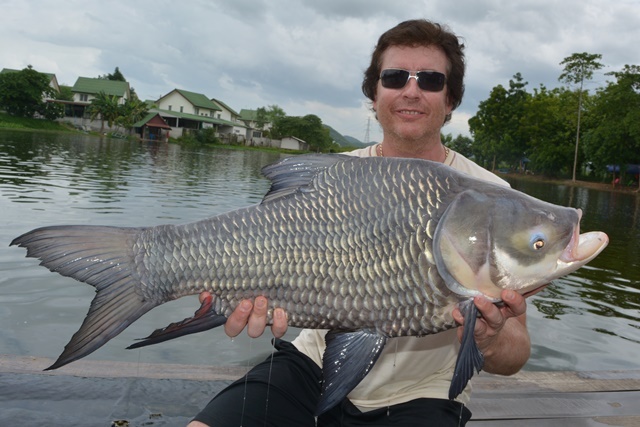 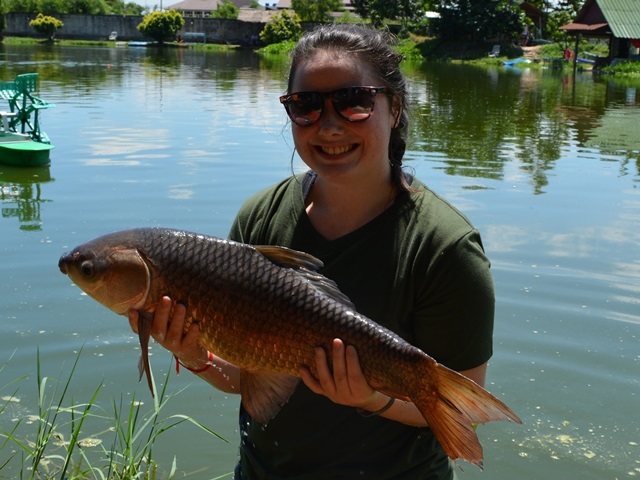 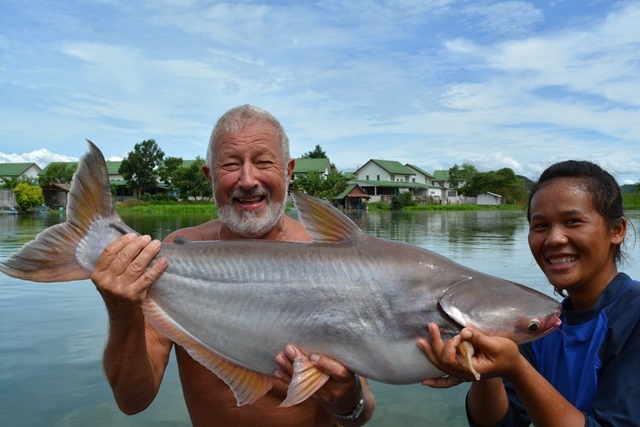 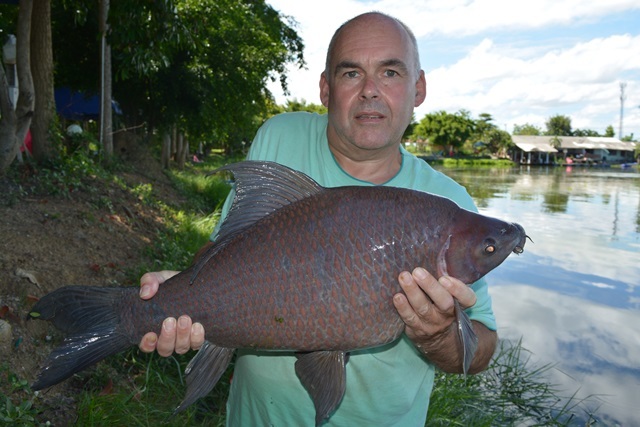 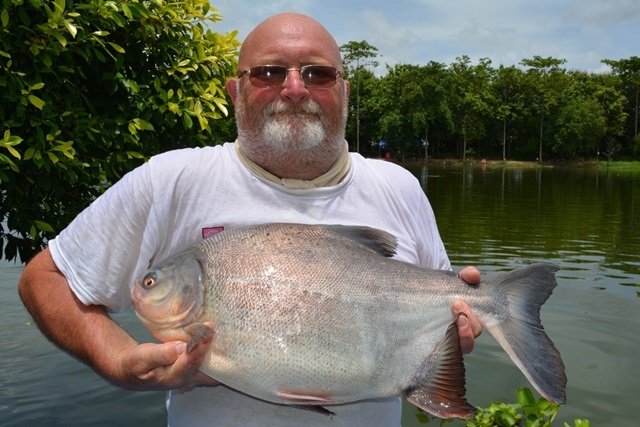 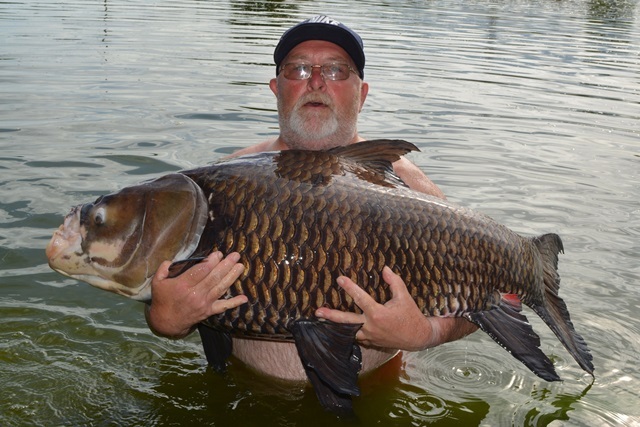 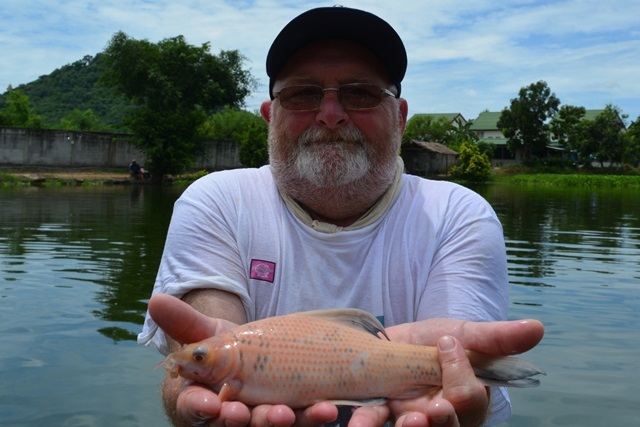 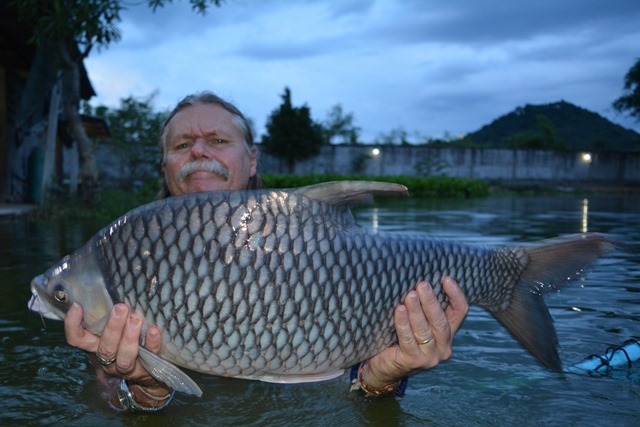 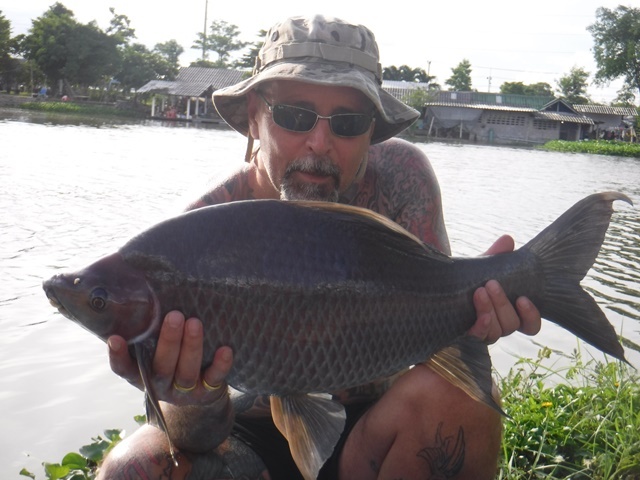 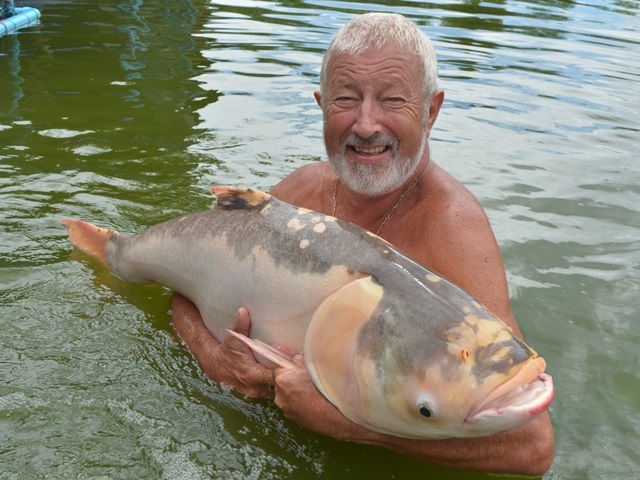 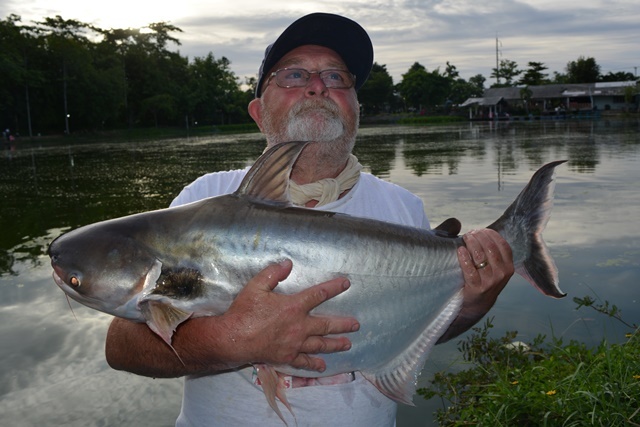 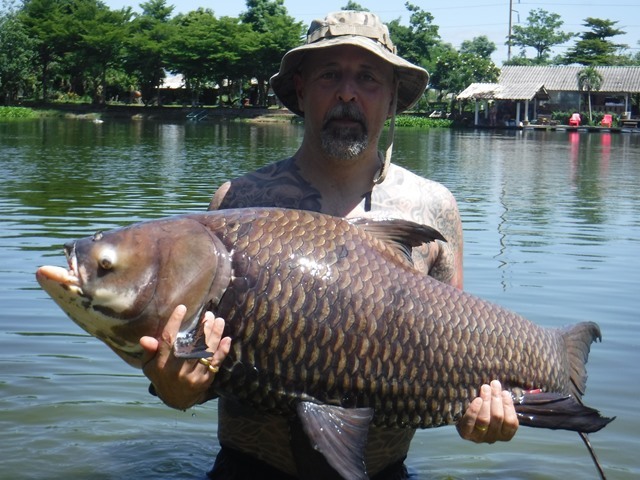 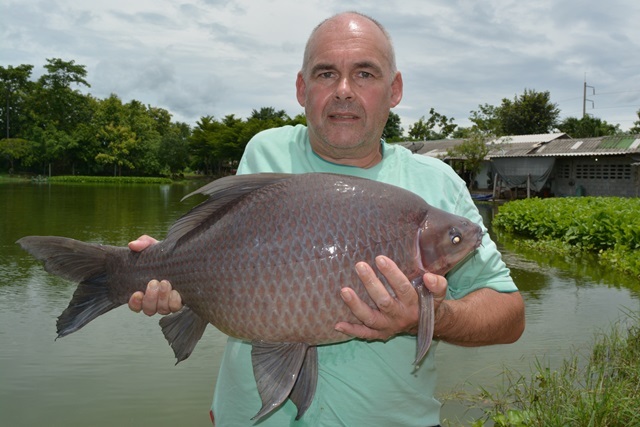 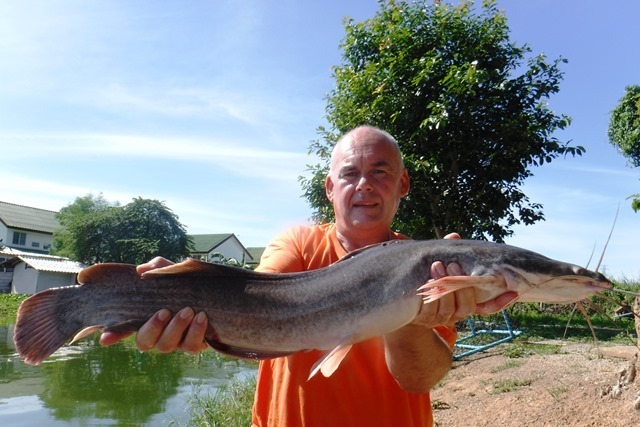 Paul Clapham was back for his annual visit catching some wonderful fish such as black shark minnow, Siamese carp, Chinese bighead carp and Mekong catfish. 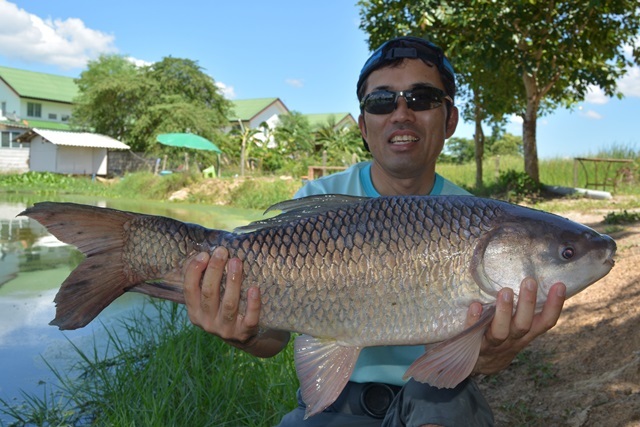 Tap brought along a Singaporean client for his first trip of the month. 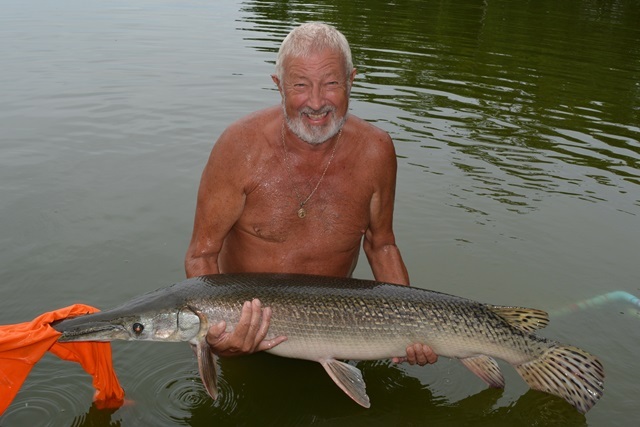 He had a great day catching Mekong catfish, vundu catfish, Atlantic tarpon, ripsaw catfish, albino pacu and an awesome alligator gar. 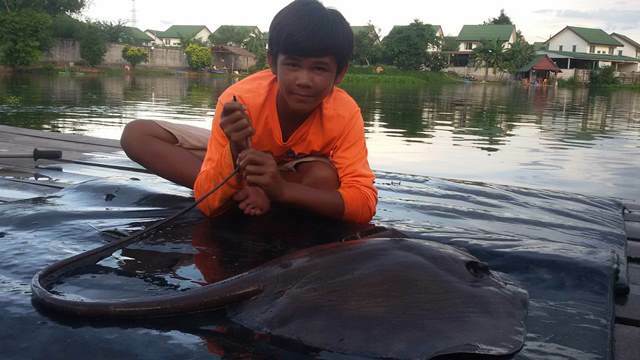 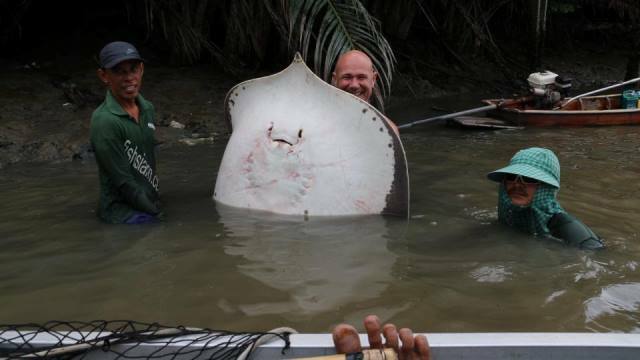 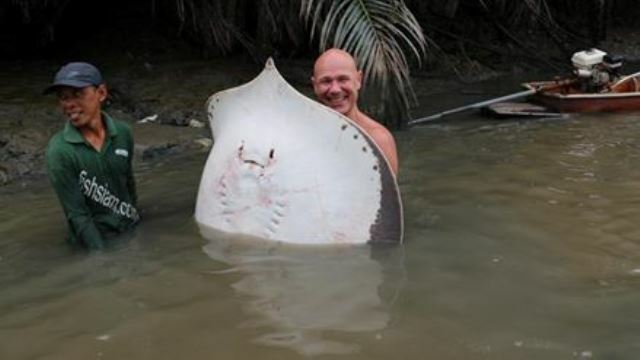 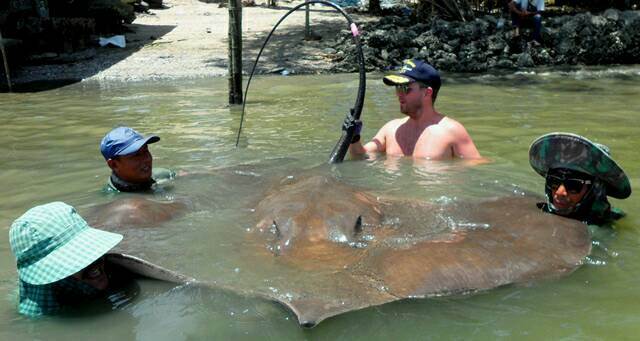 Regular Stephen Bell decided to try his hand at giant freshwater stingray fishing on the Mae Klong river and although he didn't land any monsters he did catch several small and medium sized ones. 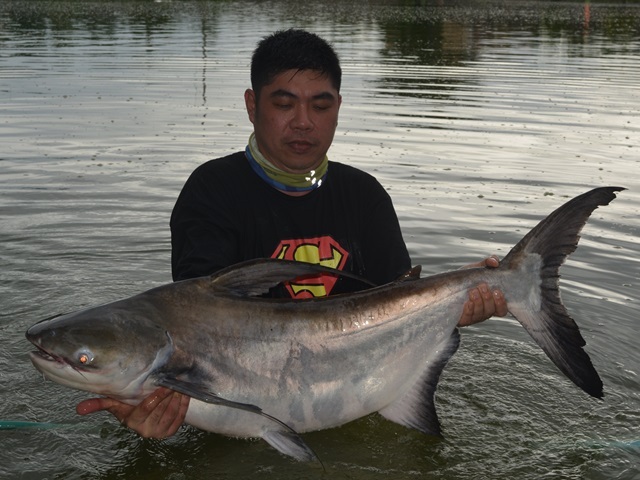 For Tap's third and final visit for the month he brought regular customer Cristofre Martin who caught some nice catches that included alligator gar, Mekong catfish, rohu, Amazon redtail Siamese carp and a stunning albino chao phraya catfish a new species for him. 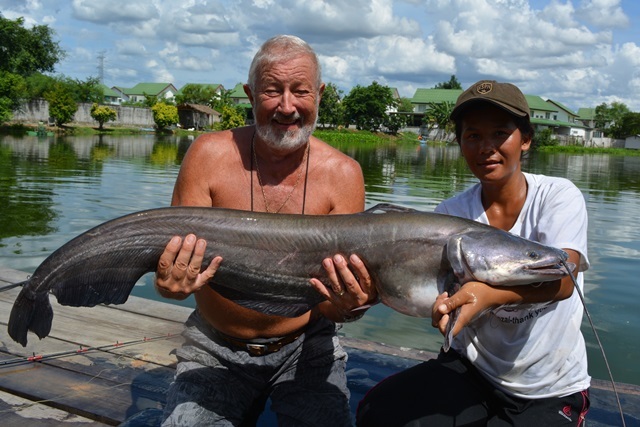 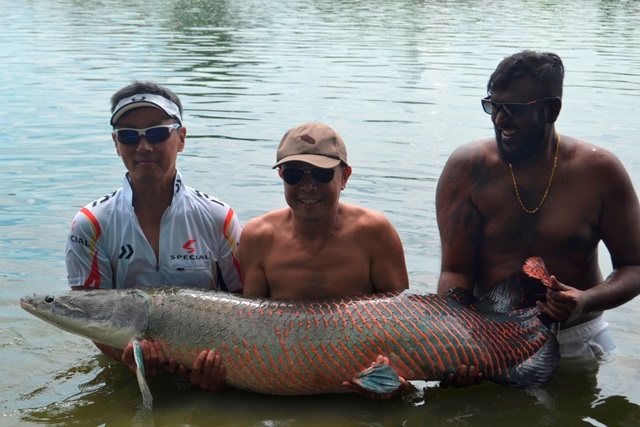 A couple of passing angling enthusiasts dropped in and successfully caught arapaima, Mekong catfish and clown featherback. 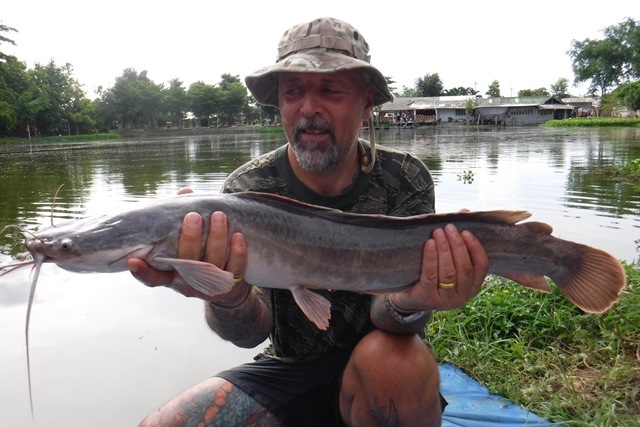 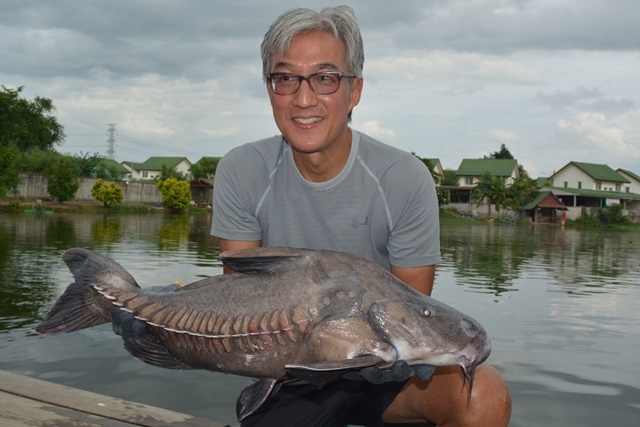 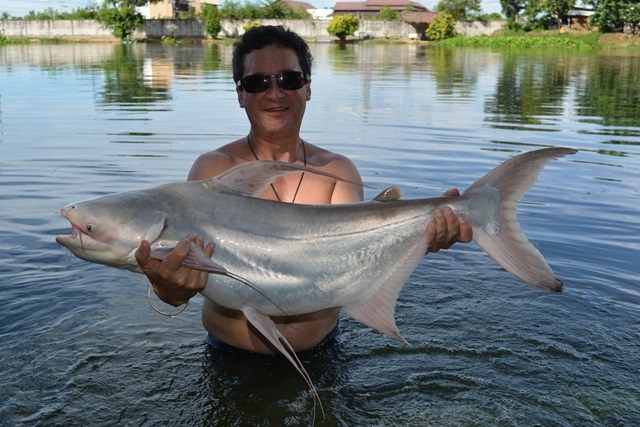 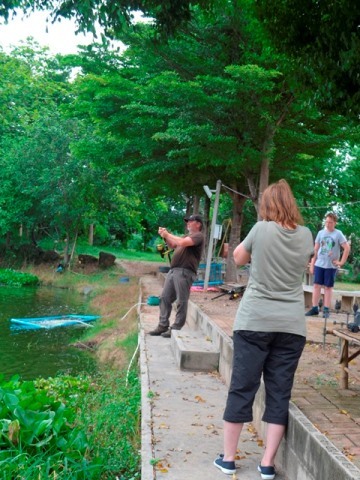 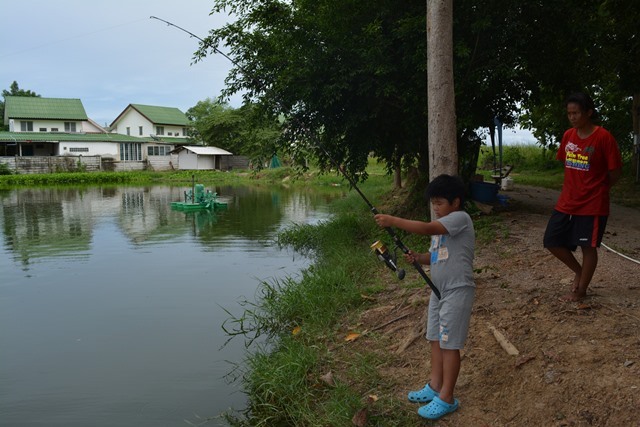 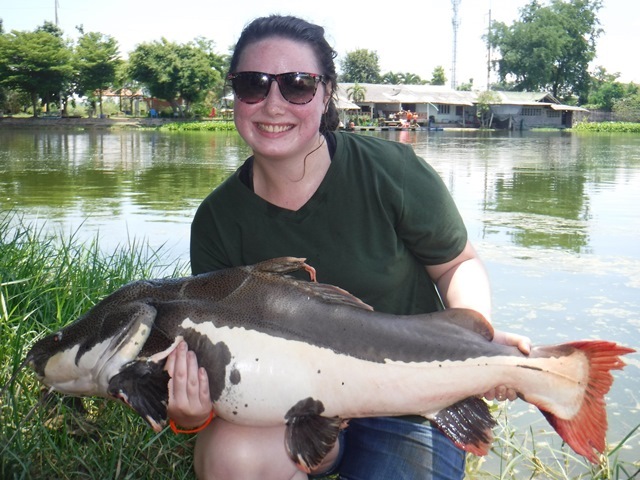 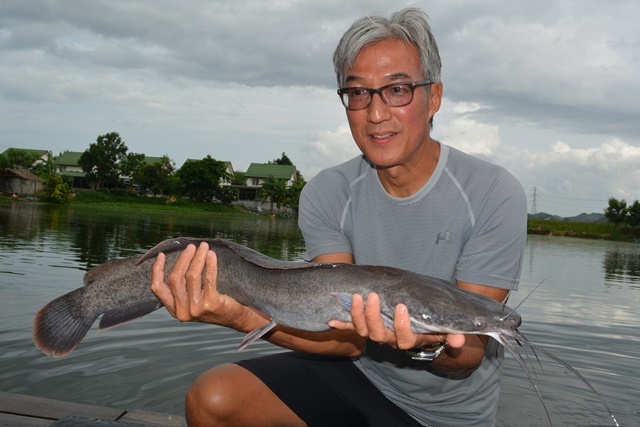 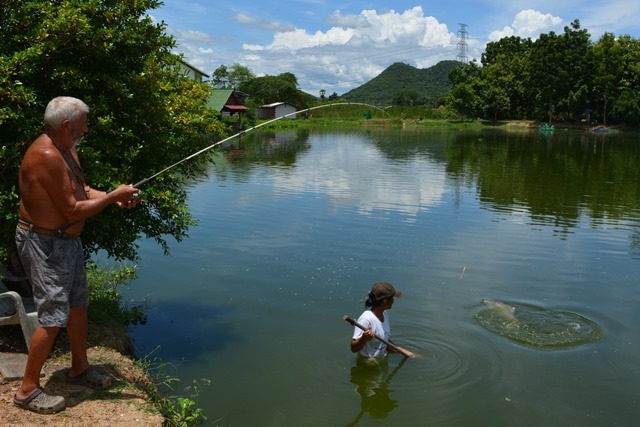 Tap of Bangkok Fishing Guide Service first visit of the month resulted in his customers catching arapaima, tambaqui and African walking catfish. 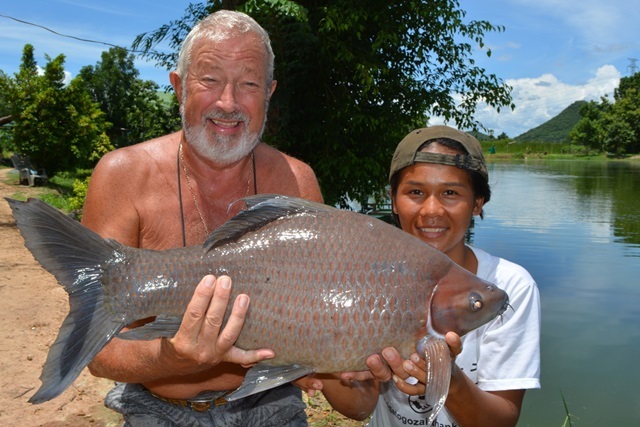 Paul Farris returned after a three year absence and caught some new species for him such as tambaqui as well as both giant and elephant ear gourami. 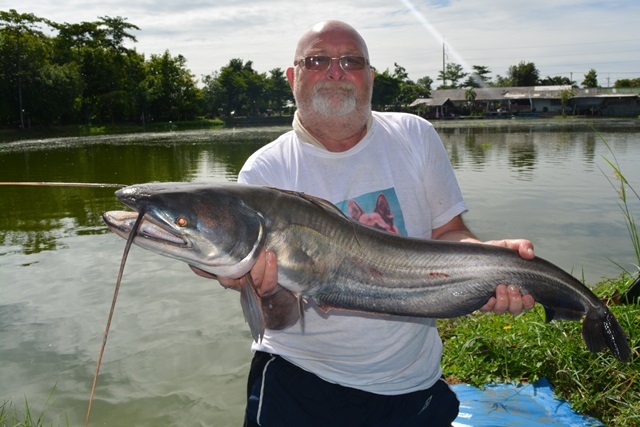 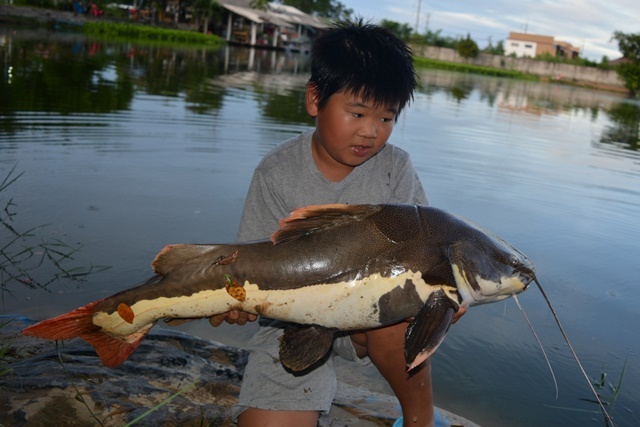 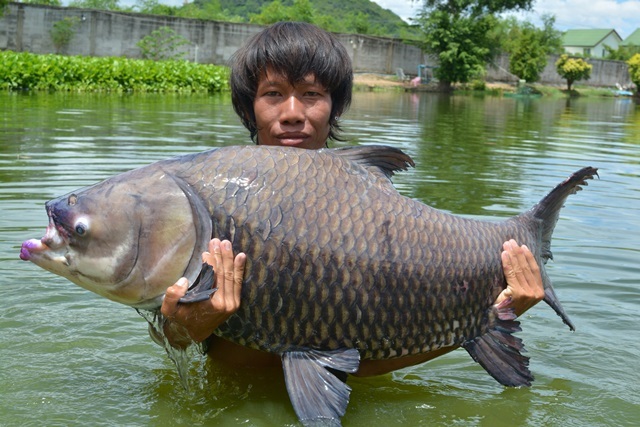 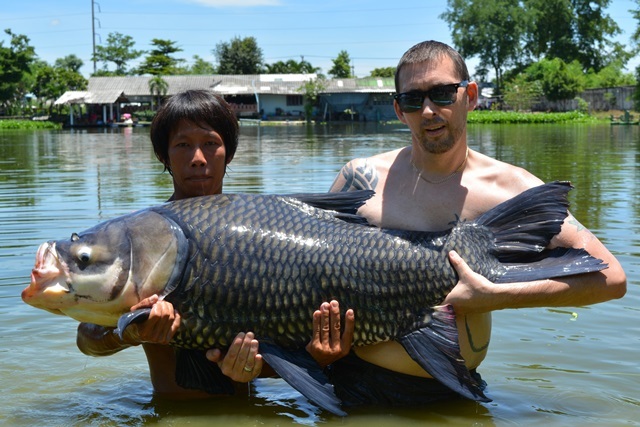 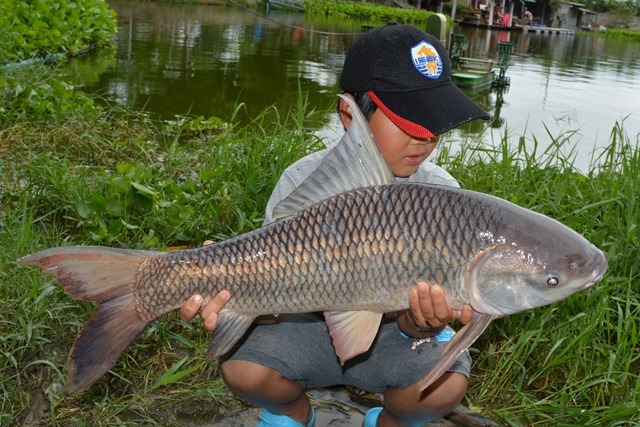 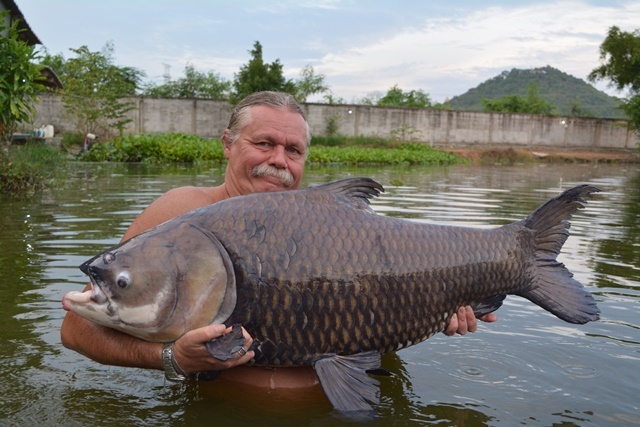 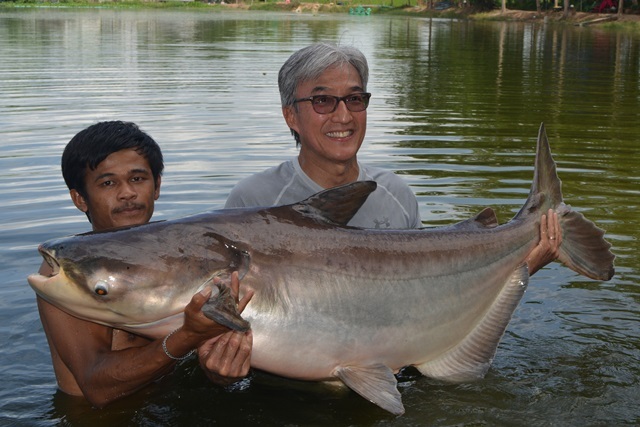 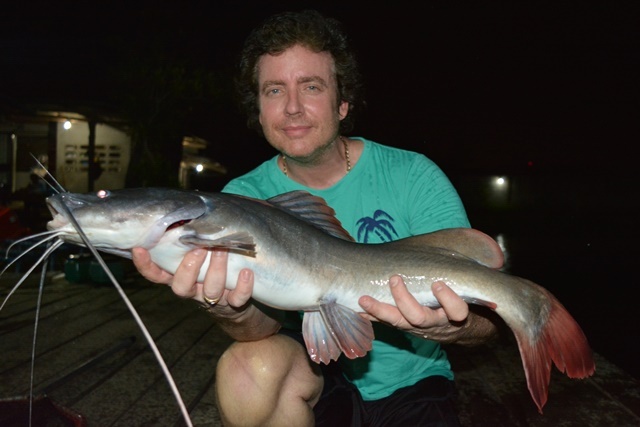 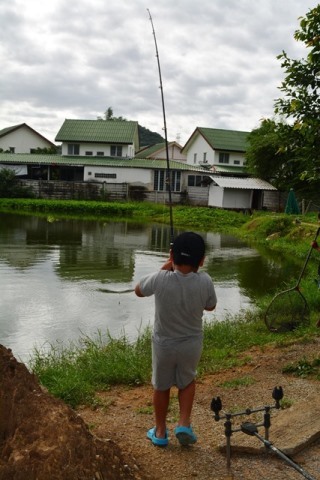 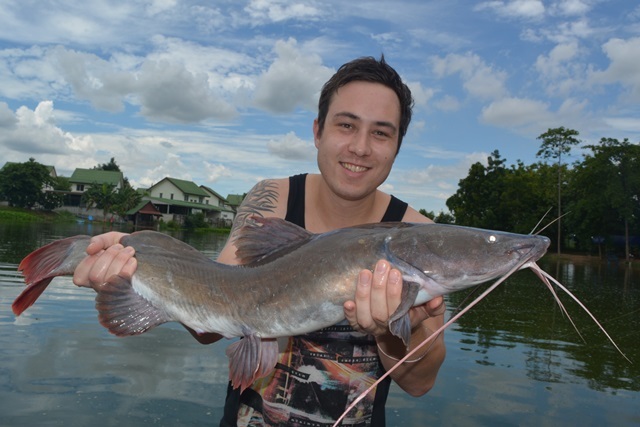 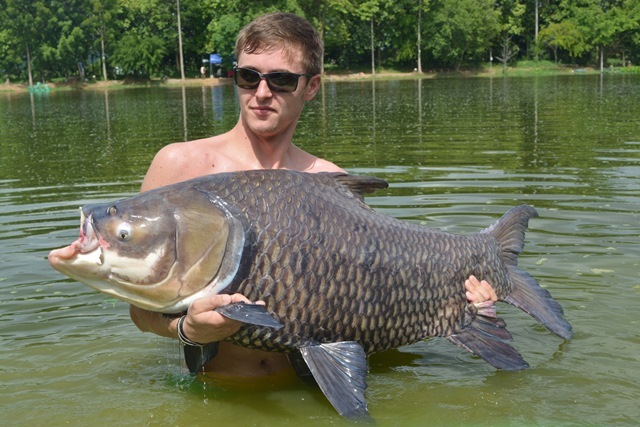 He also caught Siamese carp, Asian redtail catfish, catfish shark and a pb Mekong catfish. 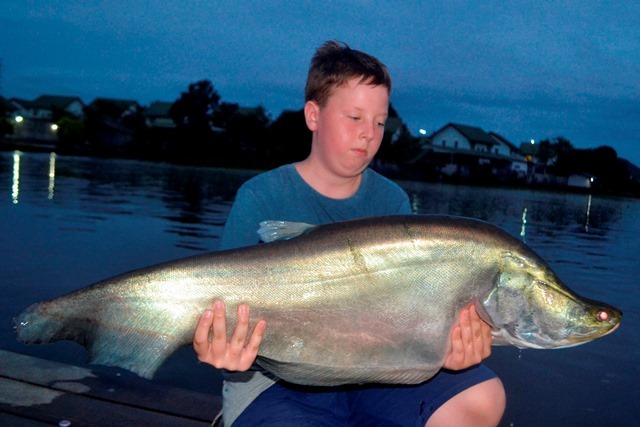 Michae Lem made his first visit to Palm Tree catching a nicely marked tambaqui. 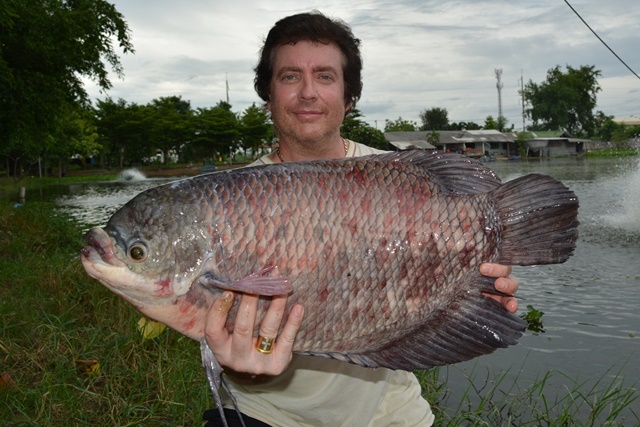 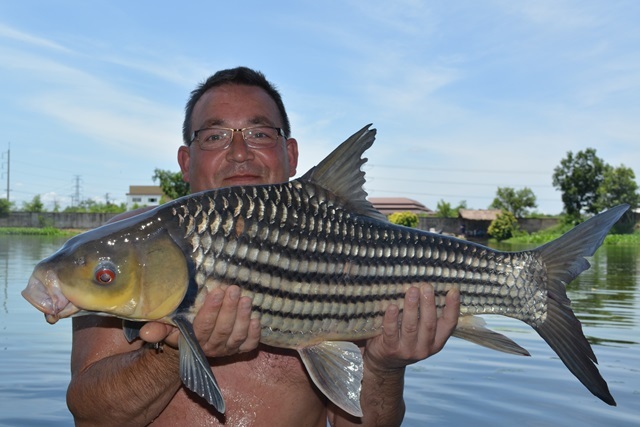 Singapore John came with a Malaysian customer and caught chao phraya and rohu.